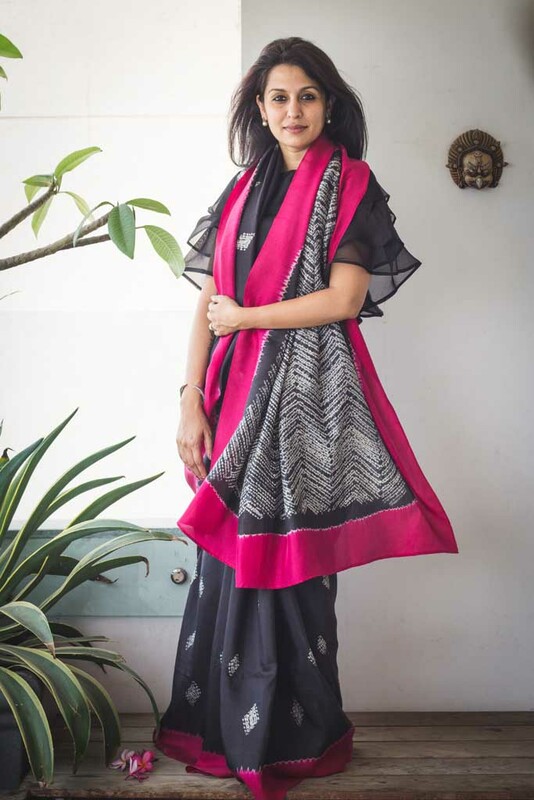 The Crafts Council of India presents its 33rd Edition of Textiles & Accessories – a dazzling range of specially designed saris, dupattas, fabric and stoles created by twenty one leading designers of the country working with rooted textile traditions as a basis of brilliant experimentation. 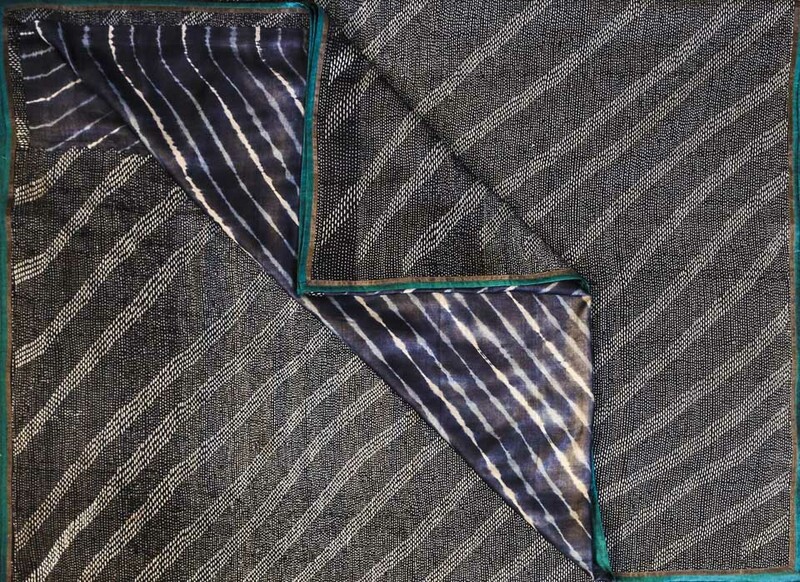 This exclusive and rare textile collection is the result of designer master weaves and artisan interface. 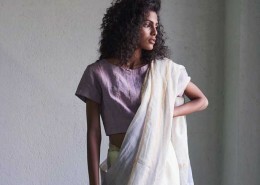 It unfolds the evolving face of sari and fabric today. 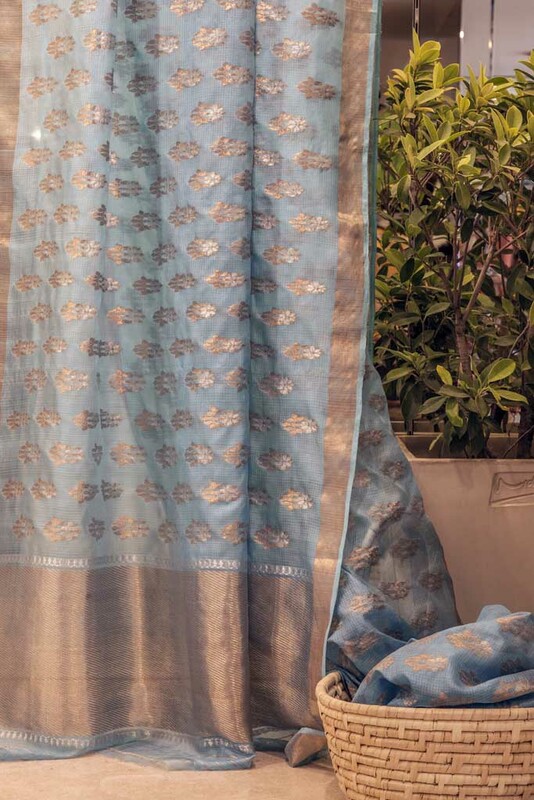 From bespoke heirloom luxury saris woven with real silver, re envisioned and revisited Benares heritage saris, re imagined rare old kotas, paithanis and himroos, chanderis, maheshwaris and hand-woven silks to a wonderful profusion of cool, mesmerising khadi, linen and jute saris and fabric. 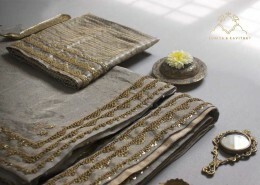 The language gives each sari, dupatta and fabric a magical touch, be it in the tweak of a weave or in surface ornamentation mingling handblock prints with embroidery, ancient Pichwai painting on the ‘pallu’, florals diffused to present fairyland gardens, exciting new merging and shading of color palettes or a revival of ancient weaves and motifs in contemporary formats. 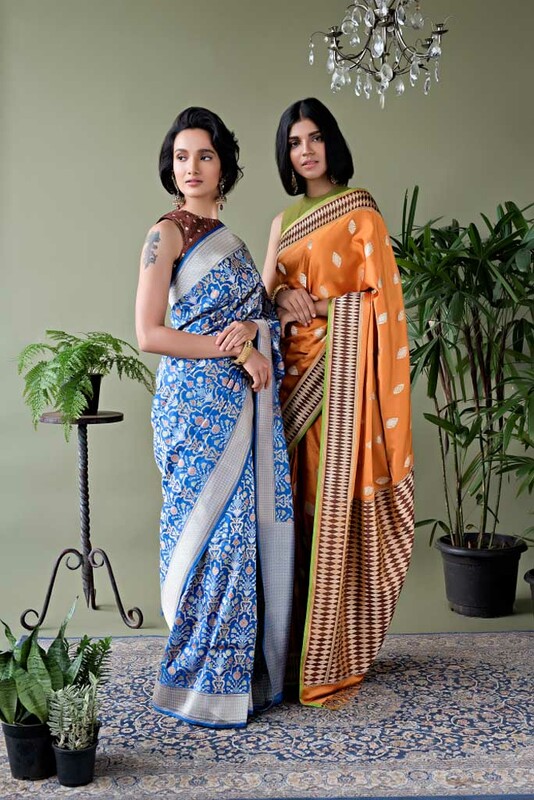 Yet through the wondrous diversity of the saris from many regions of india runs the thread of a shared USP: pride in nurturing heritage weaves and textile traditions and using them to create contemporary products and a focus on eco friendly sustainability. 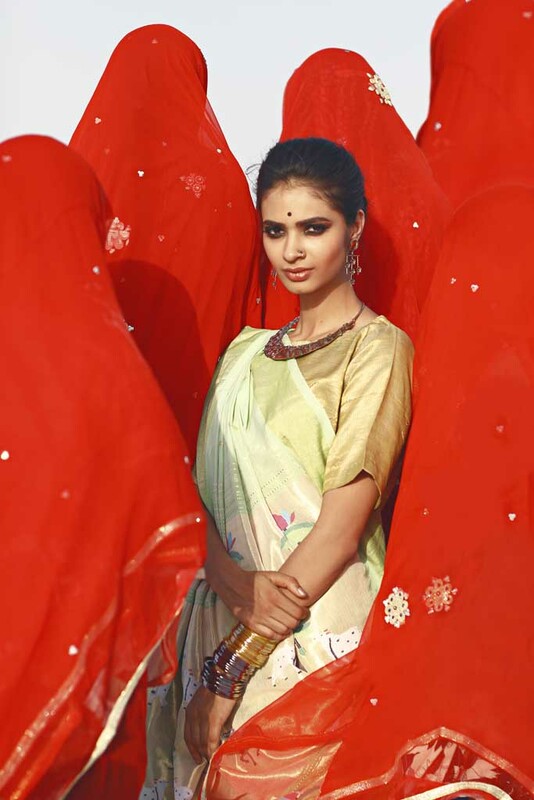 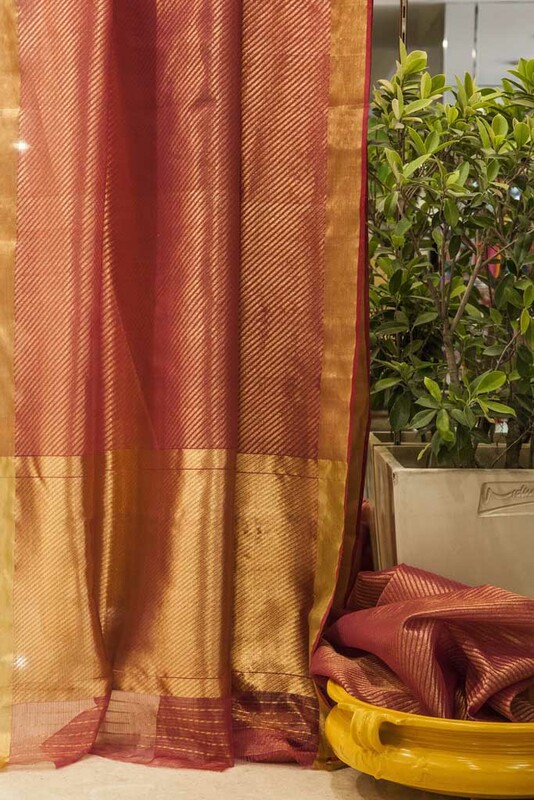 The ‘Textiles & Accessories’ show presents a sari for every occasion and every season! 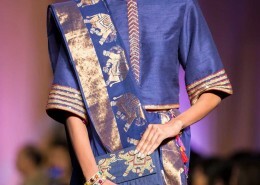 Think Benarasi classics and Nilambaris collection comes into view. 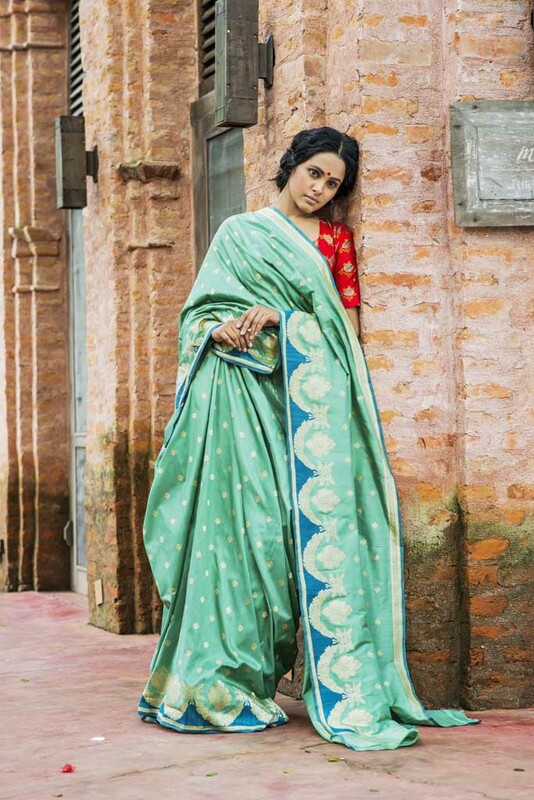 Based on centuries old weaves, revival of the jamdani tradition, each one of its kind nilambari sari is breathtaking in concept and craftsmanship. 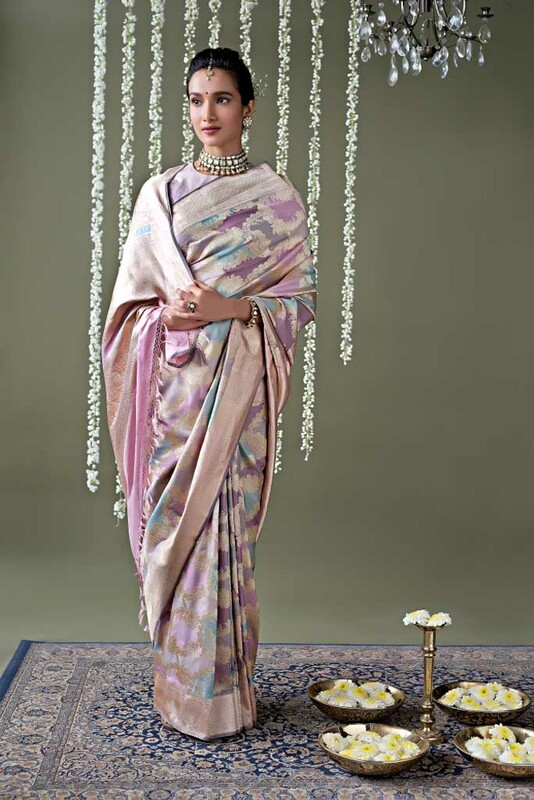 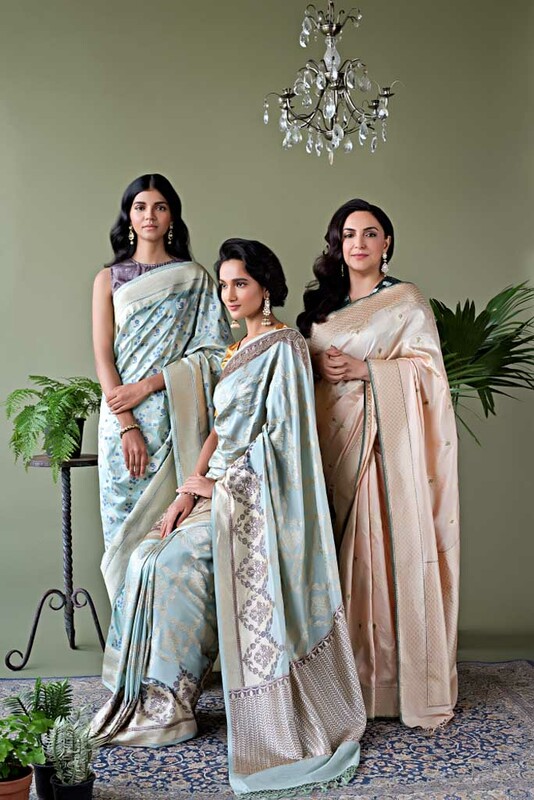 Vidhi singhania’s exquisite collection features cotton ‘khat’ saris in soft pastels stunning half silver half gold kota jaal saris, jacquards, ‘panch buttis’ and much more. 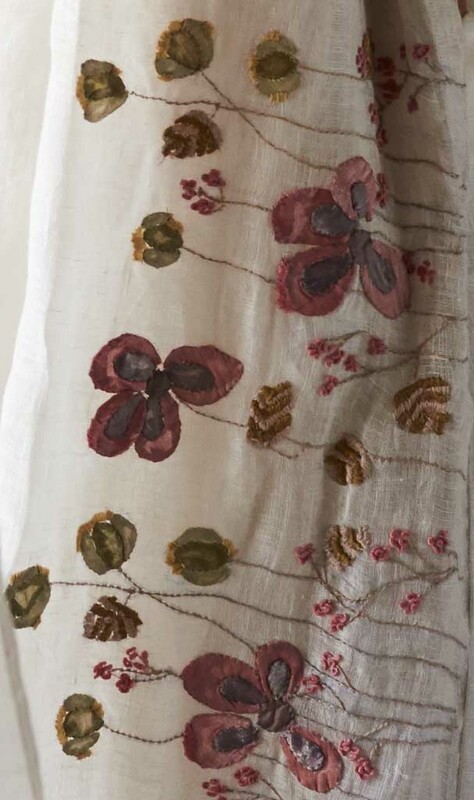 The quirky named 2 up 2 down label features embellishment with shibori, hand block printing and embroidery. 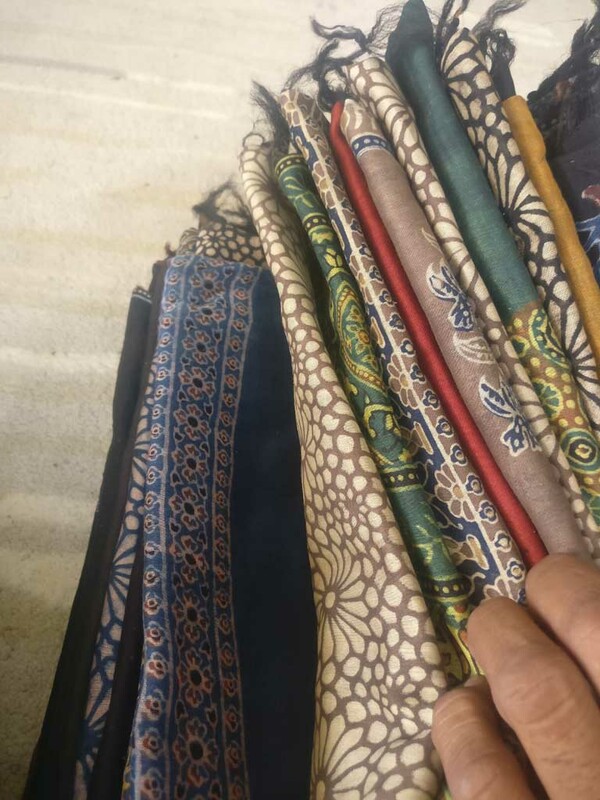 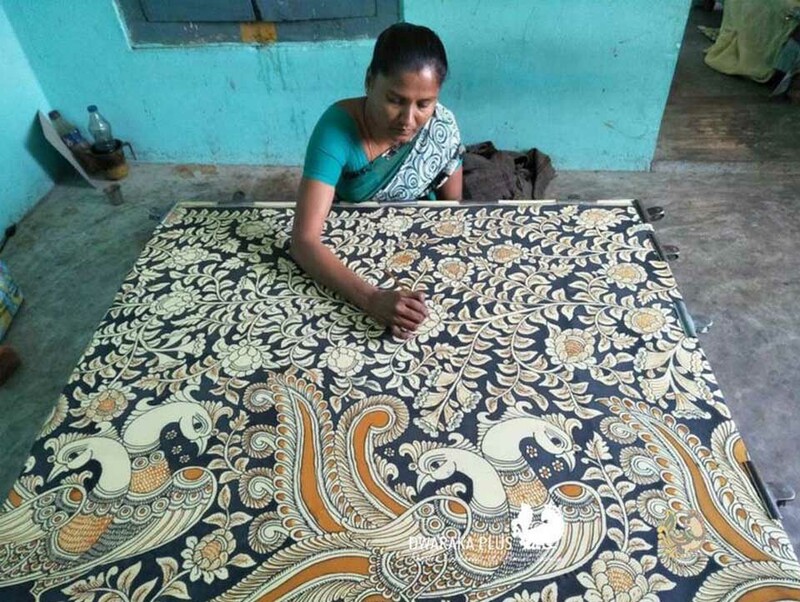 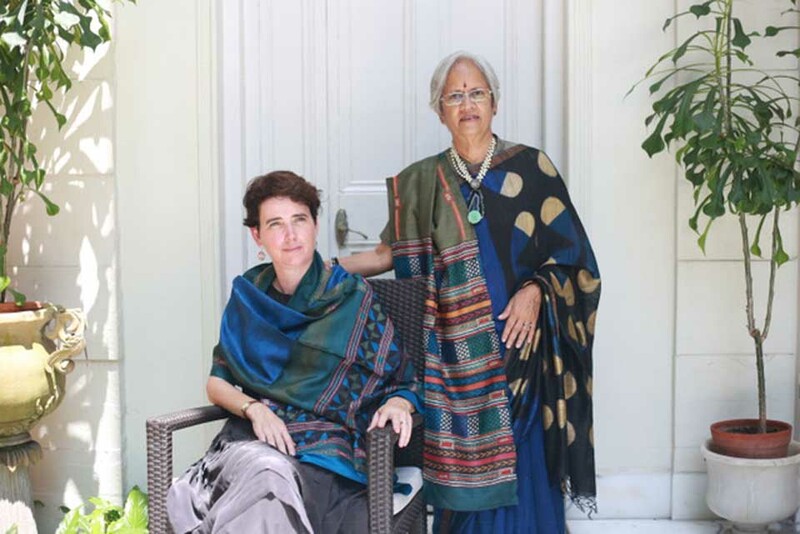 Her custom made bespoke saris, stoles and fabric walk international ramps and are used in their fashion creations by Giorgio Armani and others. 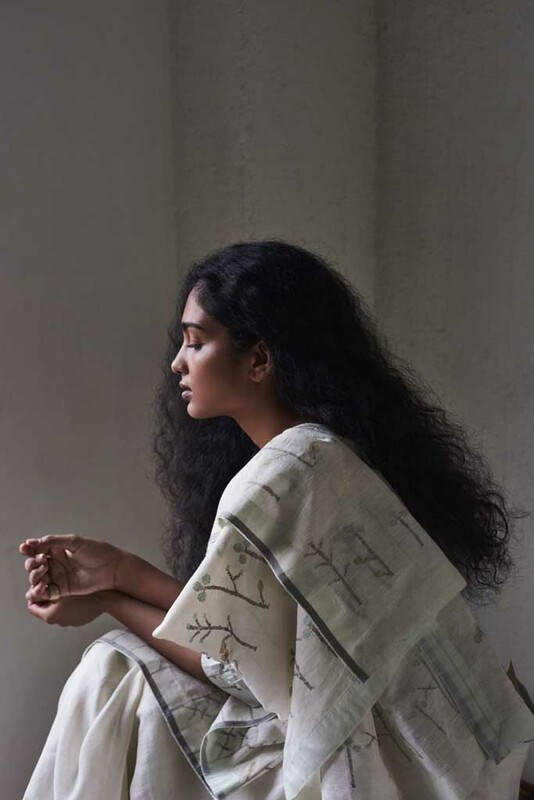 Anavila Misra’s lyrical linen saris ‘swati’, ‘gulzar’ and ‘radha’ are not only collectors’ items and heirlooms of the future but epitomise cotton textiles at their best. 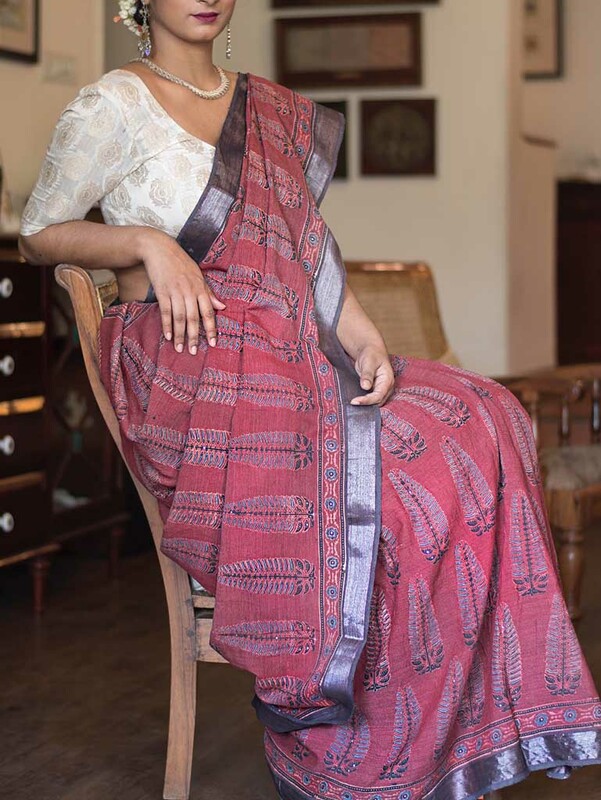 National award winner Khatri Abdul Rahim Anwar’s ajrak fused with hand block prints create saris of unusual beauty in his label Kara; while Weaver’s studio create exciting textures with kantha embroidery. 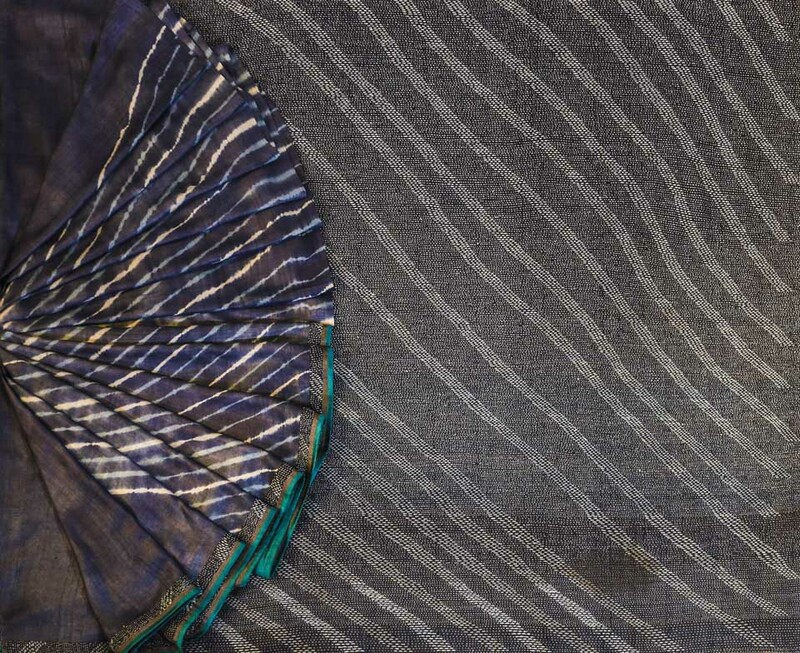 The textile show is about innumerable showstoppers. 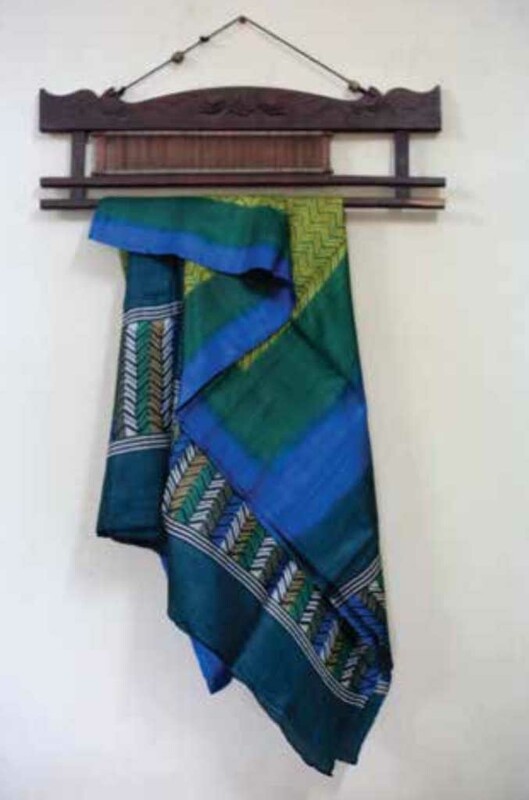 The cool beauty of linen saris, khadi frabic and saris with exquisite embroidery and block prints, the freshness and ethereal look of muslins, designer Bengal cottons and mulberry silk saris each cast a spell of innovative style and not to be missed, the poetic loveliness of dwaraka’s kalamkari saris, himroo’s wide range of beautiful paithanis and blouses glaore. 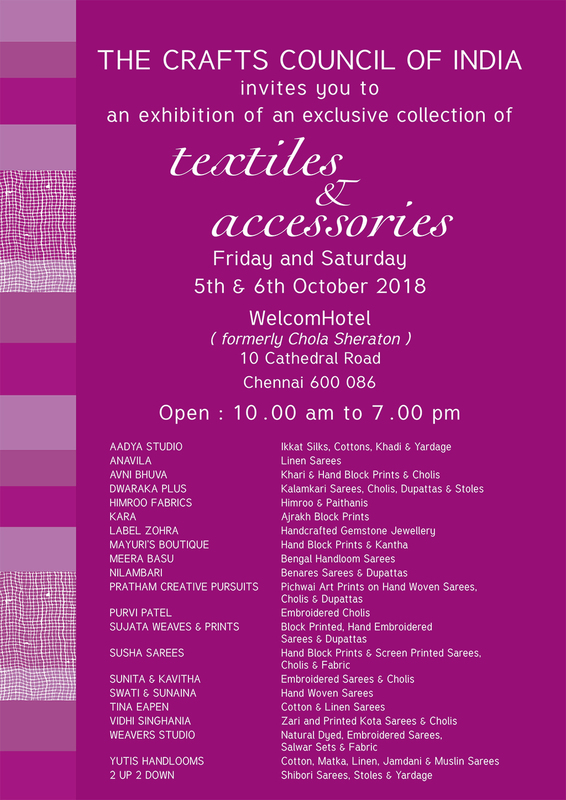 Label Zohra’s natural gemstone jewellery literally adds ‘sone par suhaga’ to ‘CCI’s textiles & accessories show’ which keeps its promises to Chennai textile lover, year upon year. 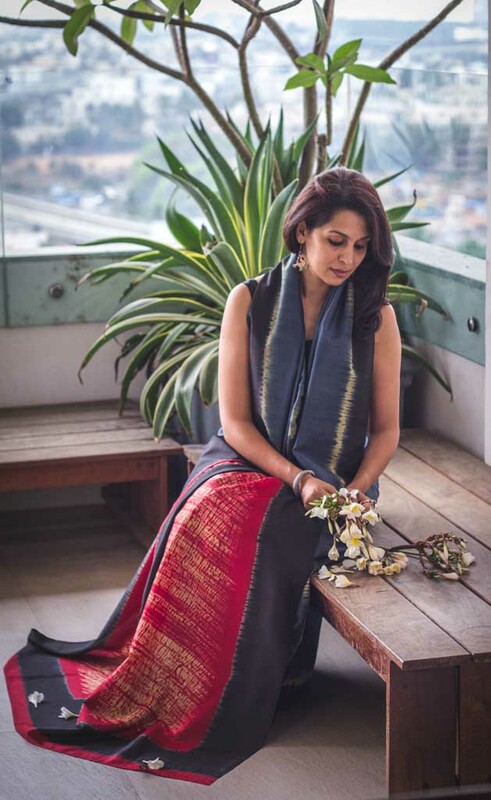 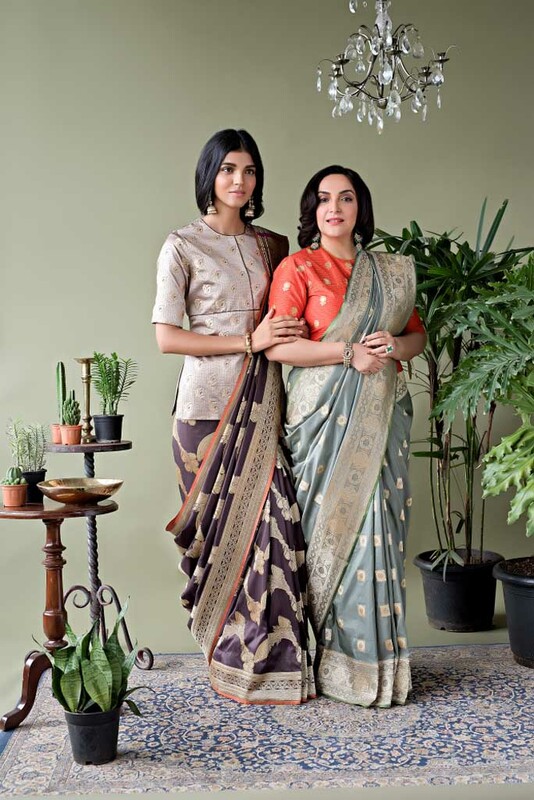 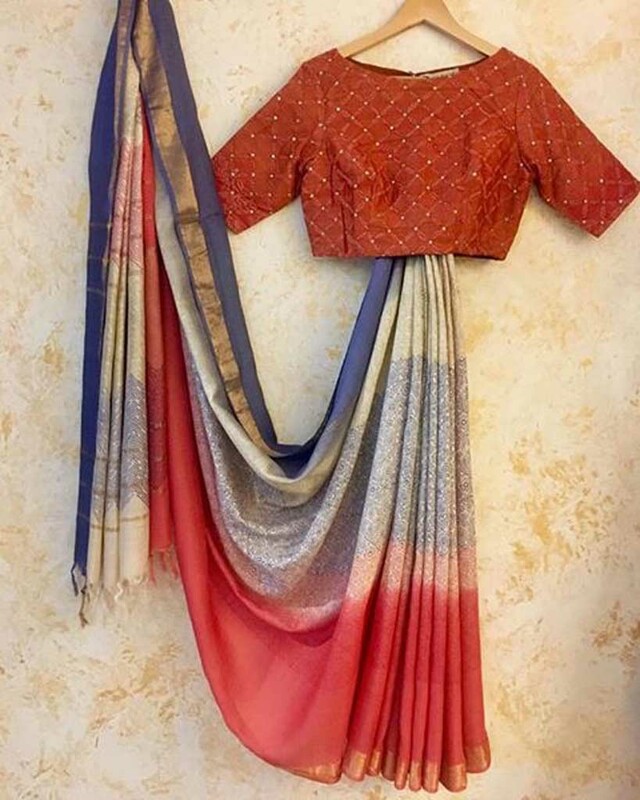 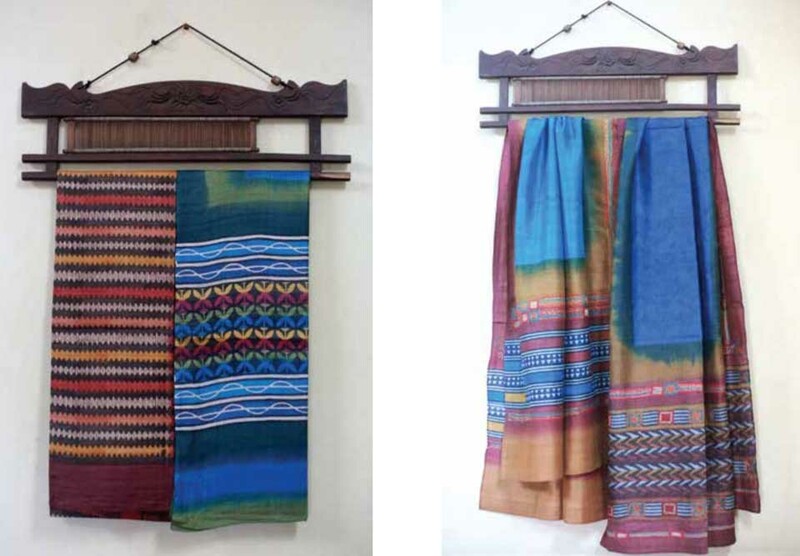 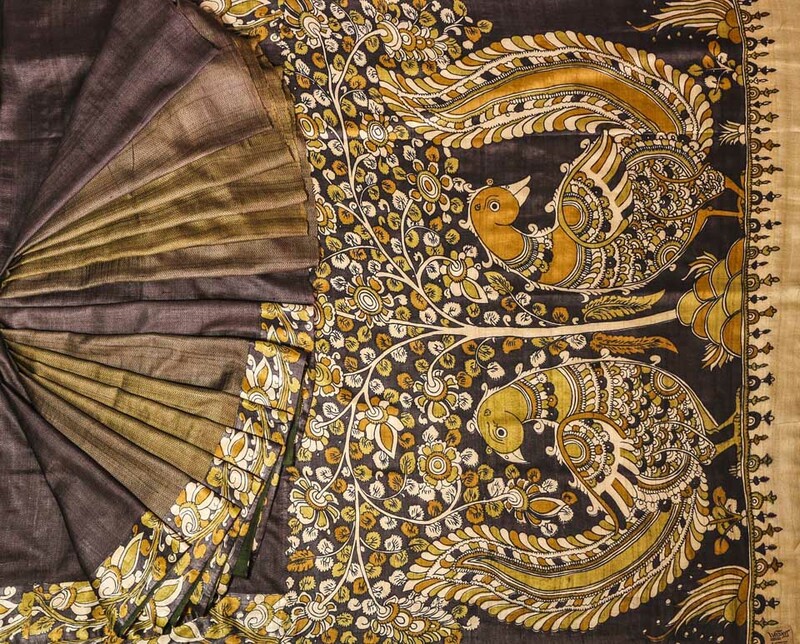 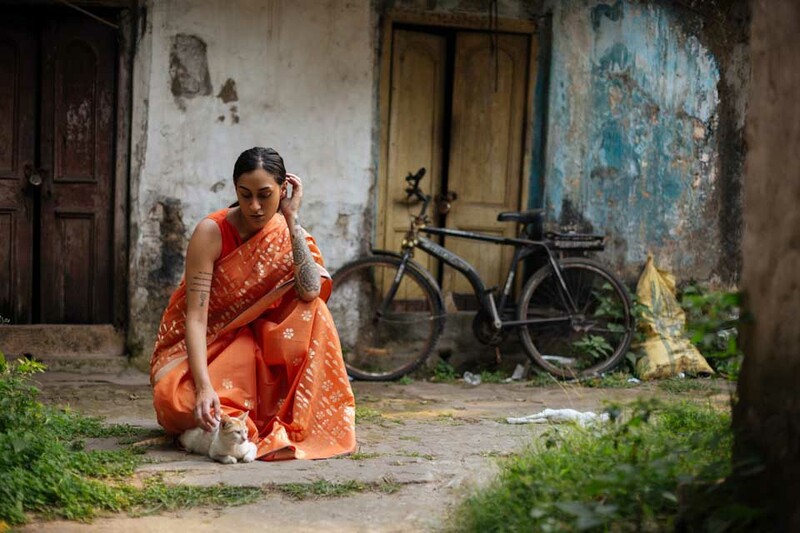 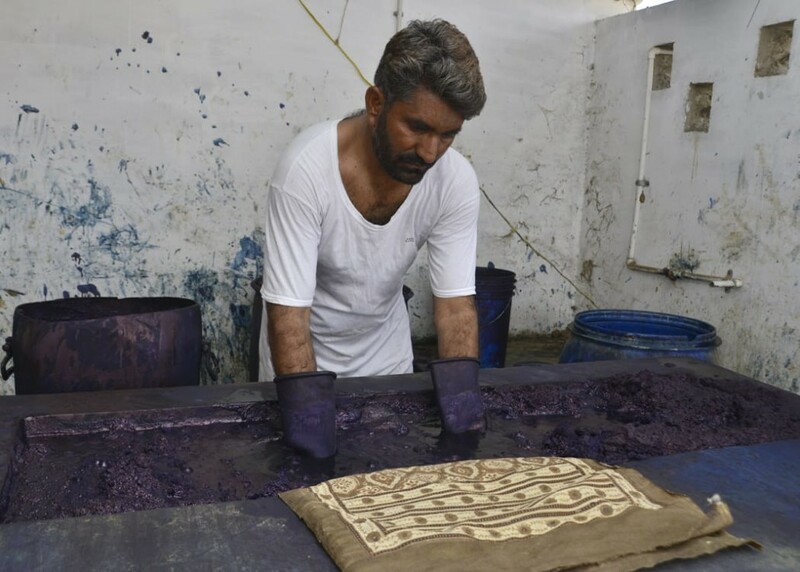 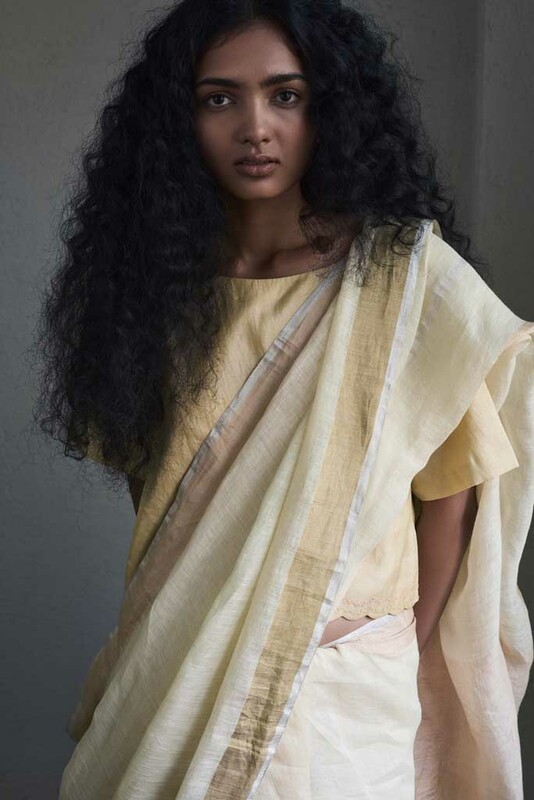 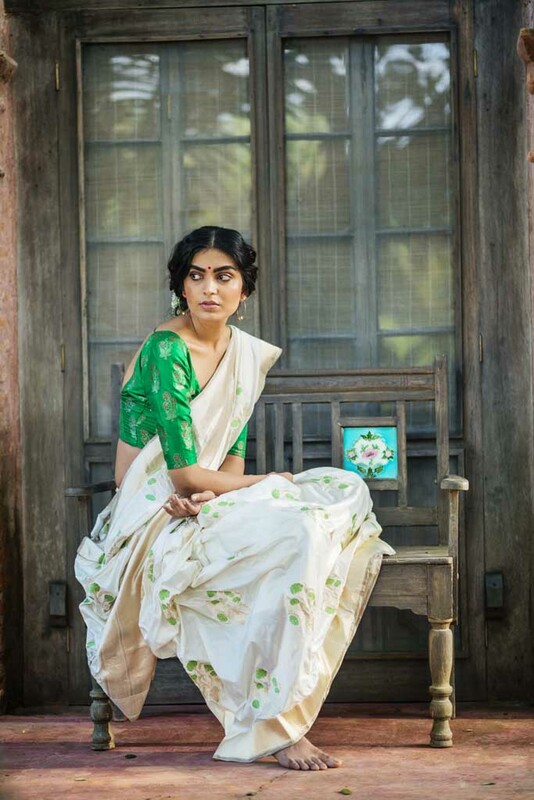 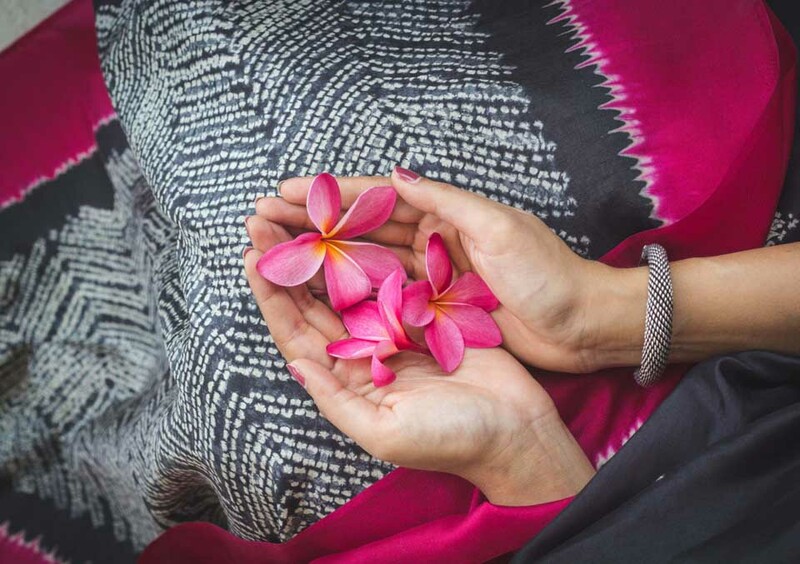 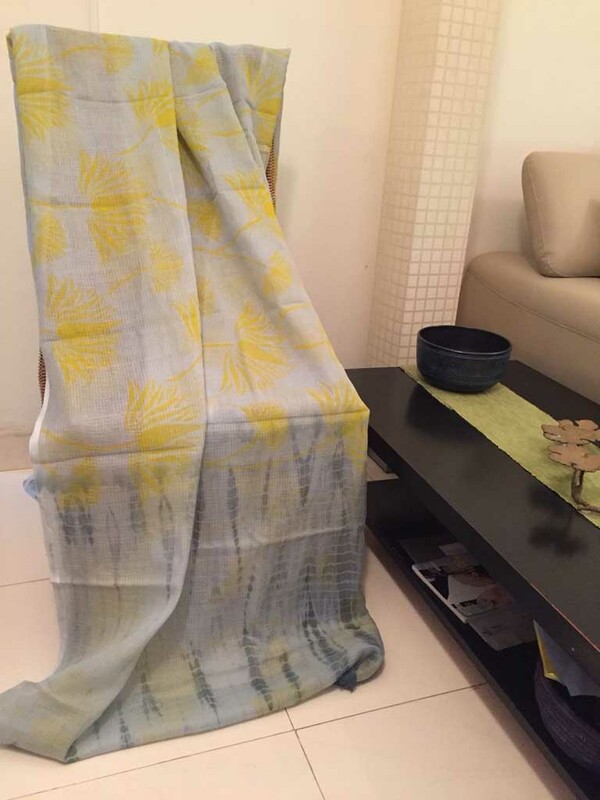 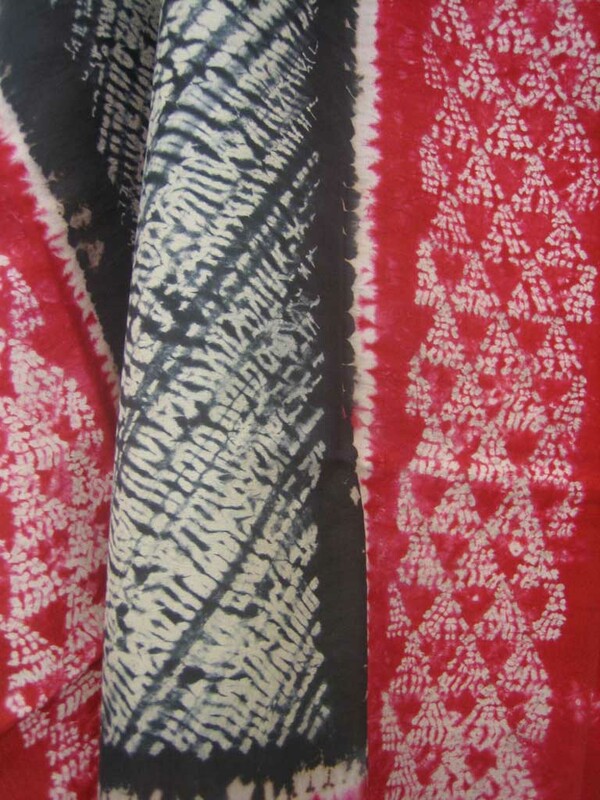 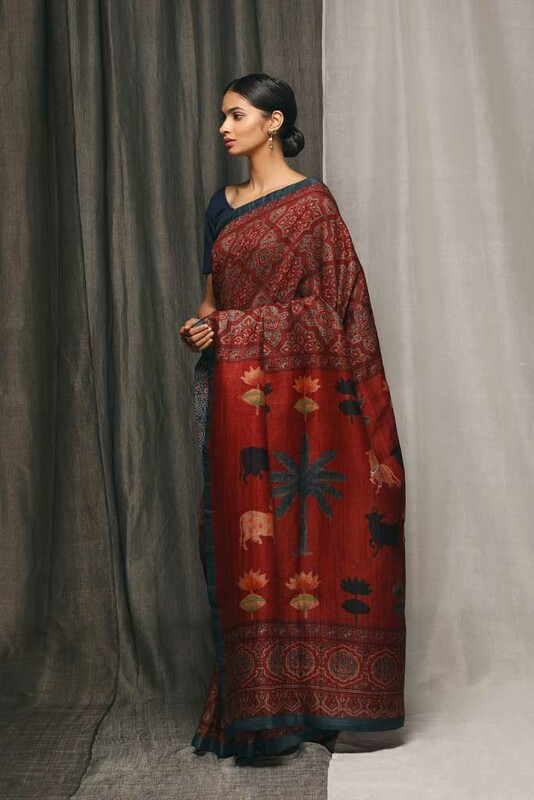 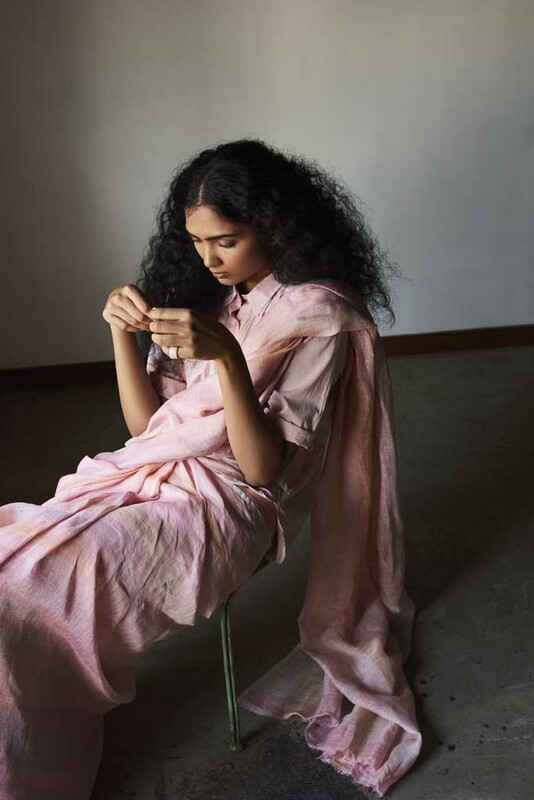 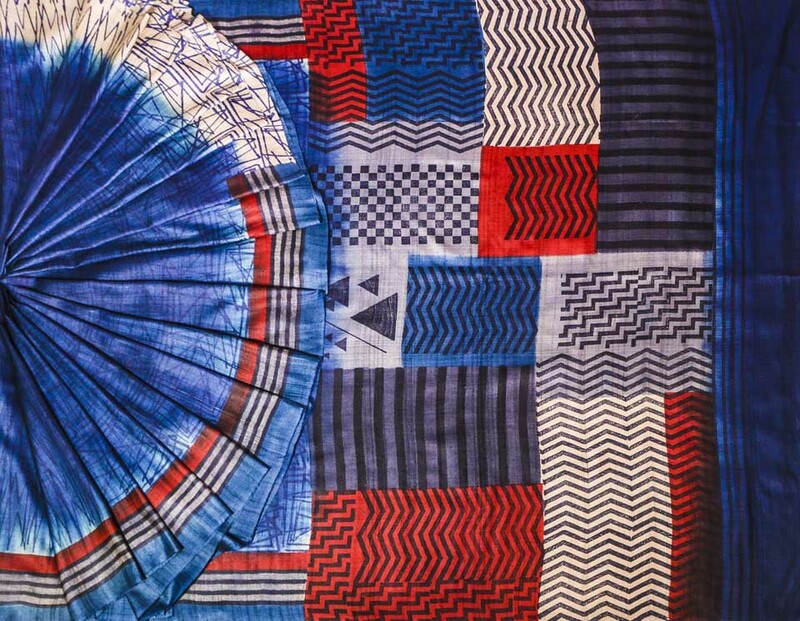 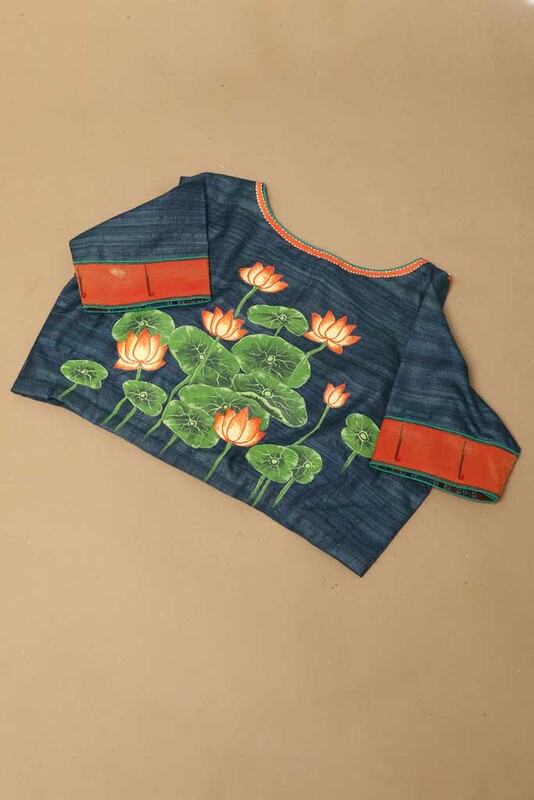 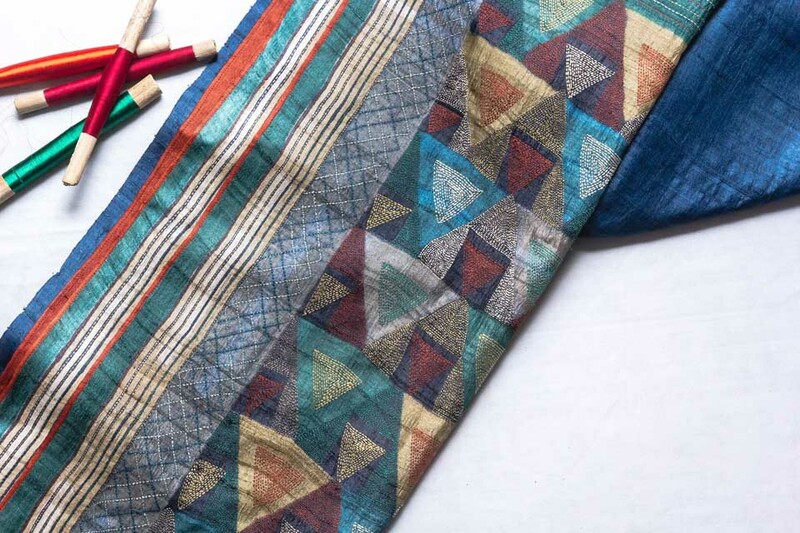 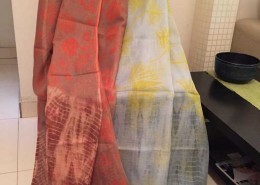 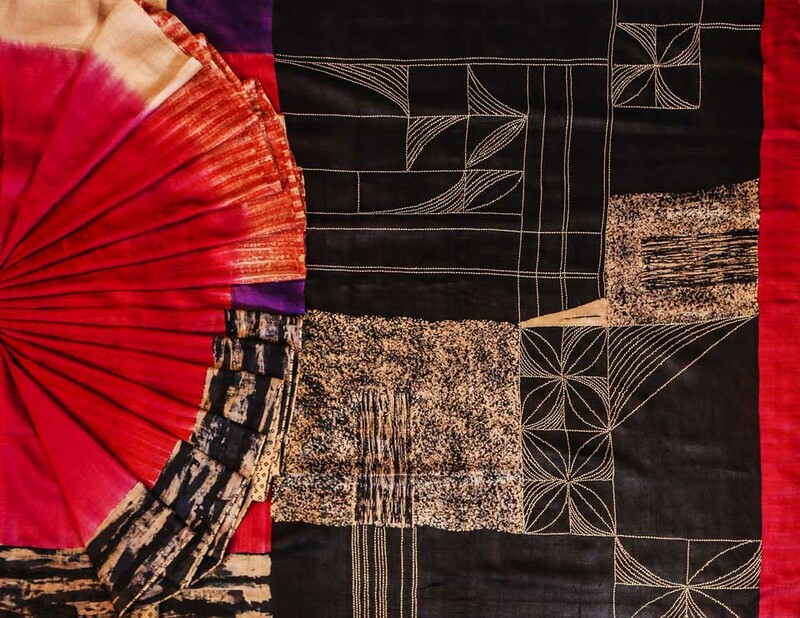 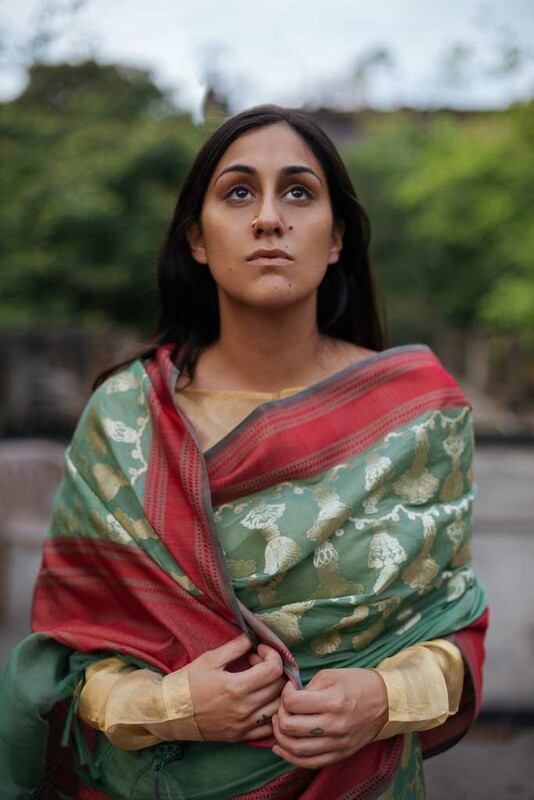 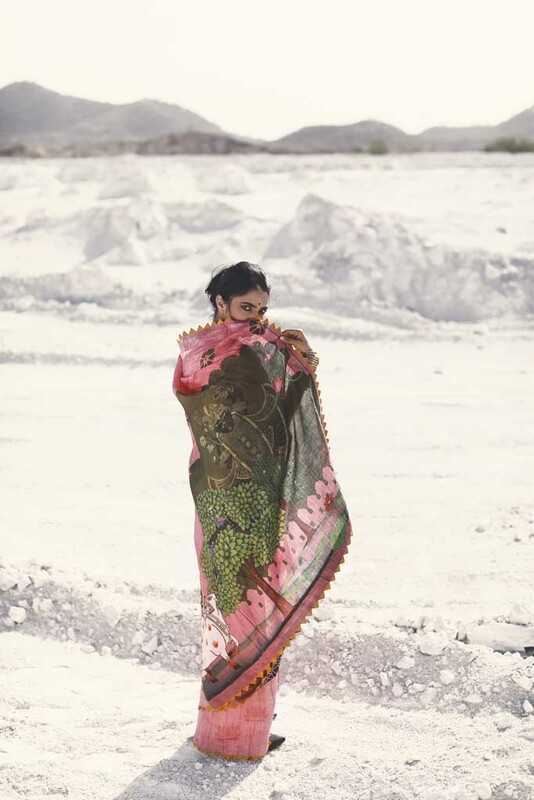 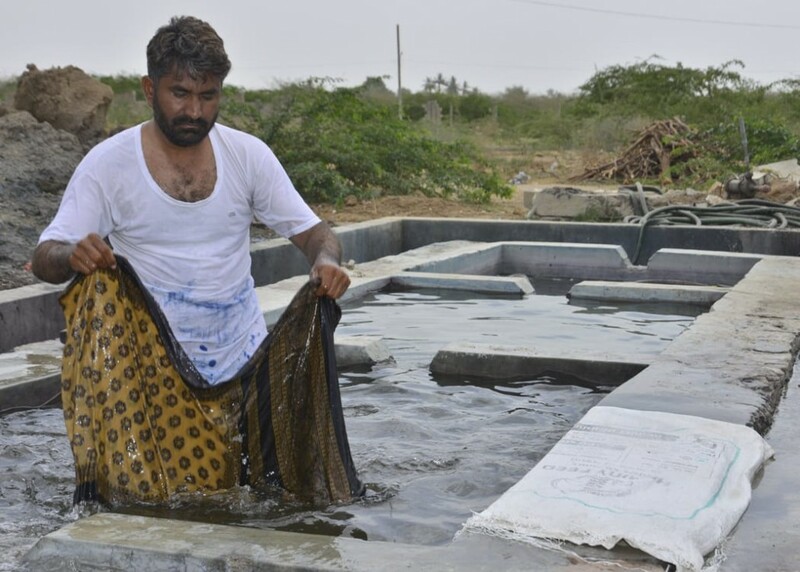 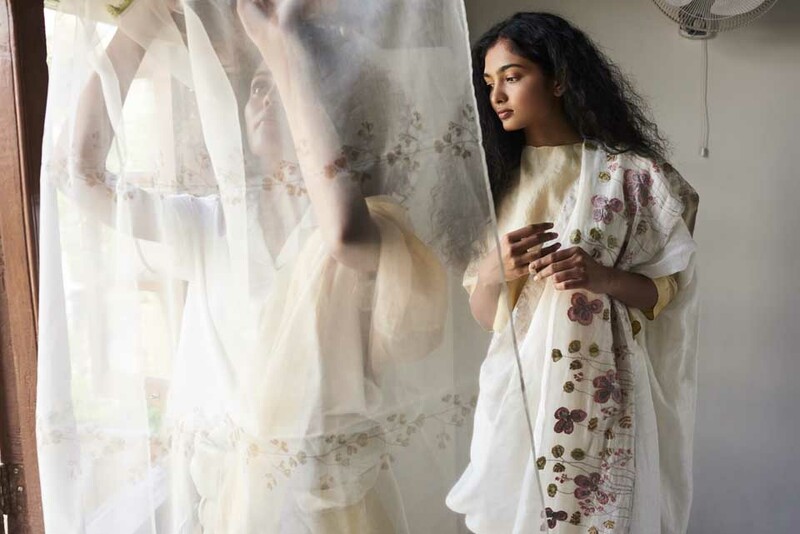 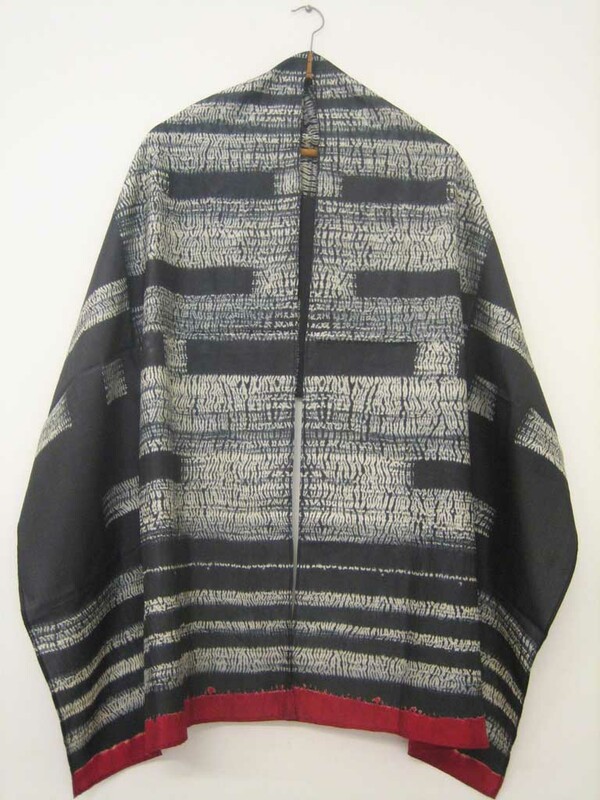 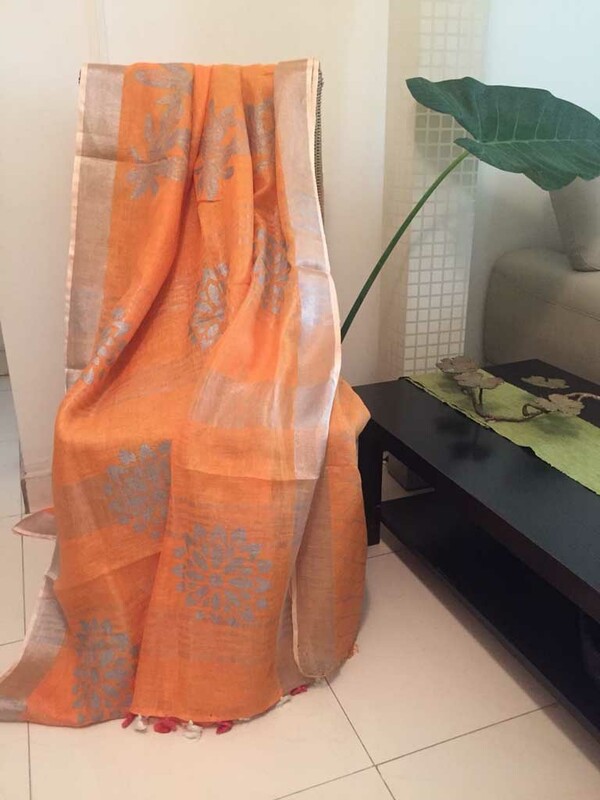 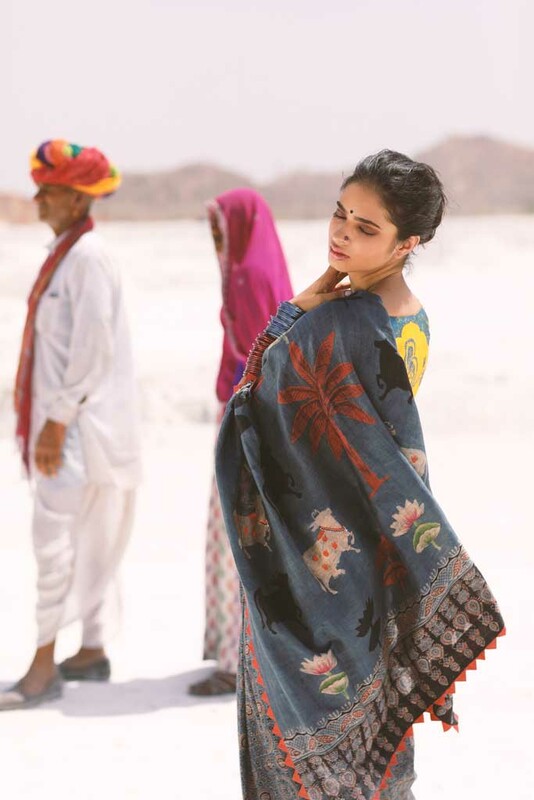 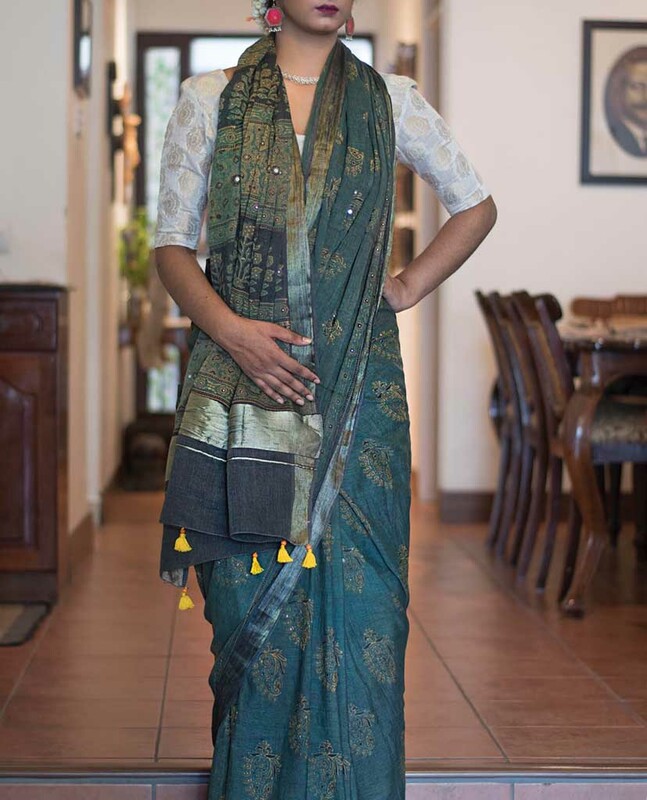 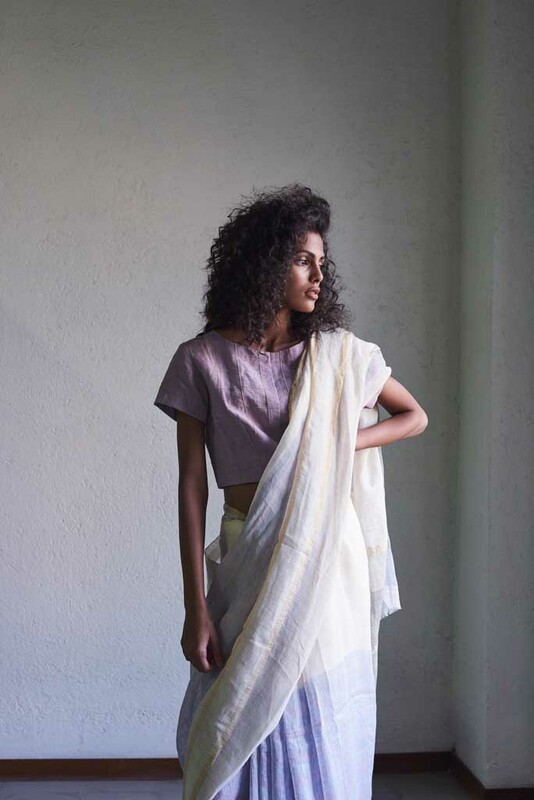 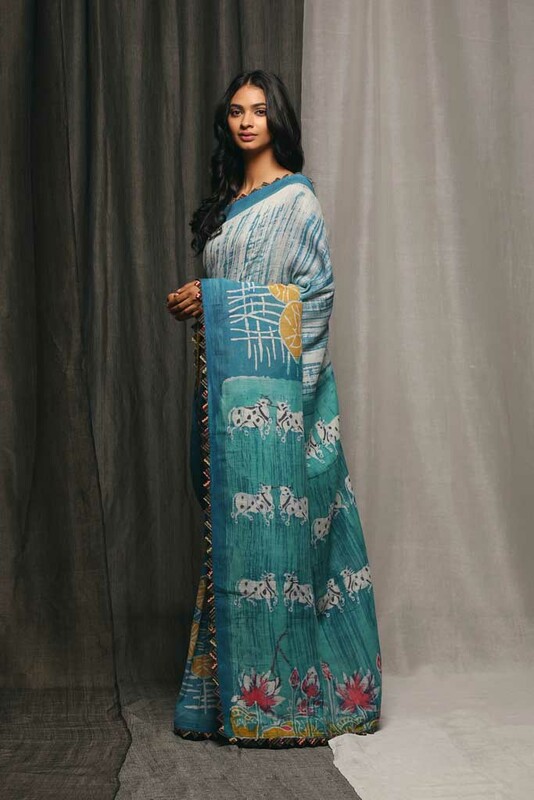 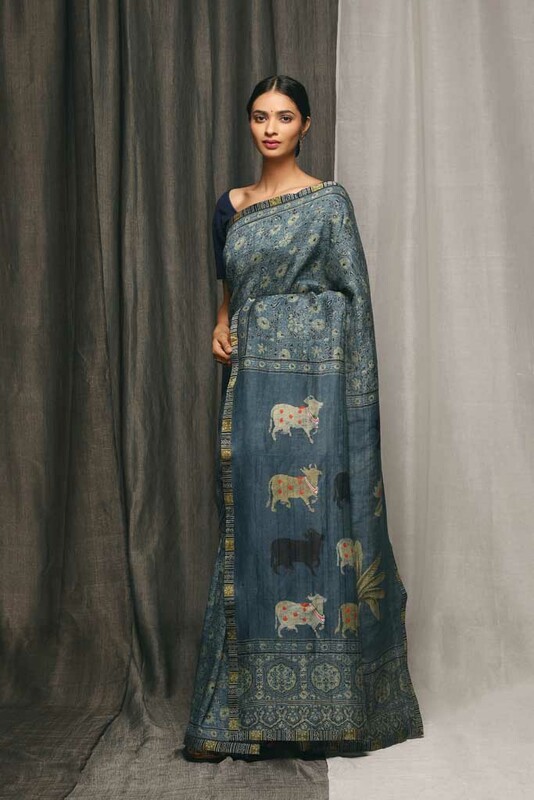 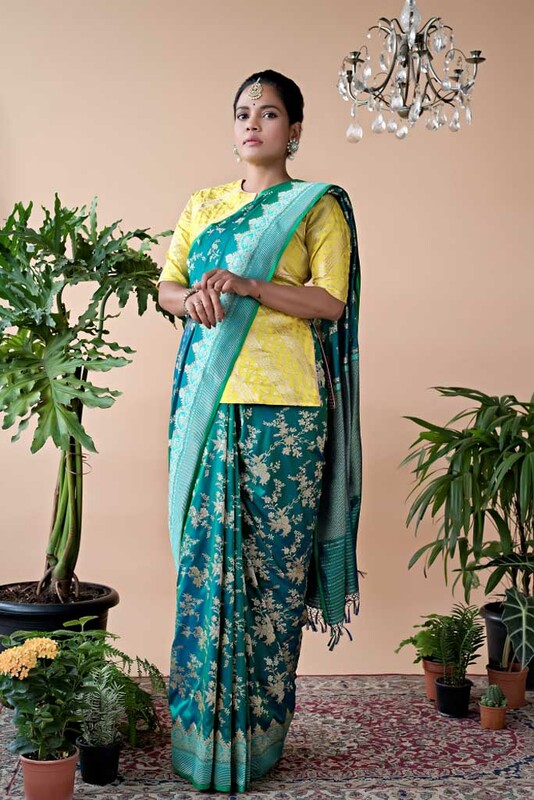 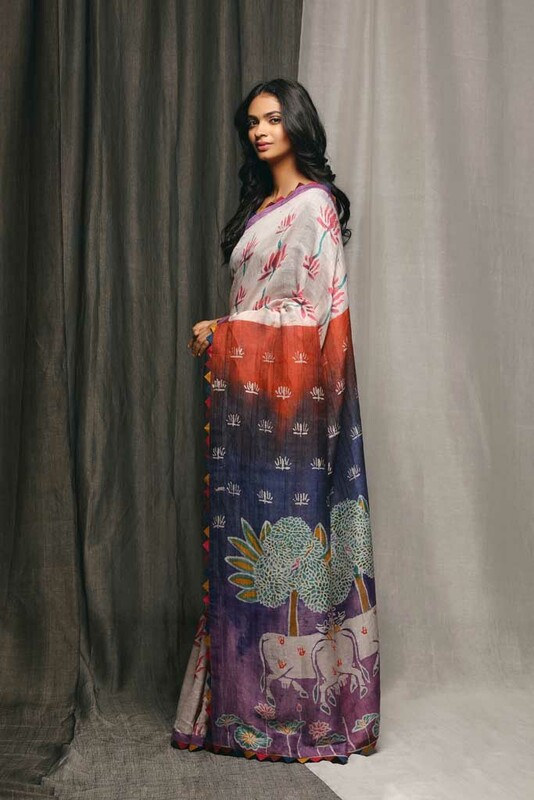 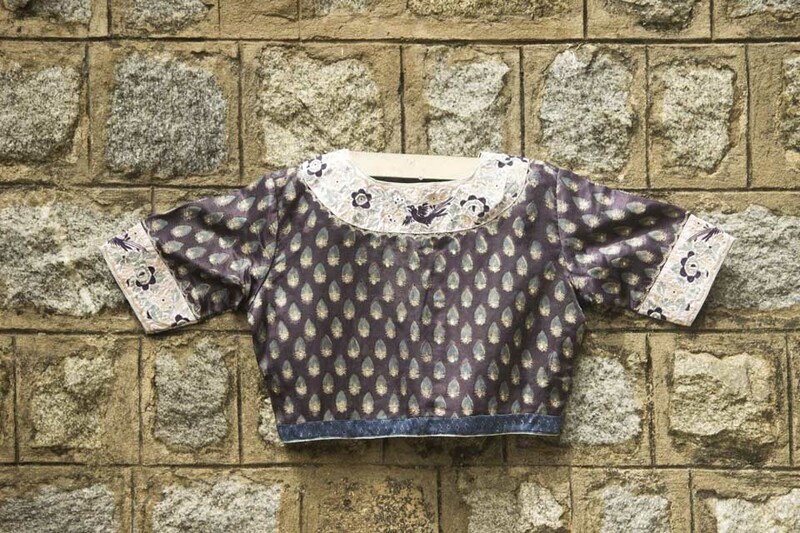 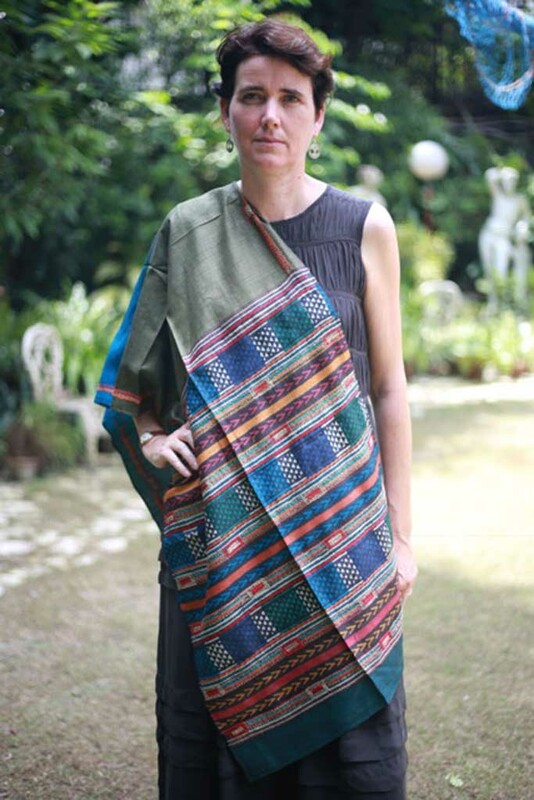 Founded by Namrata Shah of Shrishti School of Design, the label marries Shibori techniques and design with hand block printing and embroidery custom made saris. 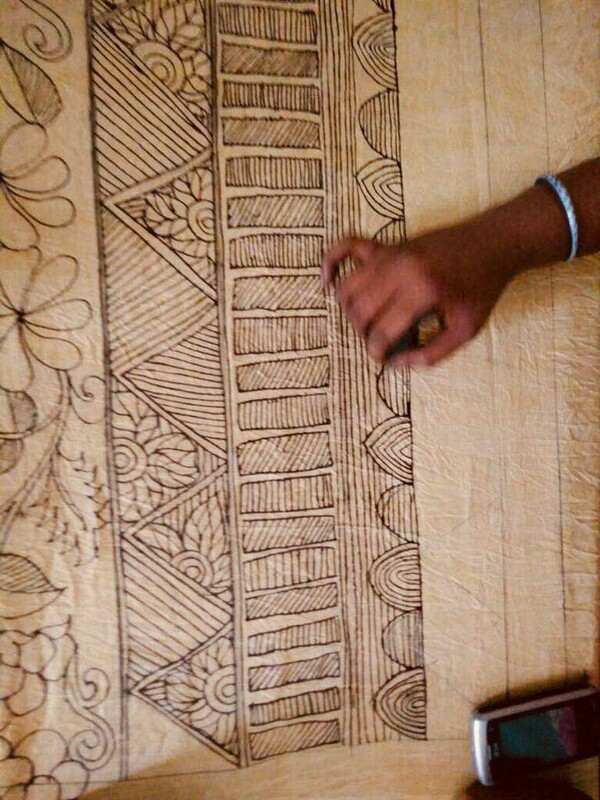 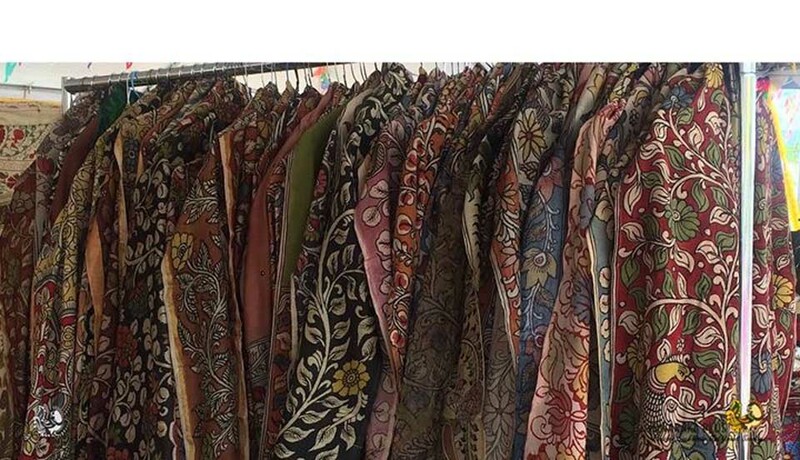 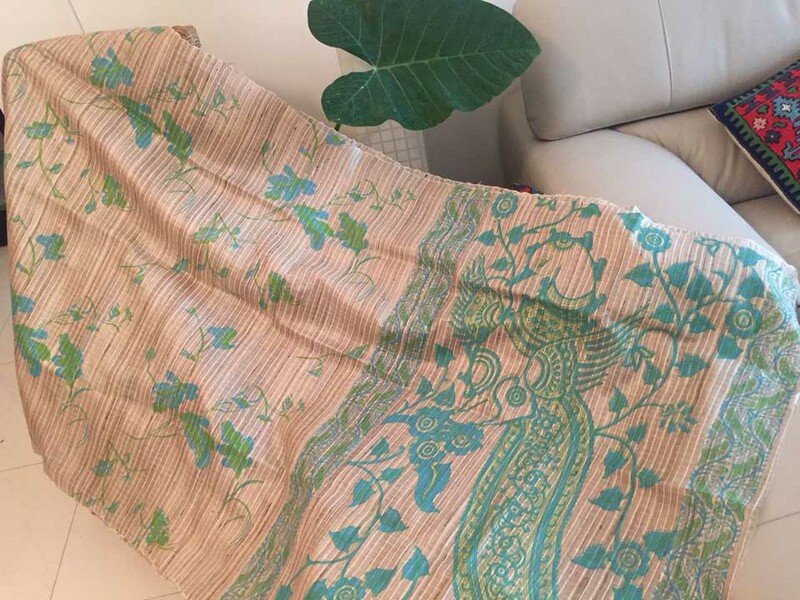 Will launch a unique, one of a kind, Eco-print collection, an exclusive 100 % organic, naturally printed using dried leaves. 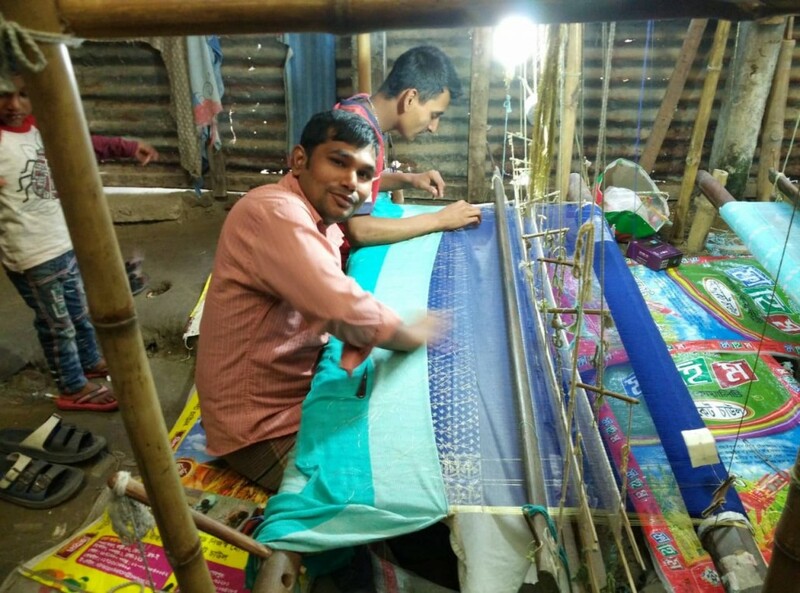 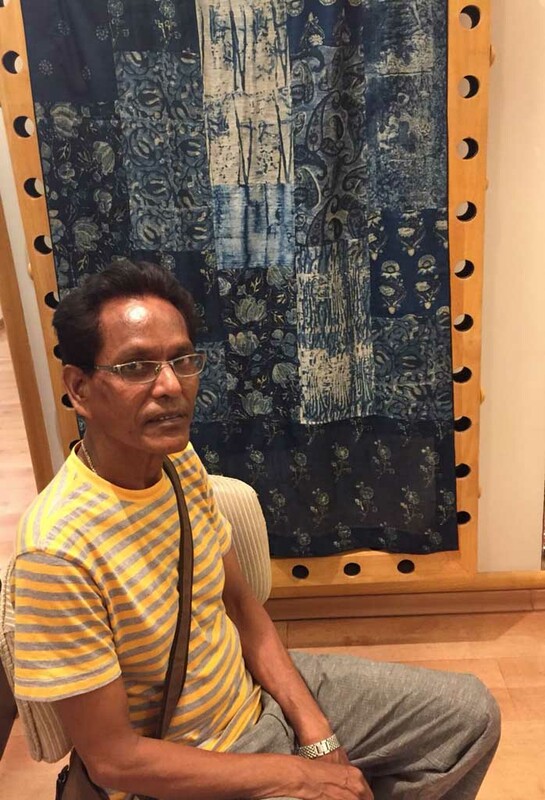 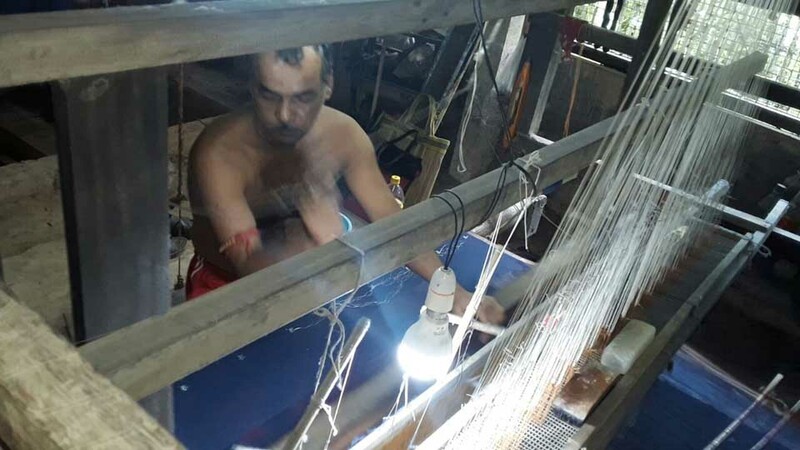 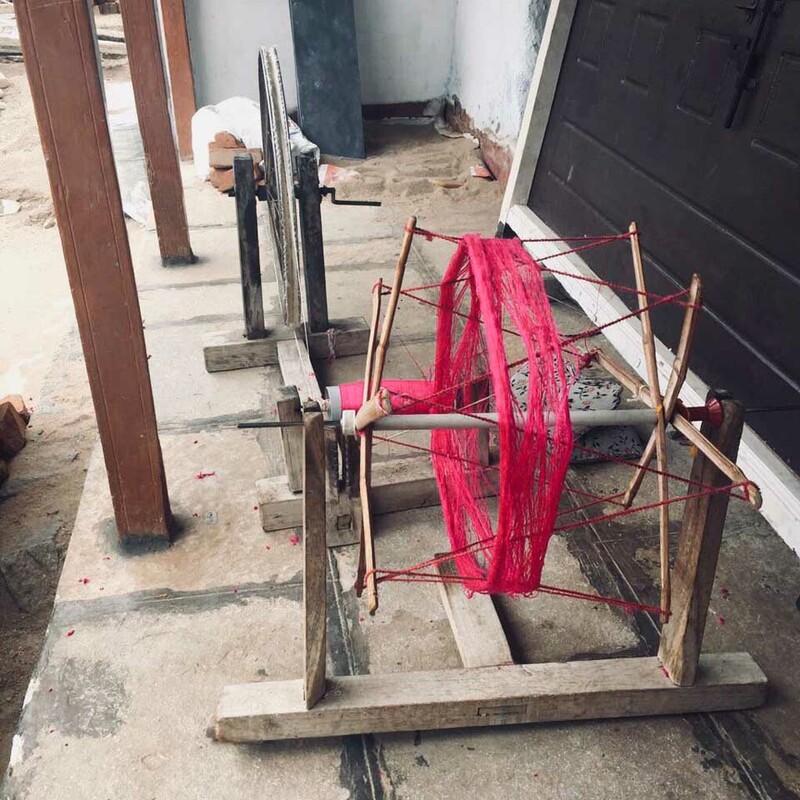 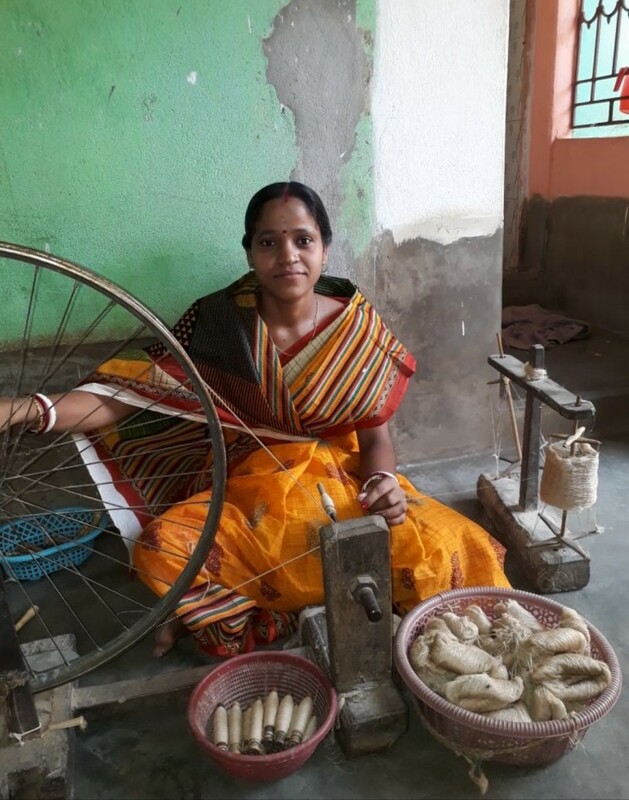 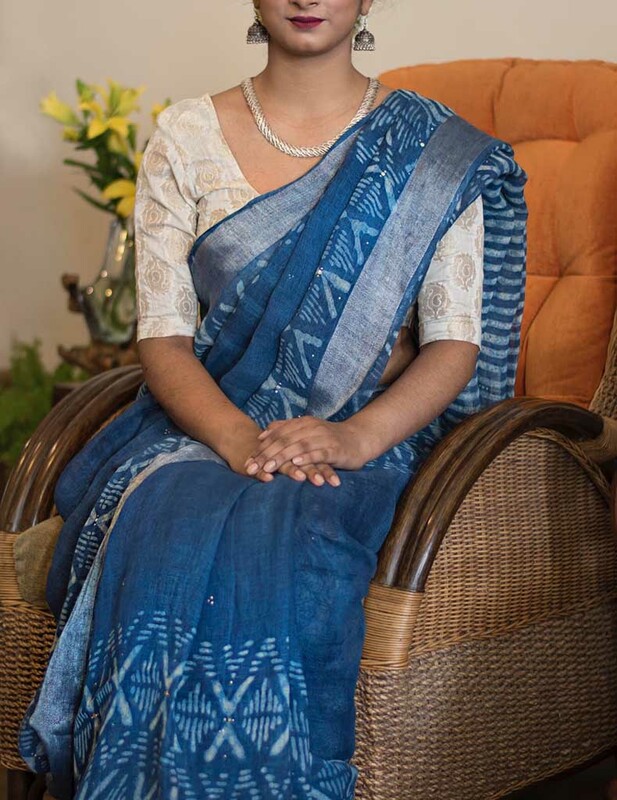 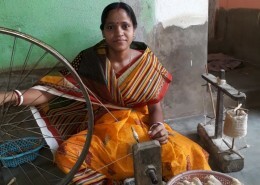 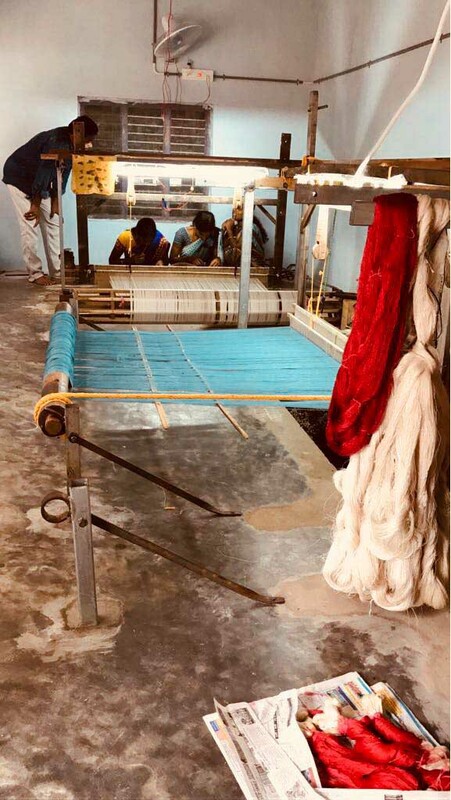 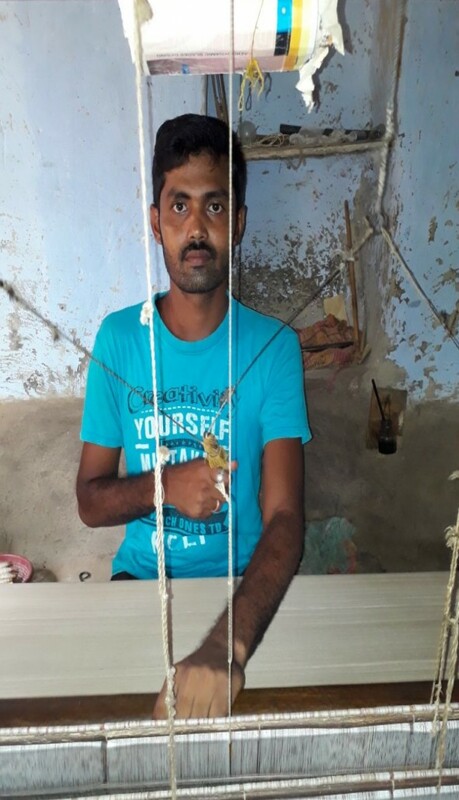 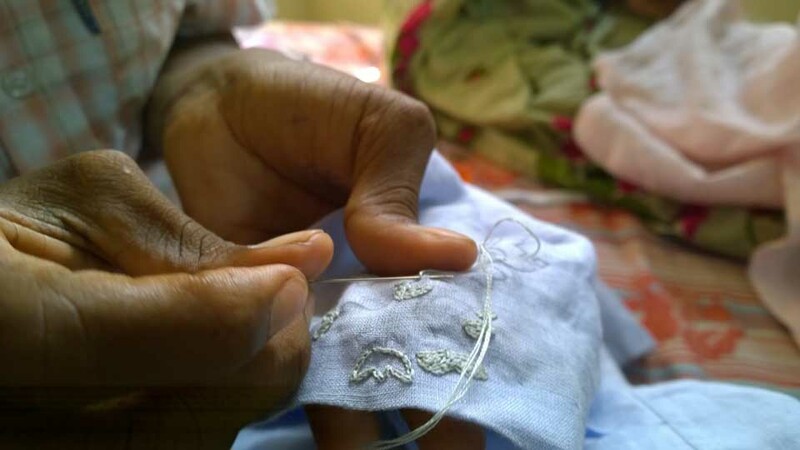 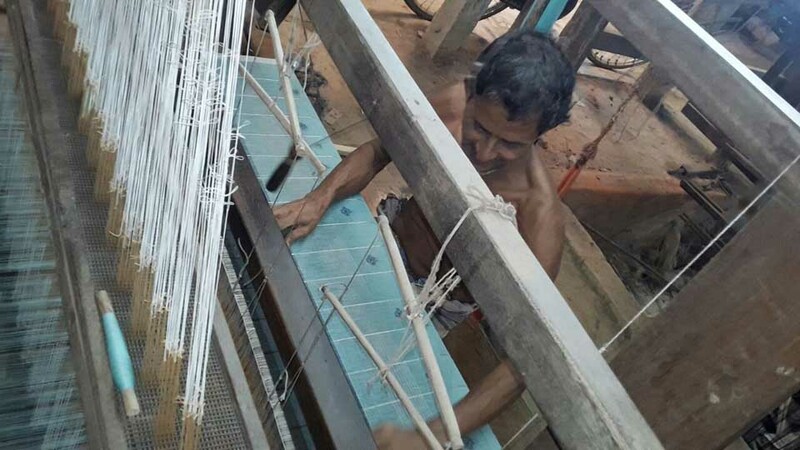 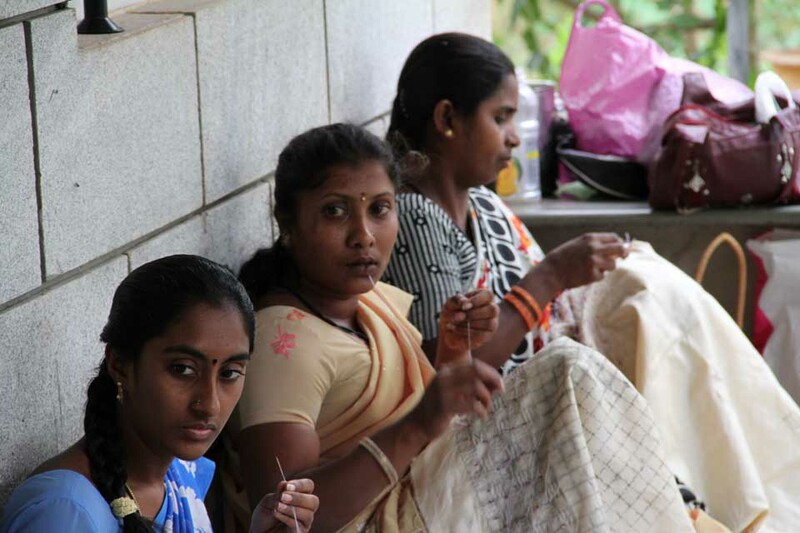 Started 6 years back, Yutis Handlooms works with Chak Islampur cluster in West Bengal to create handloom saris, dupattas and stoles in khadi, linen, tassar and silk in unique weaves and designs. 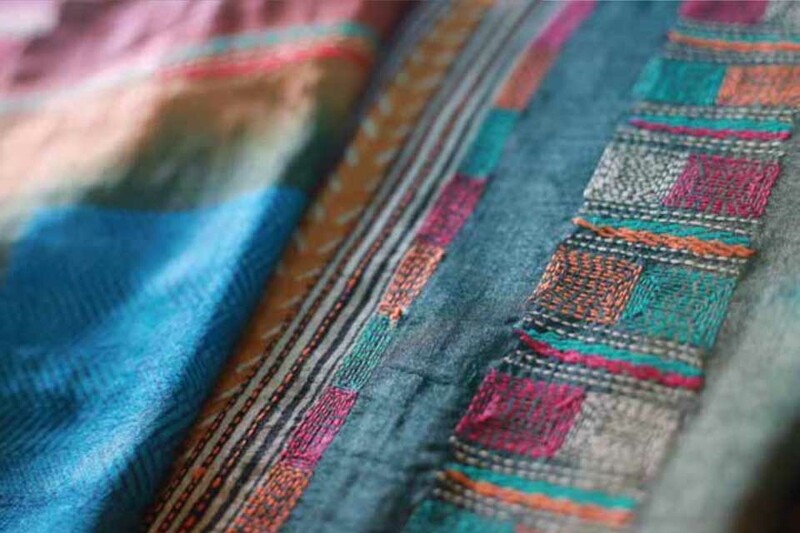 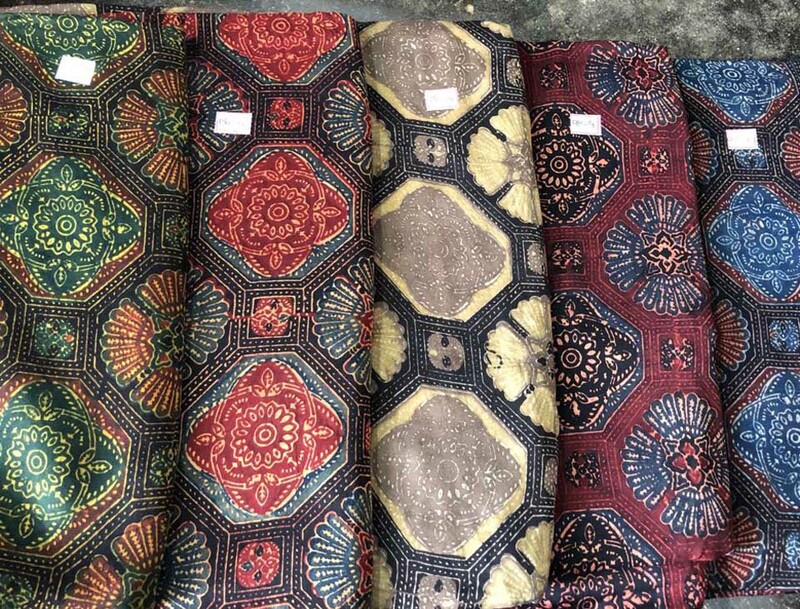 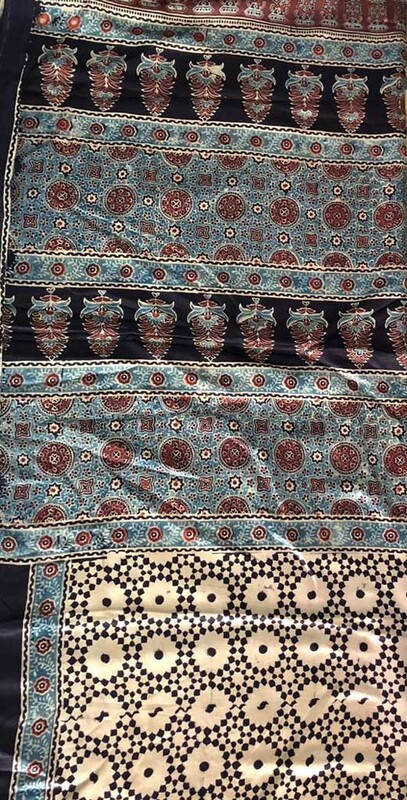 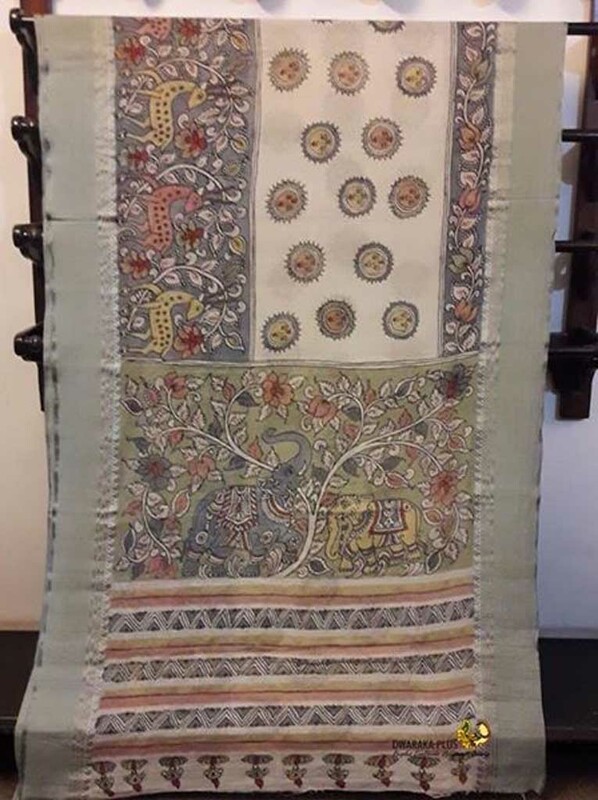 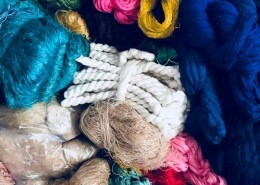 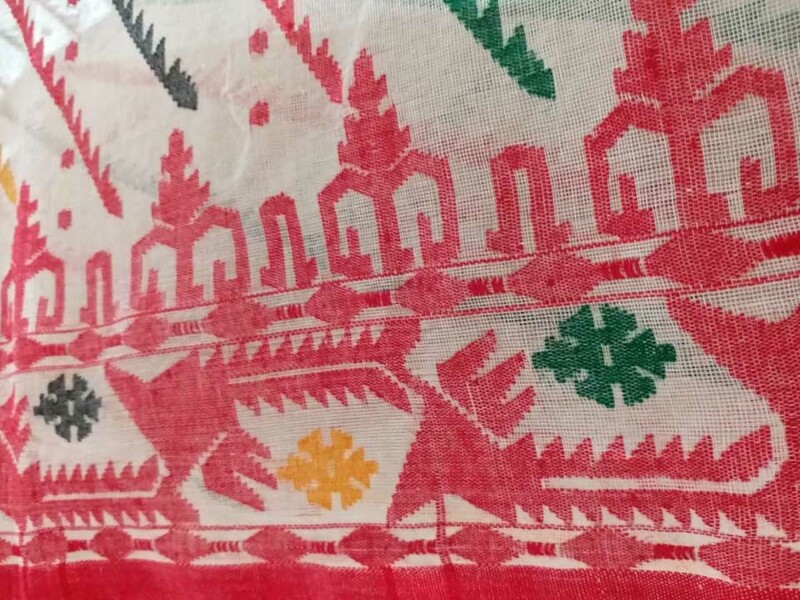 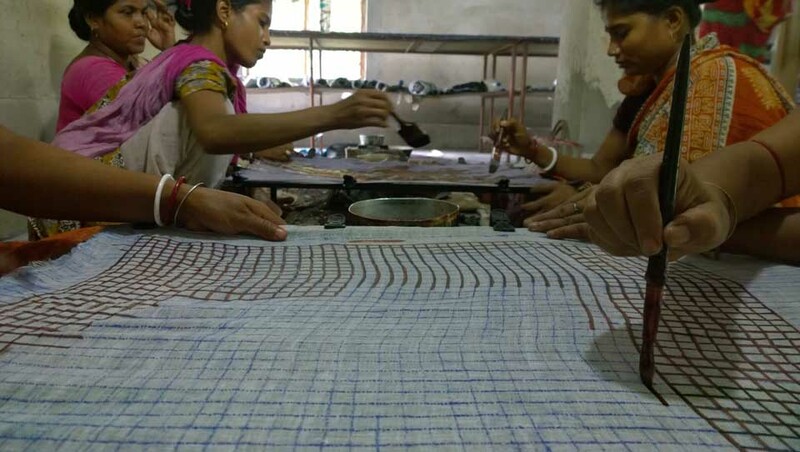 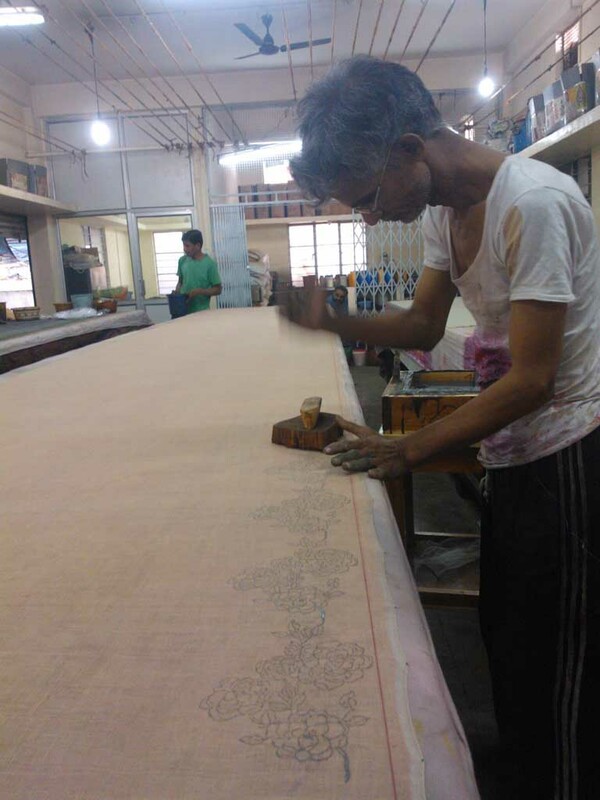 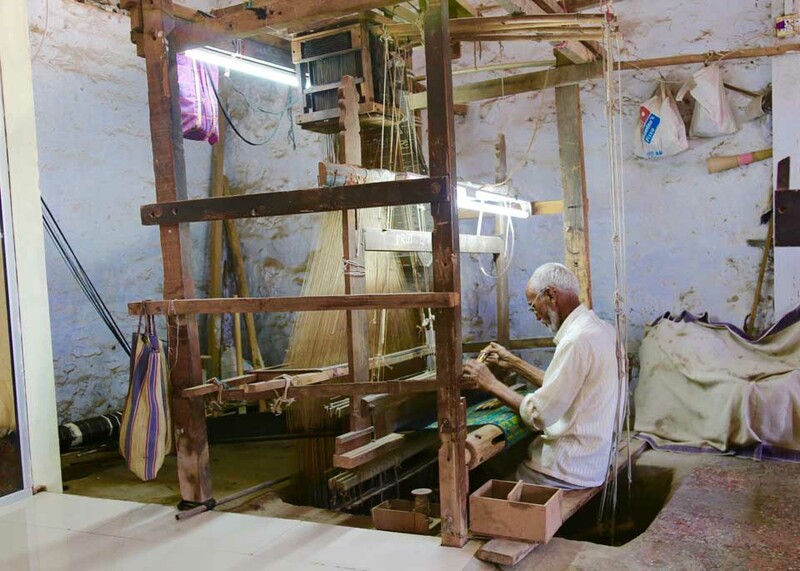 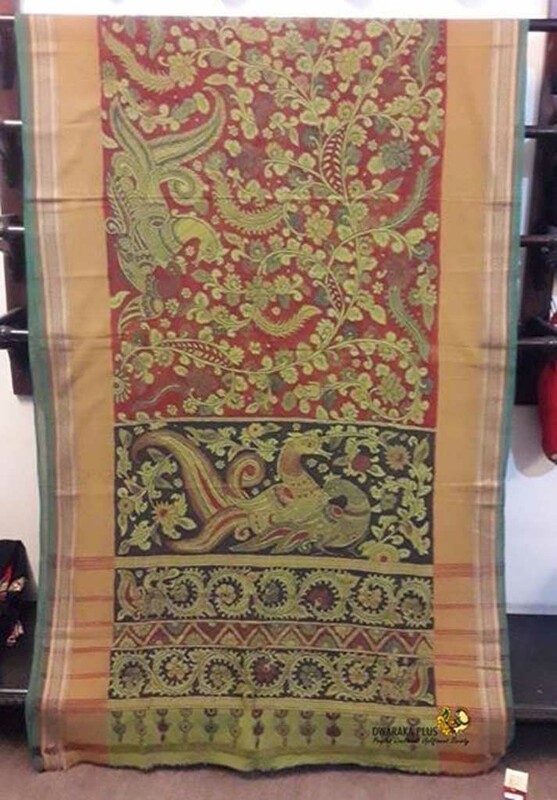 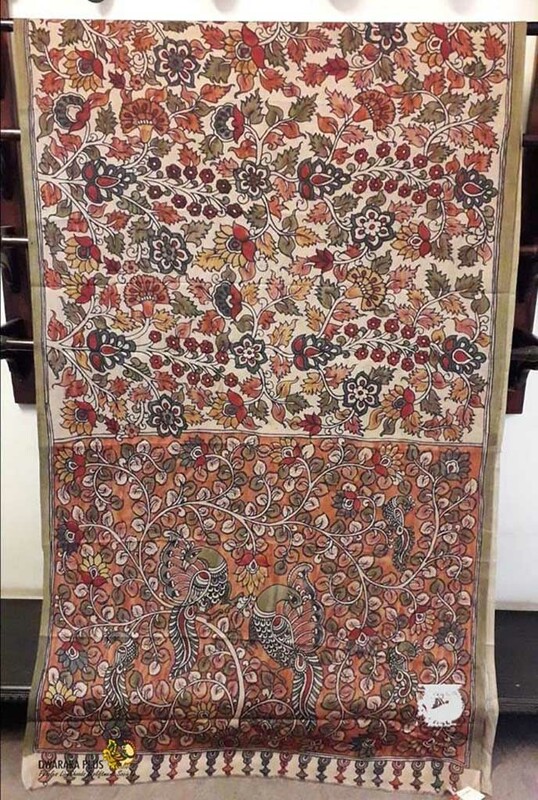 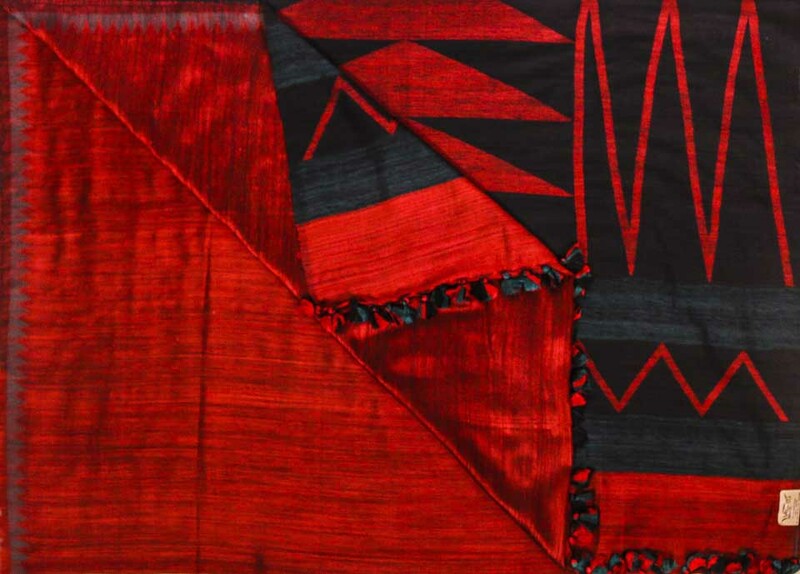 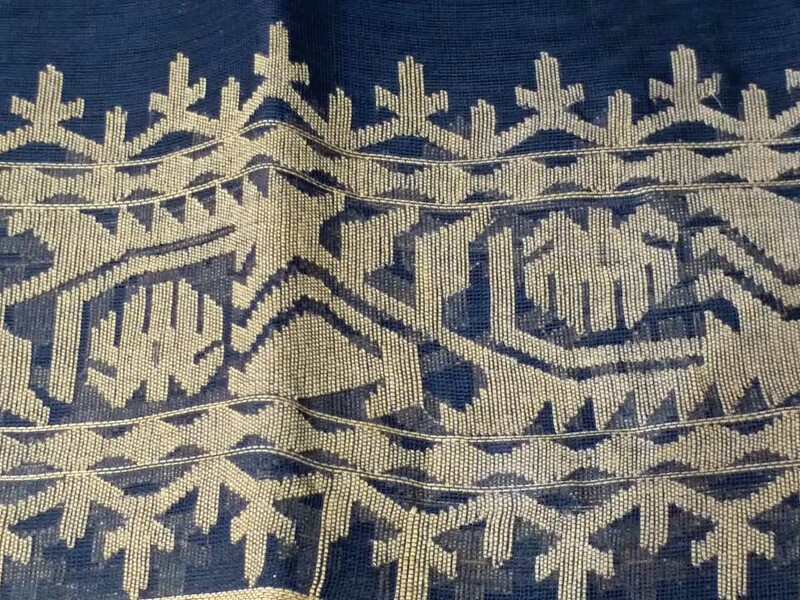 Weavers Studio will be showcase ‘Sari’ – the uncut cloth – like Bengal’s narrative Baluchari Silks, Batiks, Jamdanis and Kantha embroidered folk textiles. 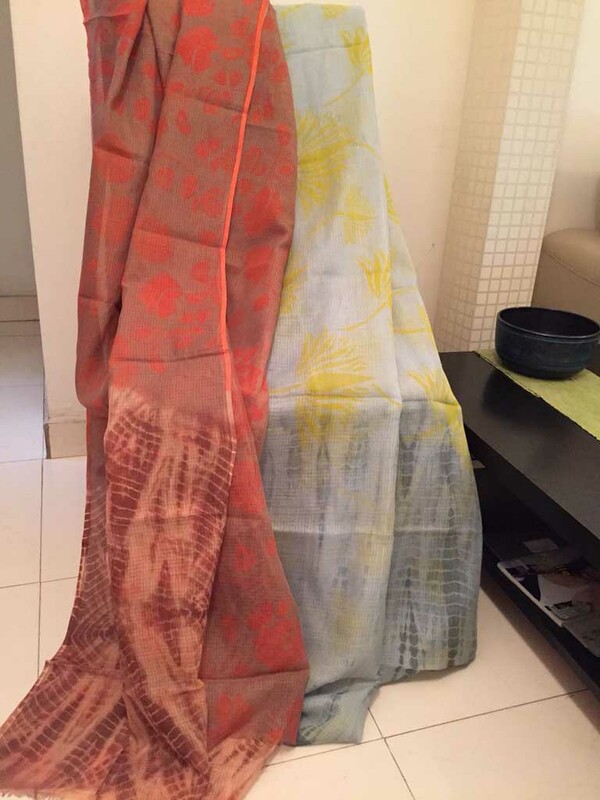 Collections in Natural dyes & Resist techniques along with shibori and block prints. 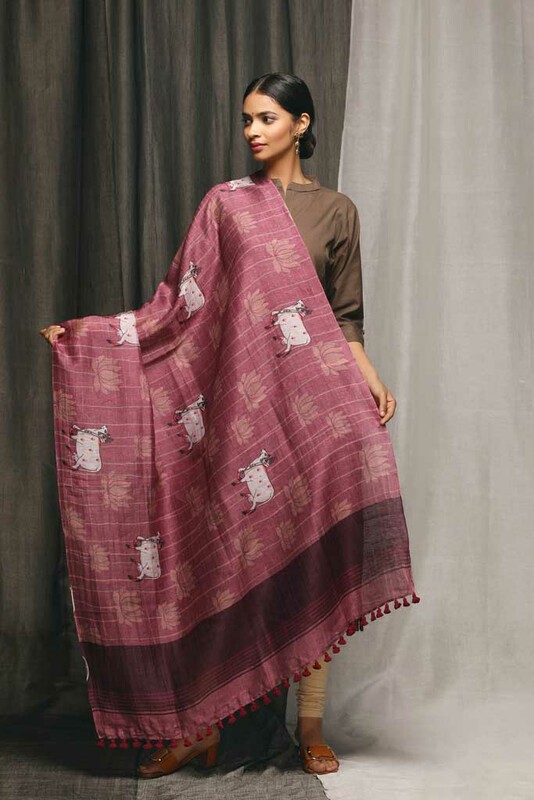 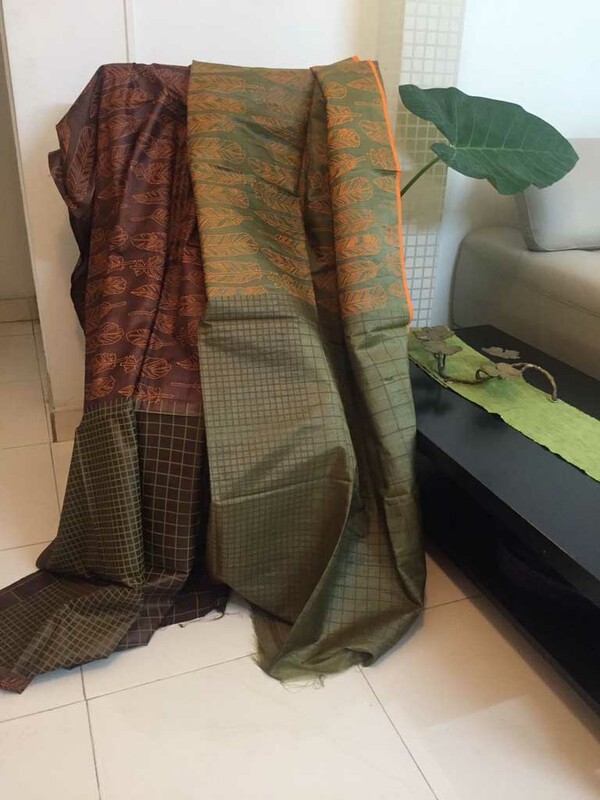 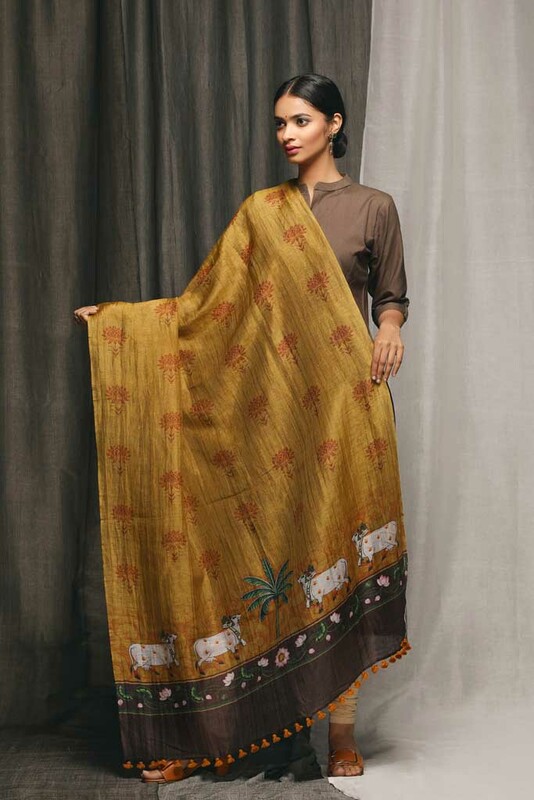 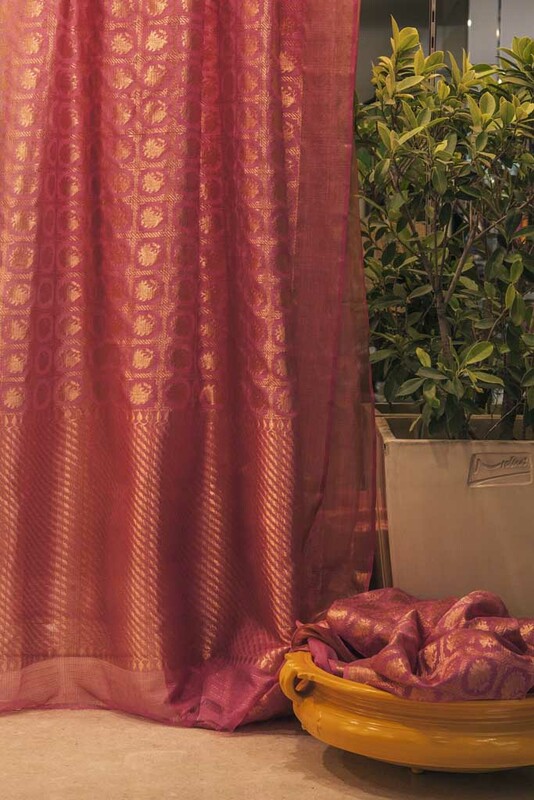 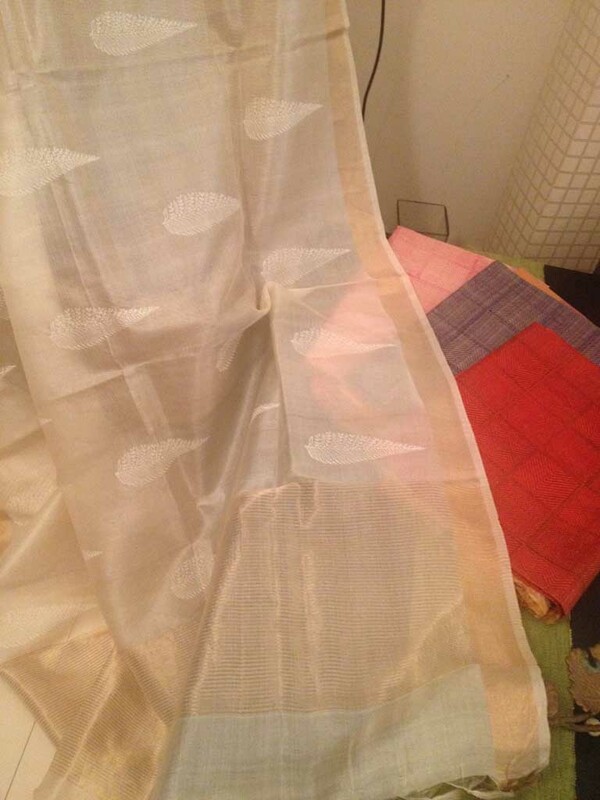 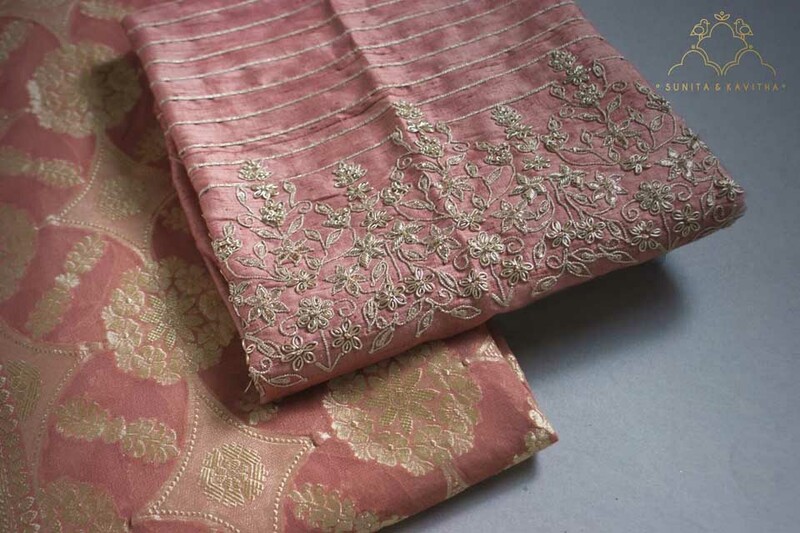 Kota and Benaras saris in soft gossamer cotton ‘khats’. 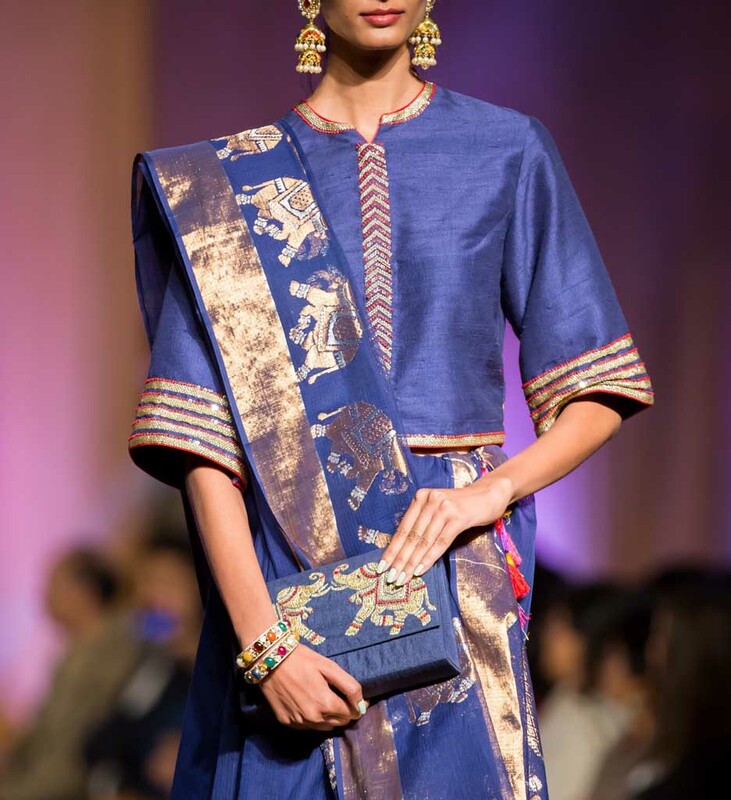 Her Pushkar mela and Chetak collections are exquisite while her jacquard collection, the ‘guthwa’ flowers and panch ‘butties’ are a salute to timeless traditions. 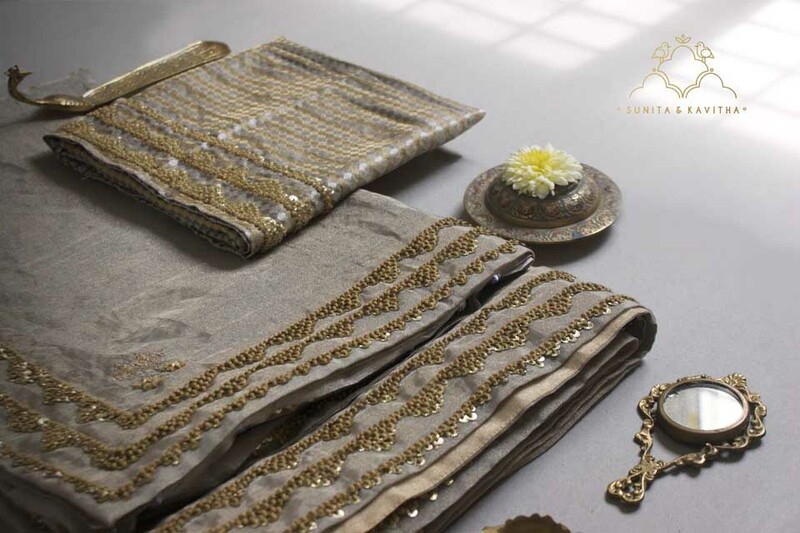 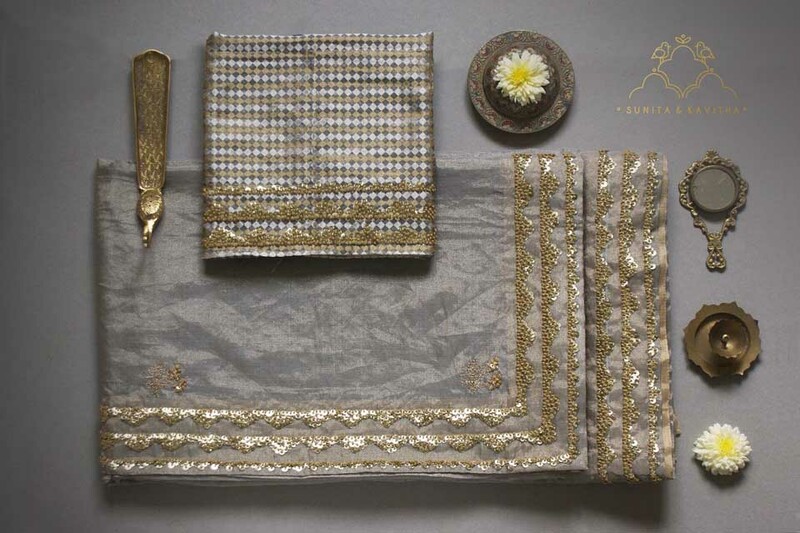 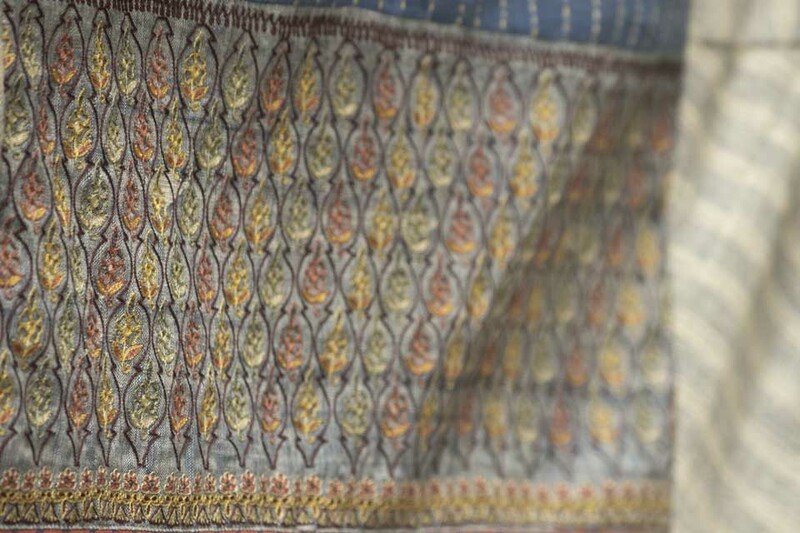 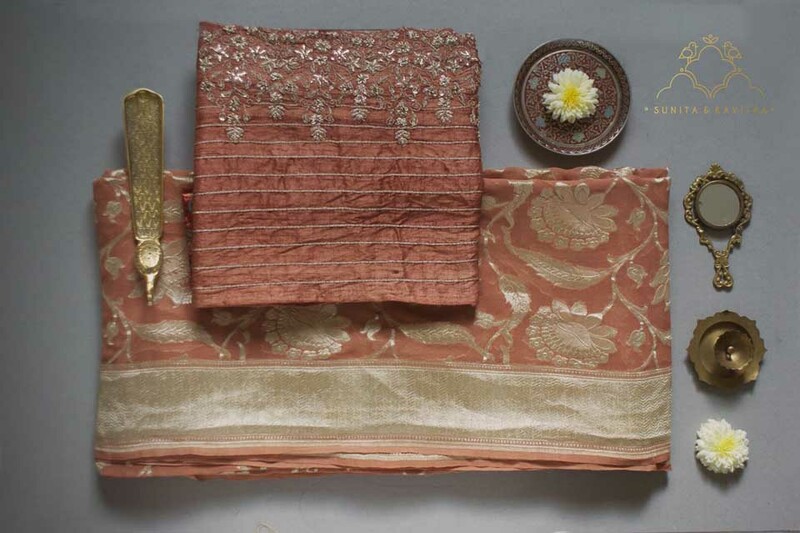 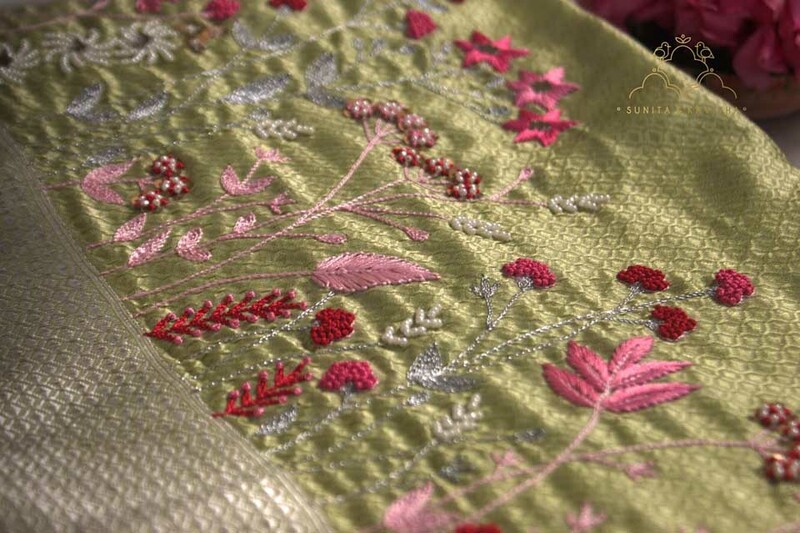 The piece dé resistence is the stunning half silver-half gold-real zari ‘jaali’ along with tissue embroideries. 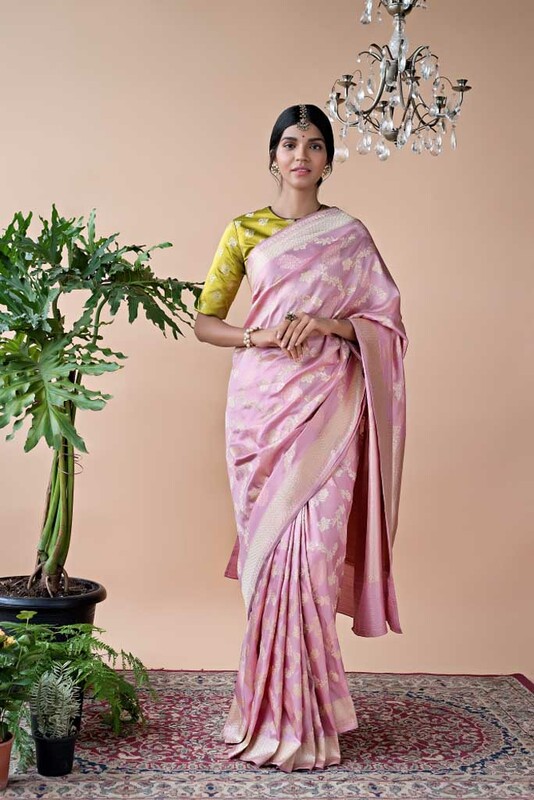 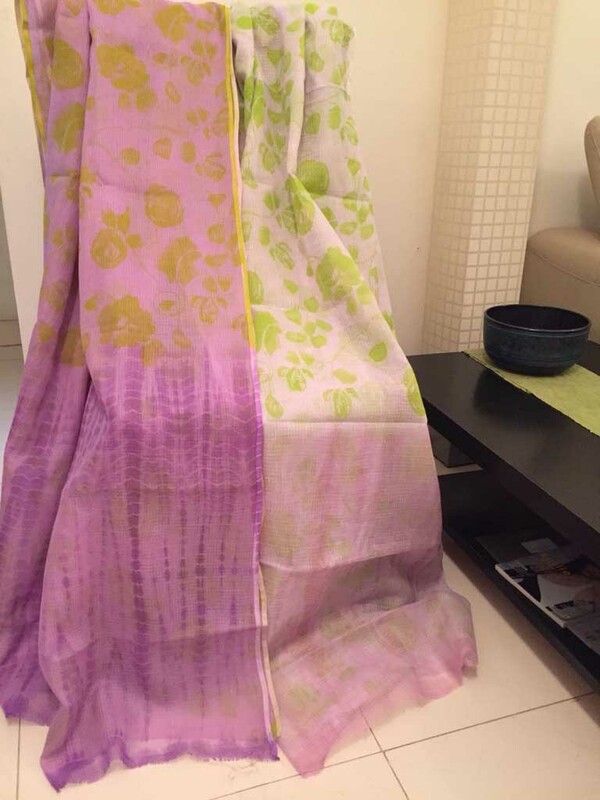 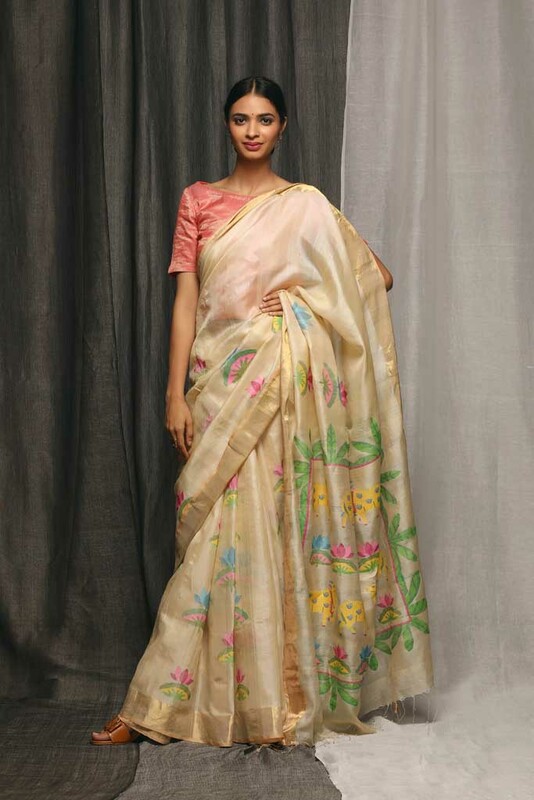 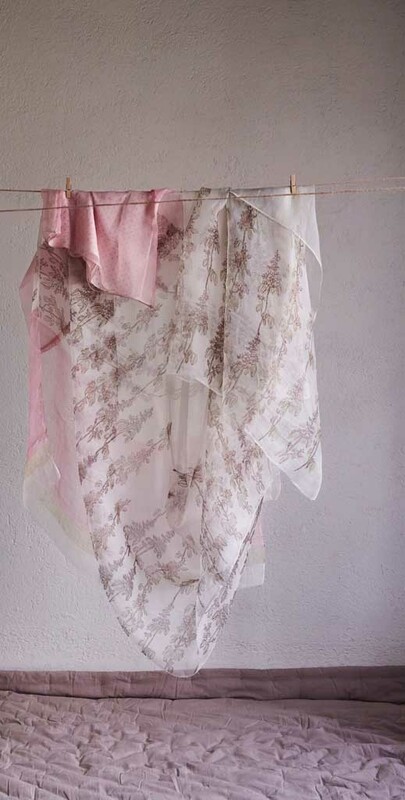 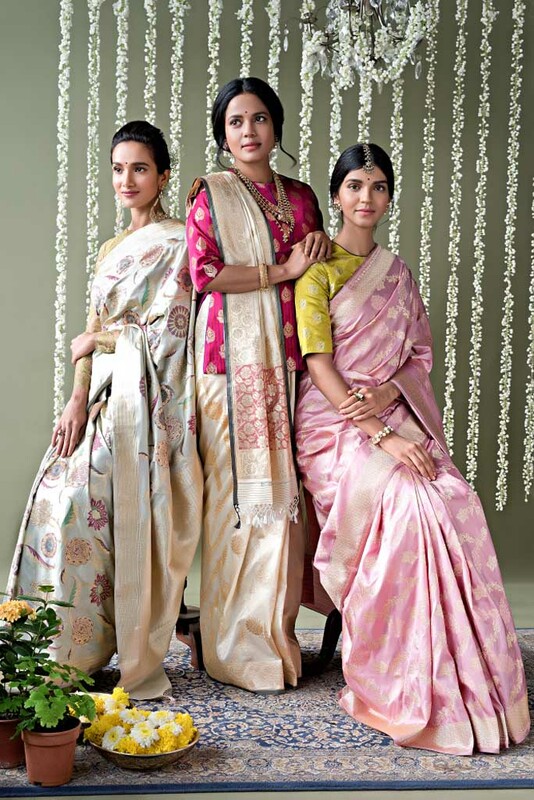 Meticulously woven collection of cotton and linen saris in soft pastel hues with pastels which mimic watercolours. 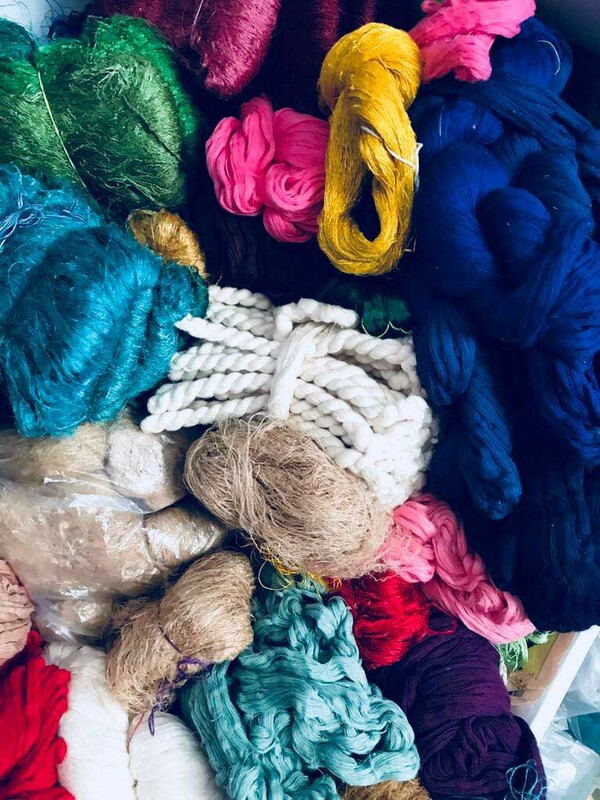 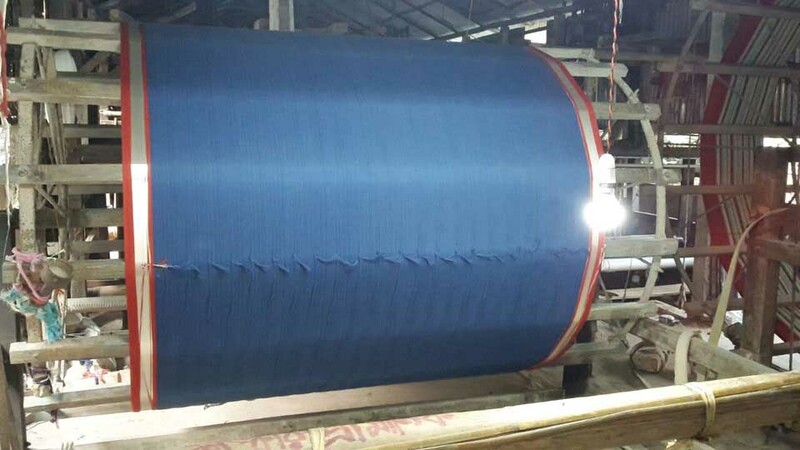 Many fabric mix, techniques of dyeing and surface ornamentation from different parts of the country. 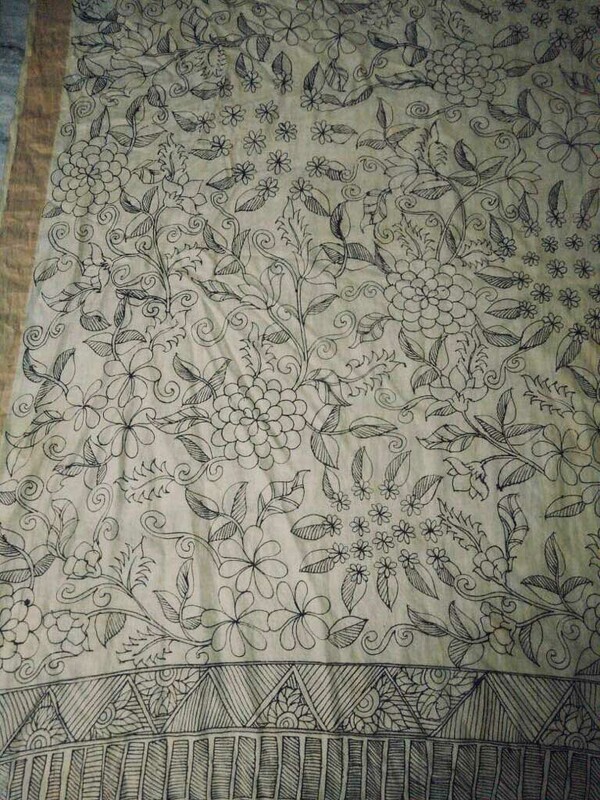 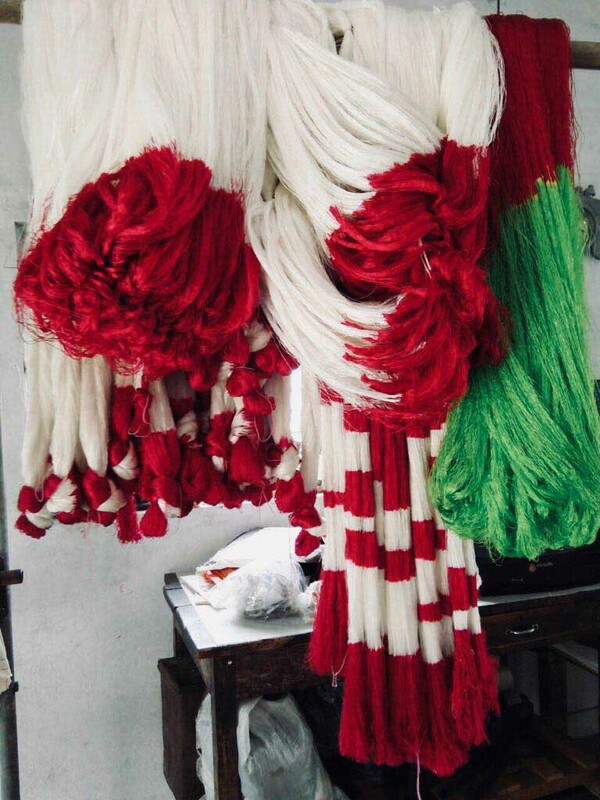 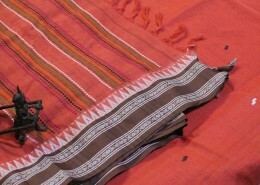 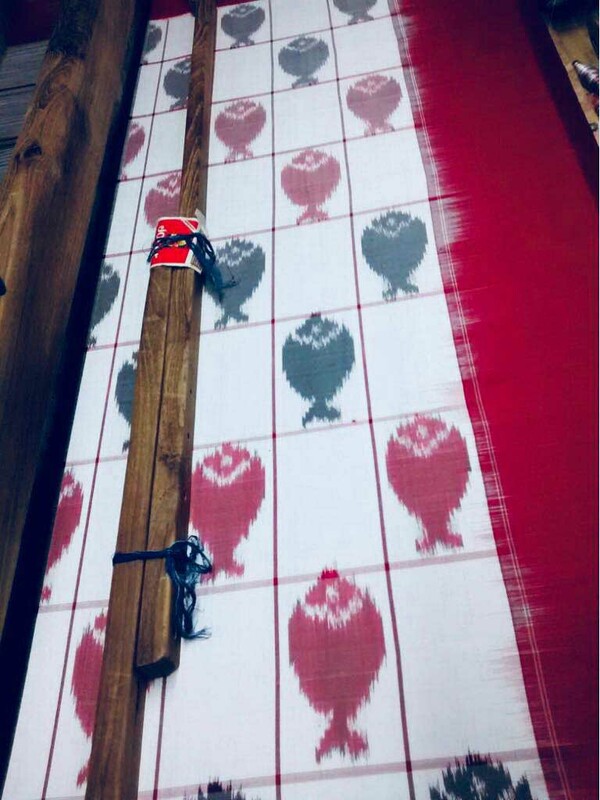 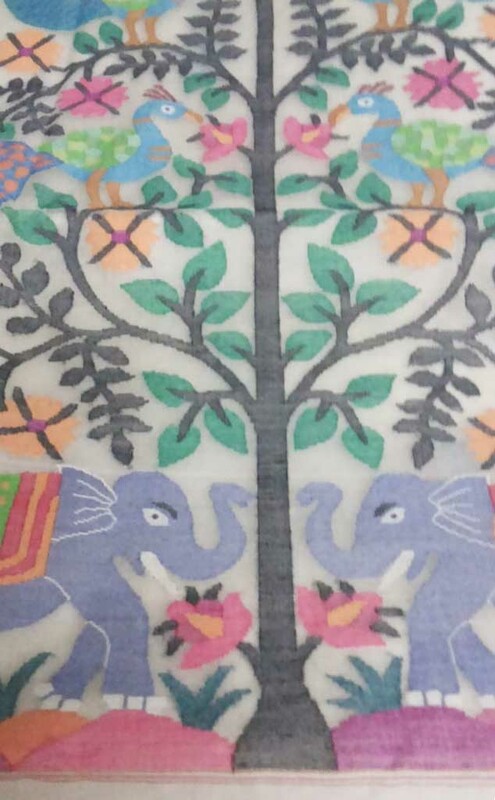 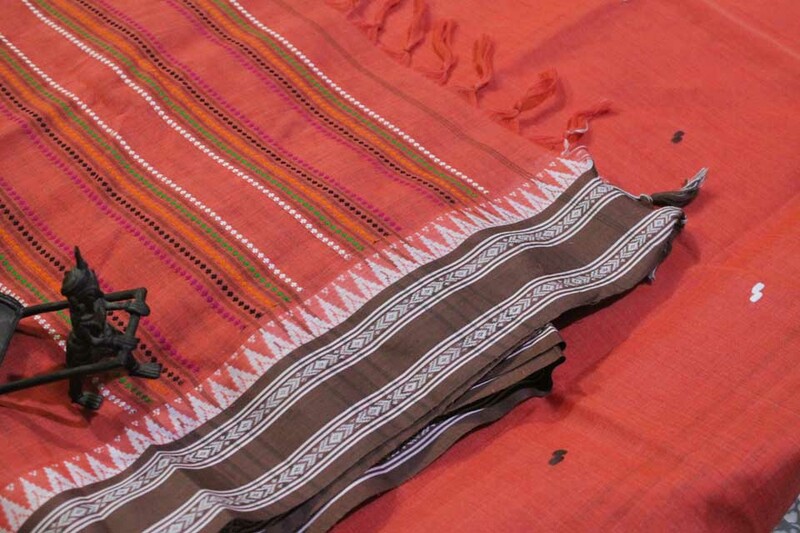 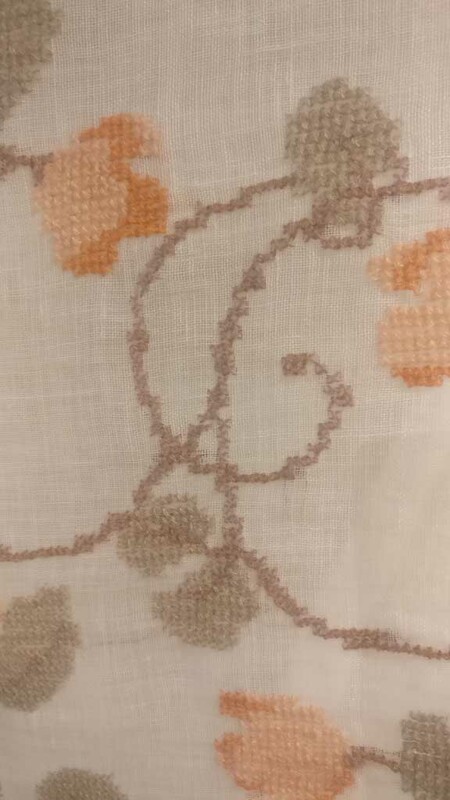 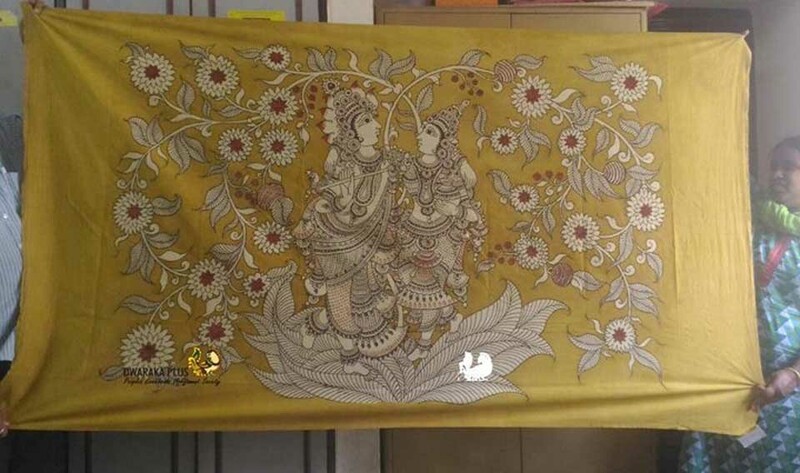 handloom and silk authenticity details. 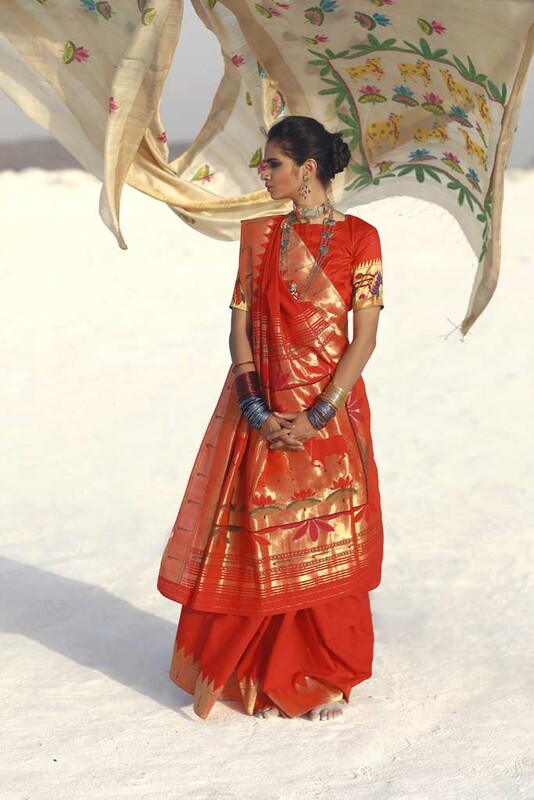 Statement saris through weaves and embroidery. 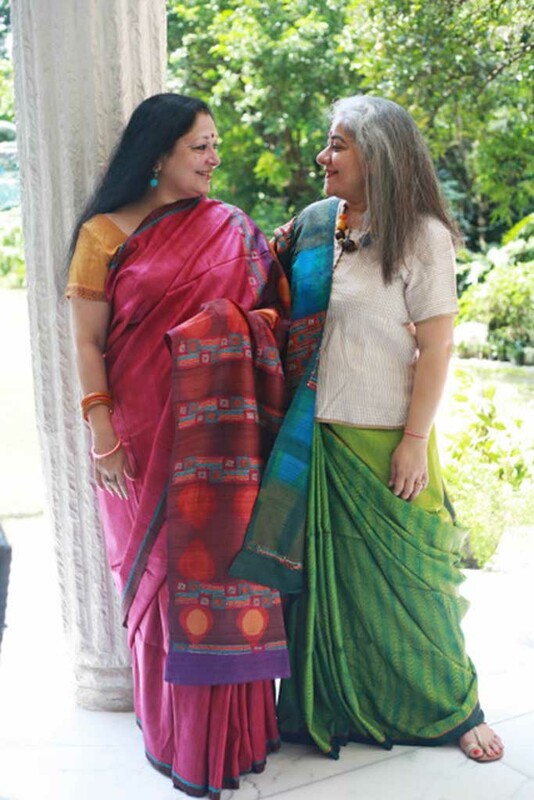 Linen saris in soft shades and traditional Benarasis in vibrant hues. 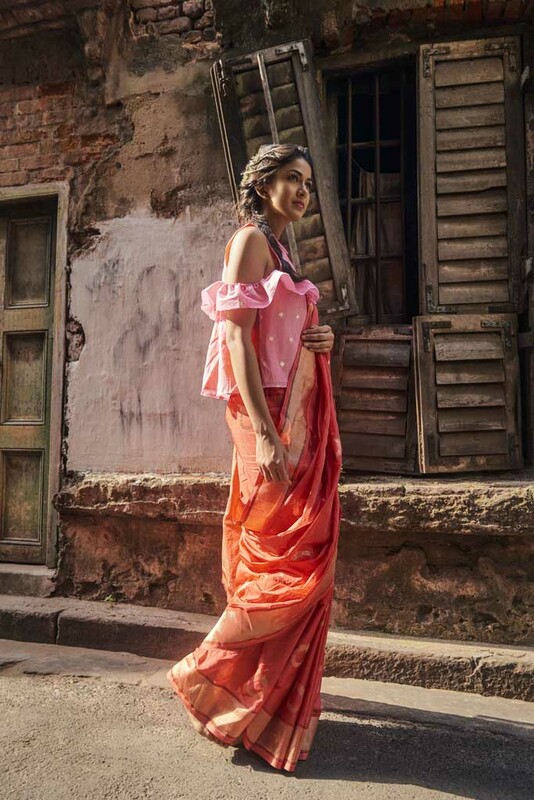 Saris are paired with blouses with traditional Indian embroideries like zardosi, dori and thread embroidery but with a modern twist. 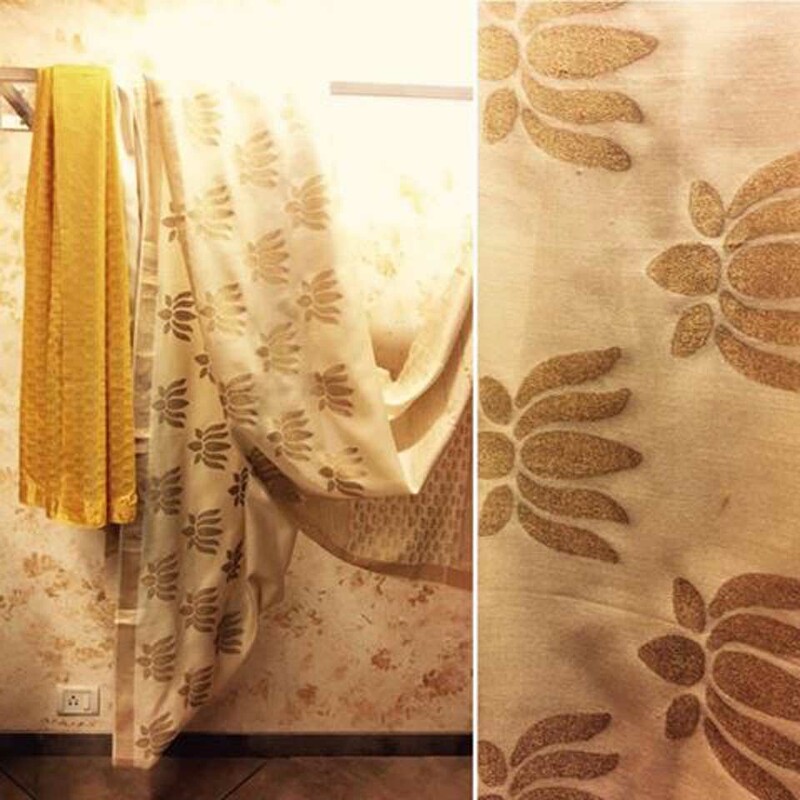 Exclusive weaves and prints on tussar, cotton, kota and linen to create saris with a unique look. 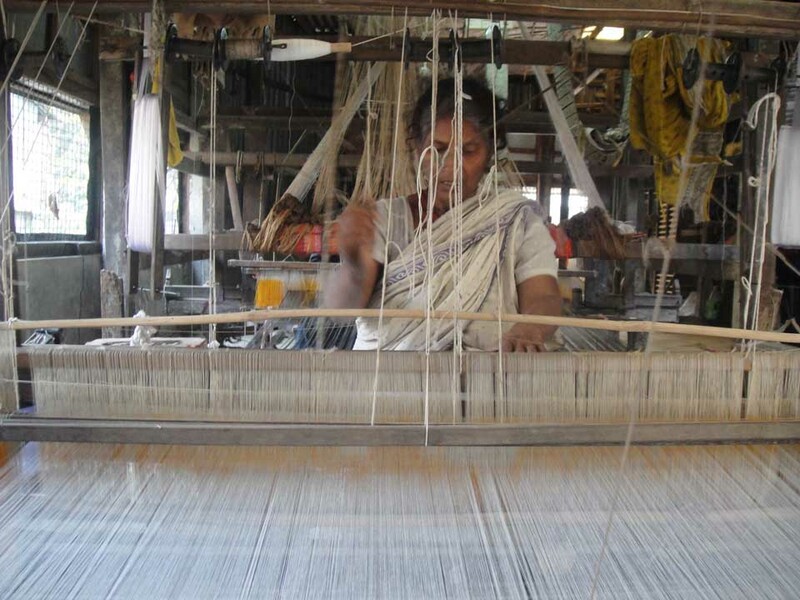 They work with weavers from Bhagalpur, Champa and Kota. 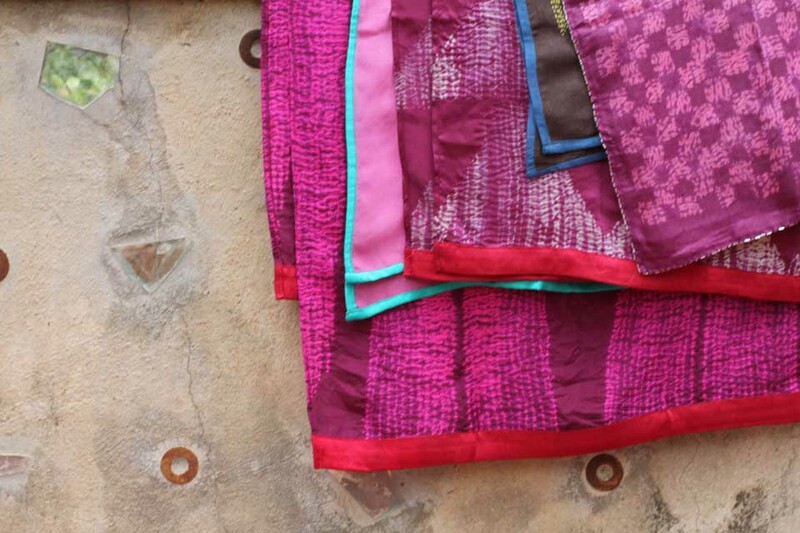 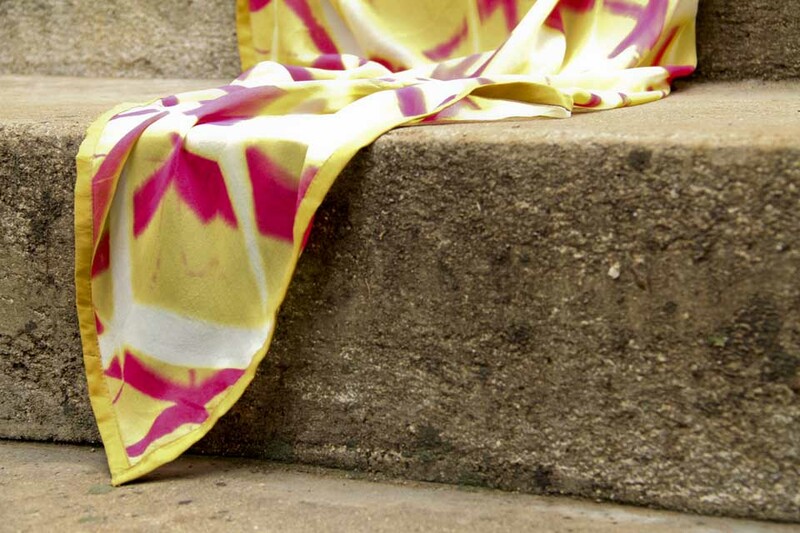 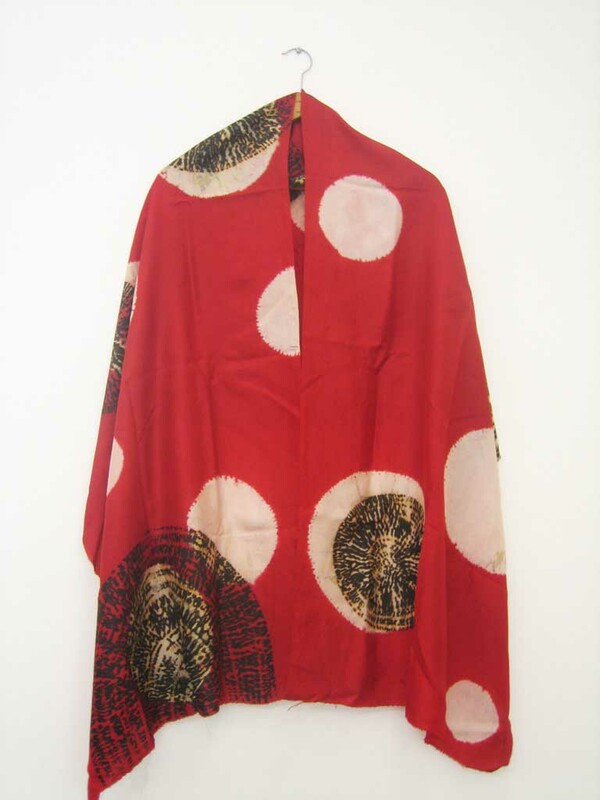 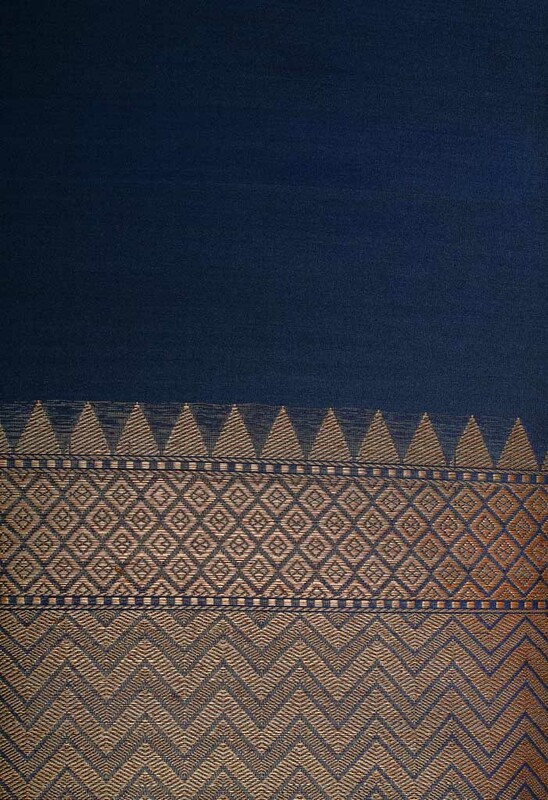 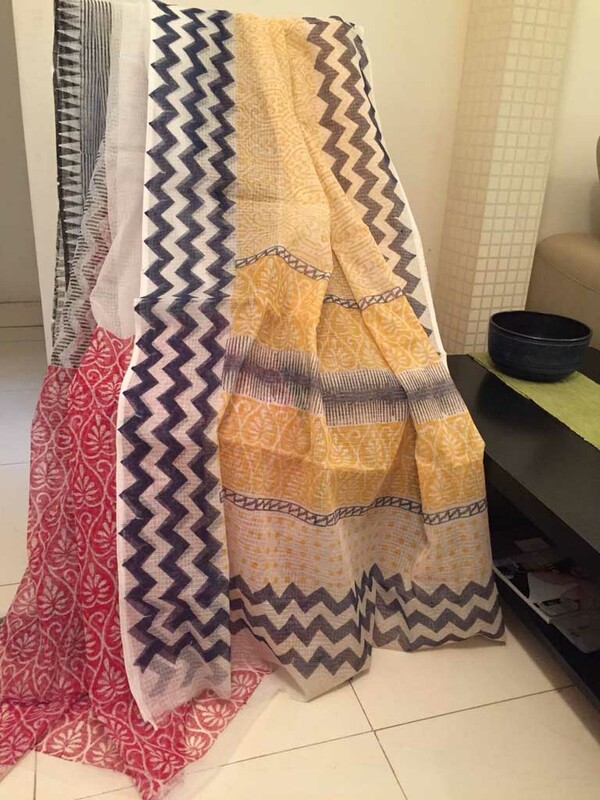 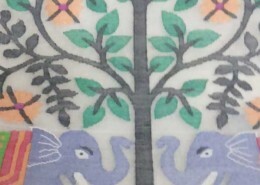 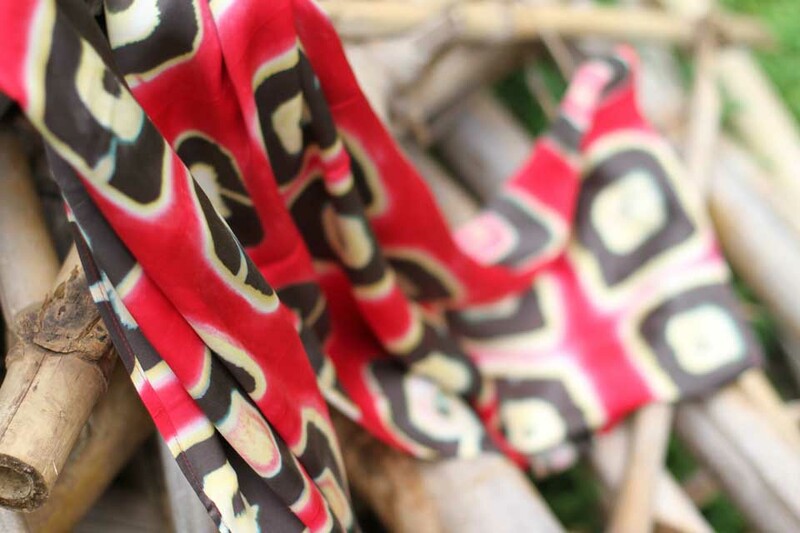 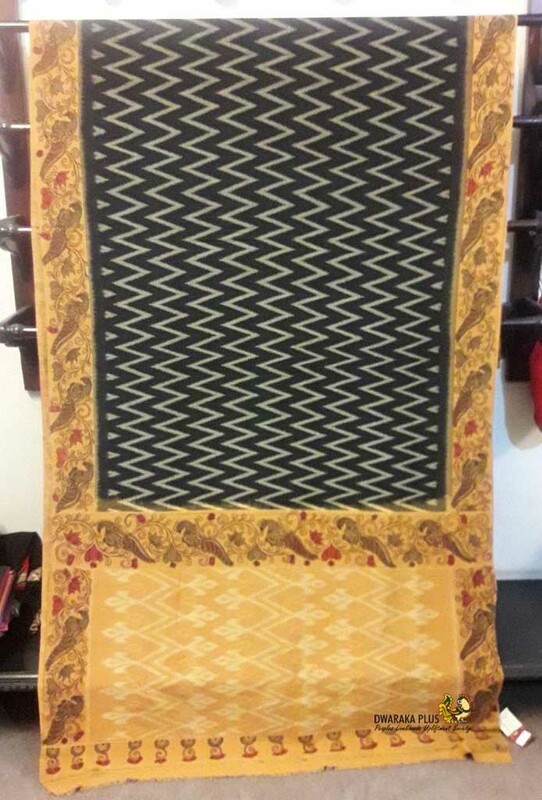 Designer Sujata presents lyrical block printed hand woven saris, stoles and fabrics. 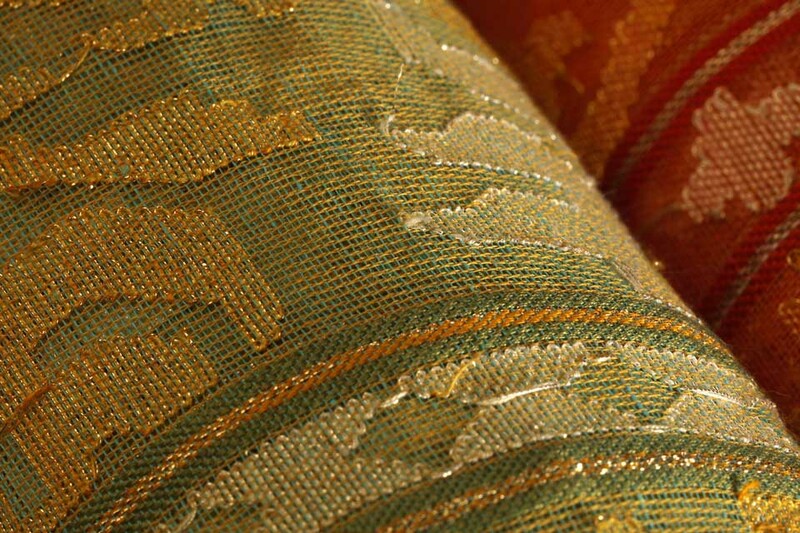 Touches of Cambodian and Thai design sensibilities make for very attractive textiles in jewel tones. 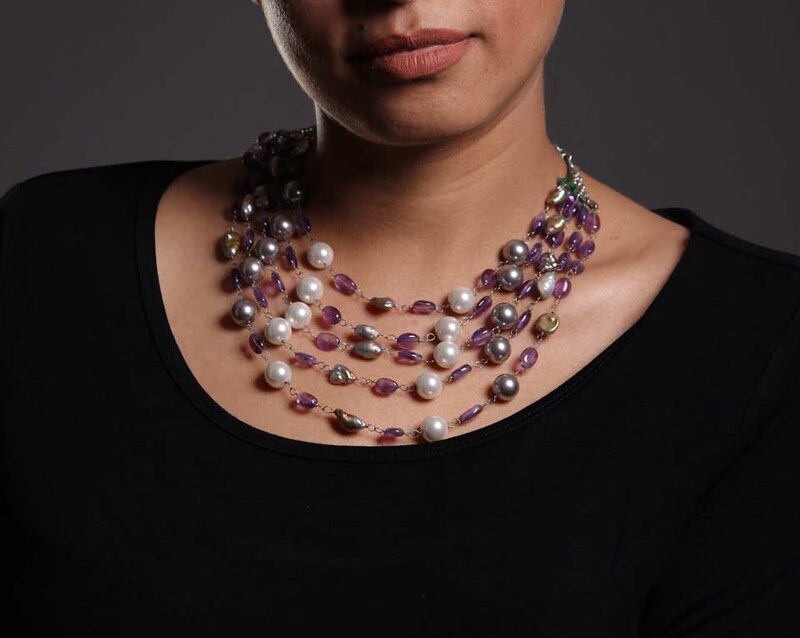 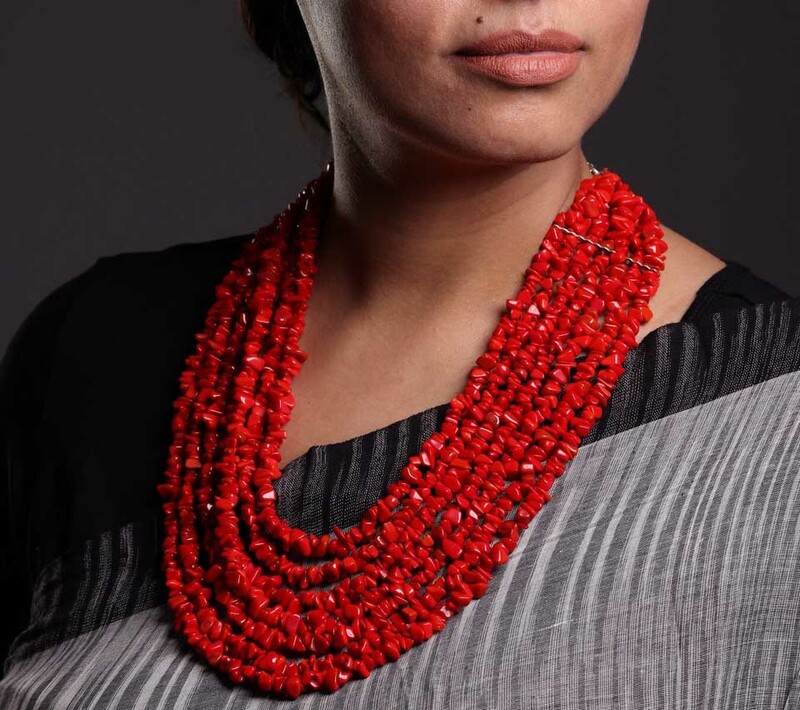 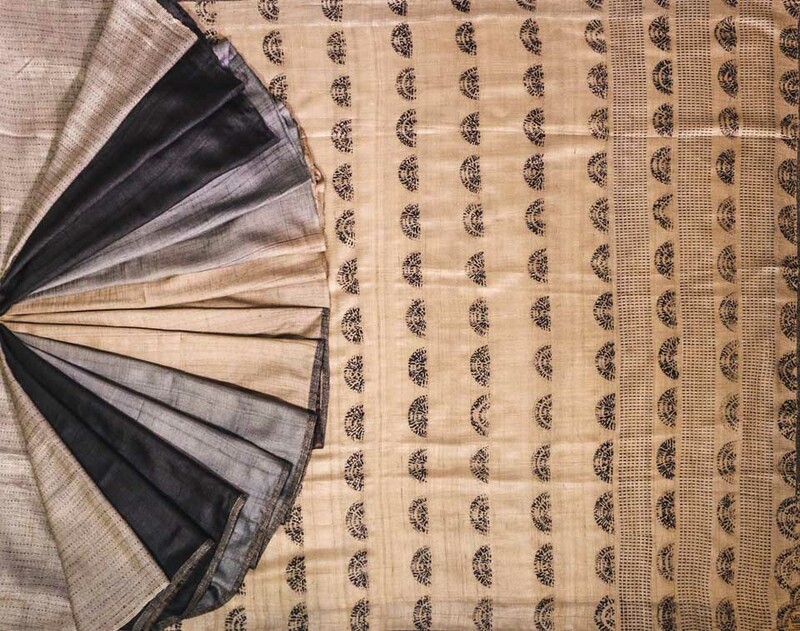 ON view will be the Zenana Collection curated by Purvi Patel. 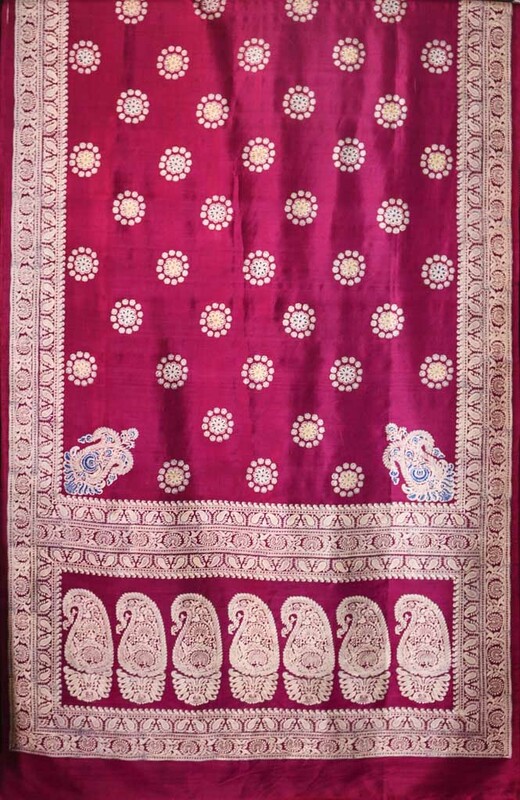 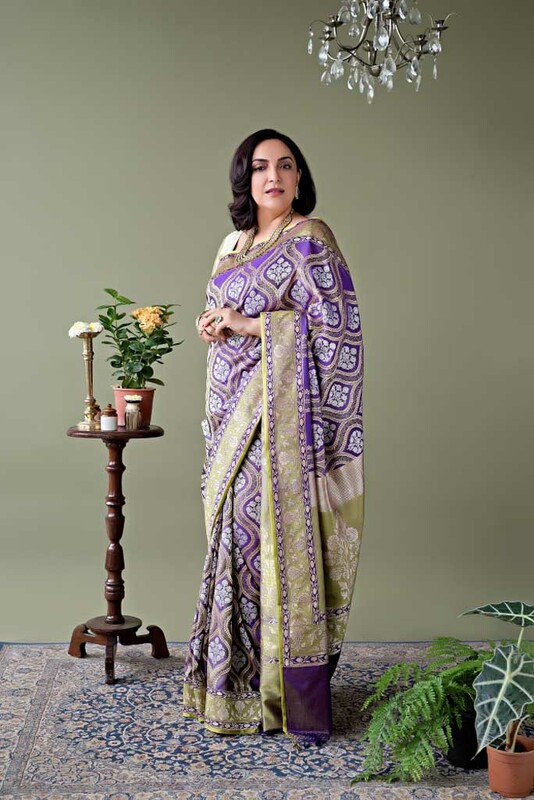 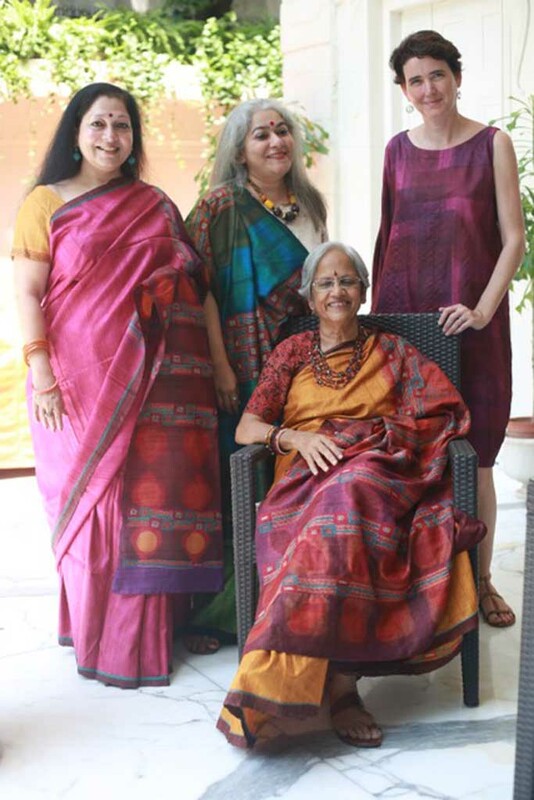 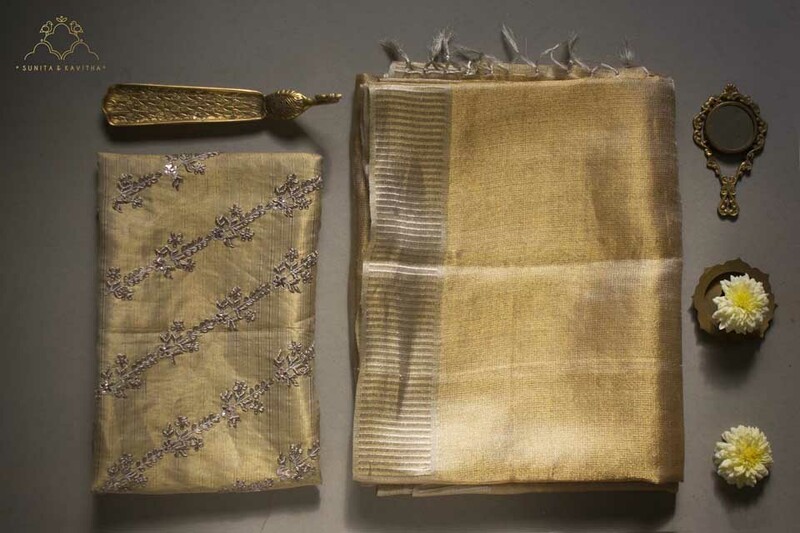 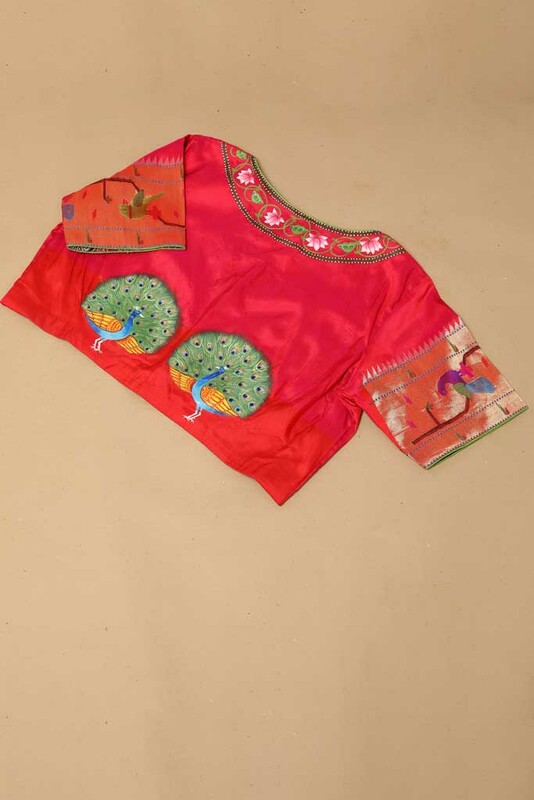 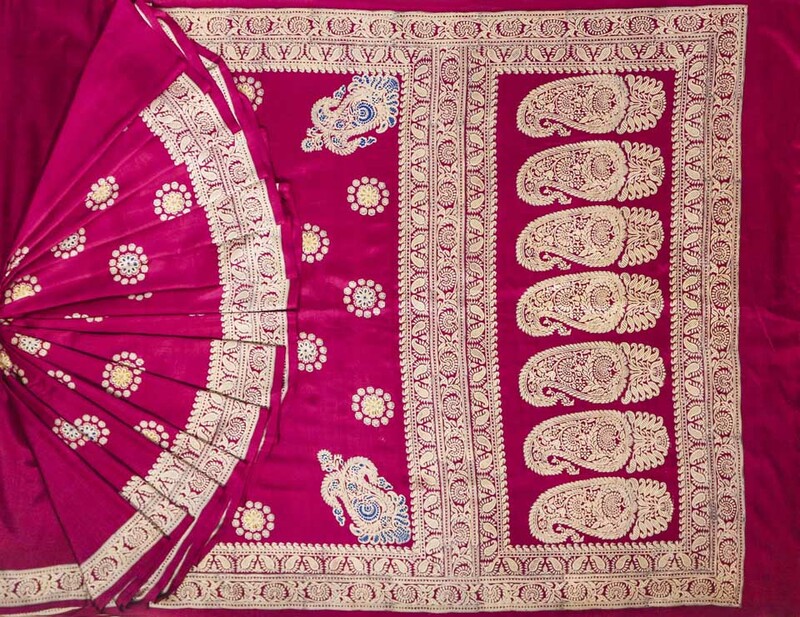 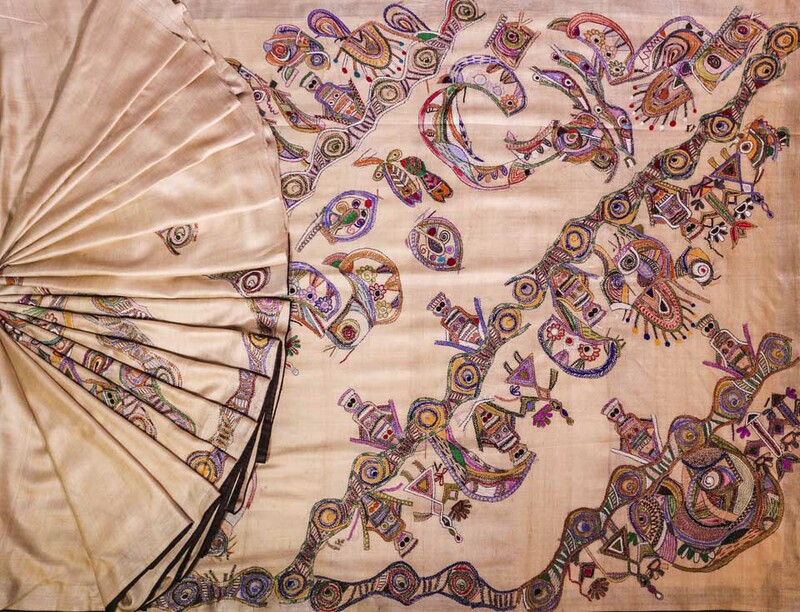 Purvi specialises in the revival of ancient embroidery forms such as “Kachi Marodi”, “Pakki Marodi”, “Myna Popat” and “Parsi Gara” on saris and fabric. 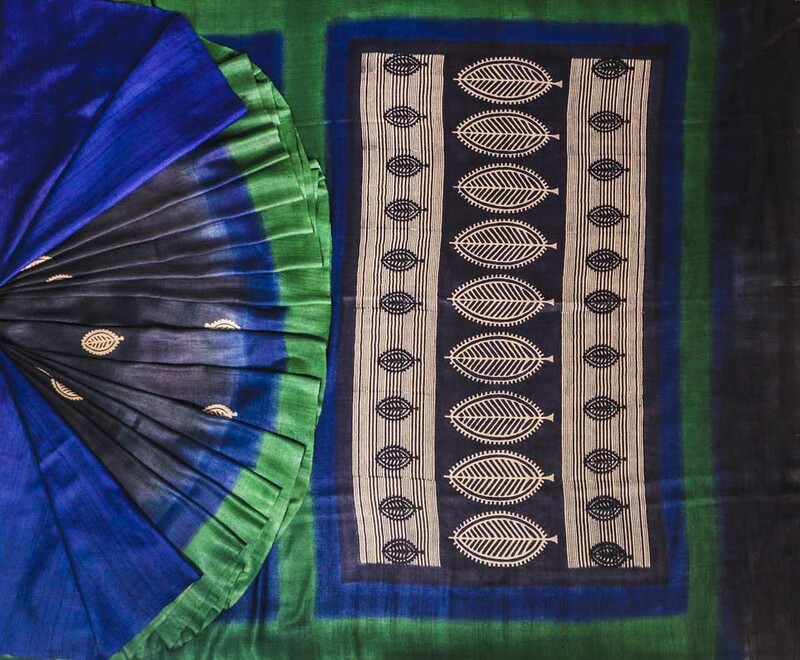 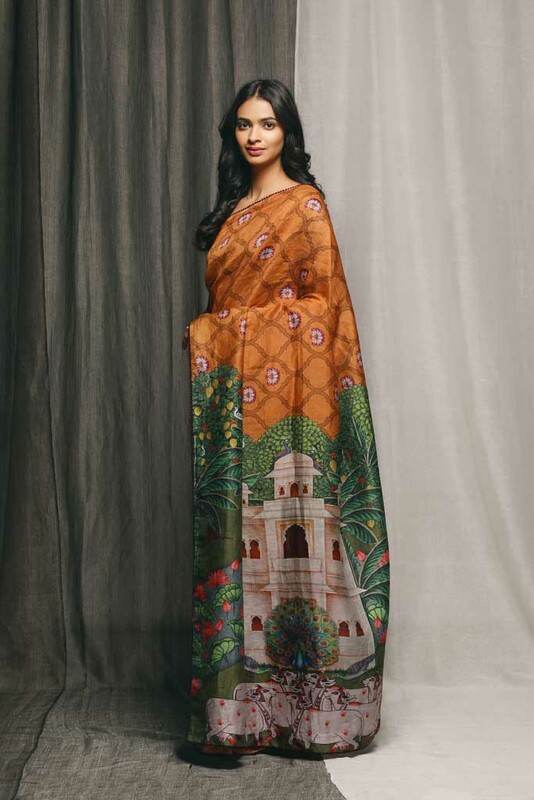 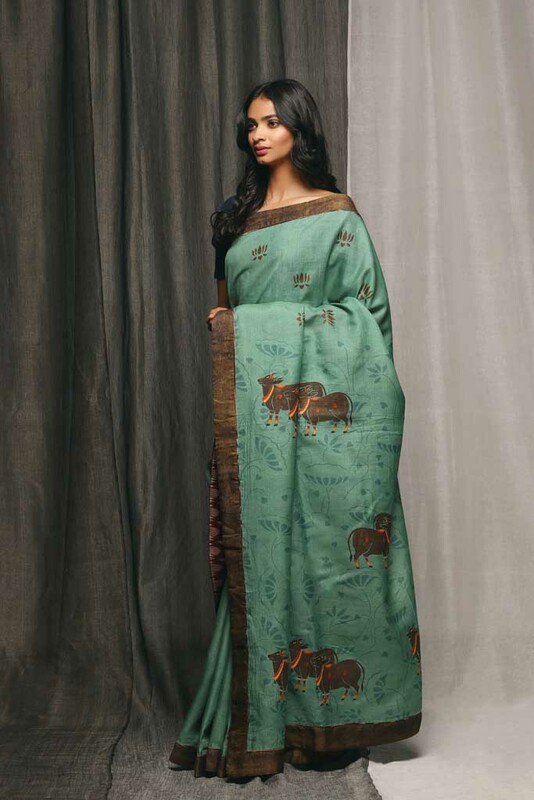 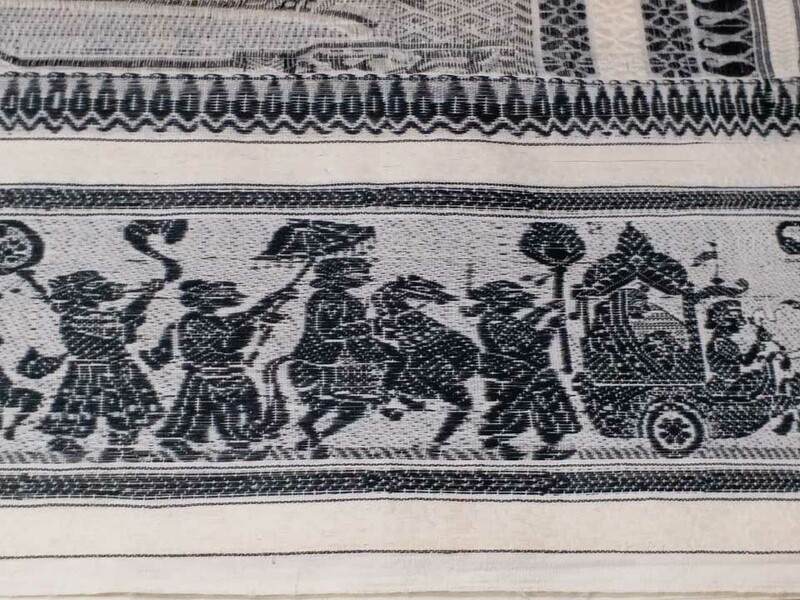 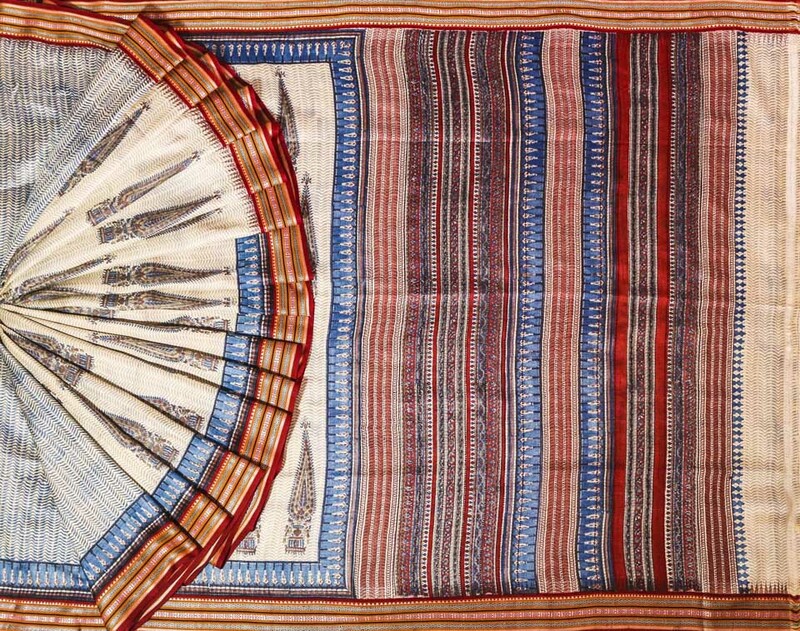 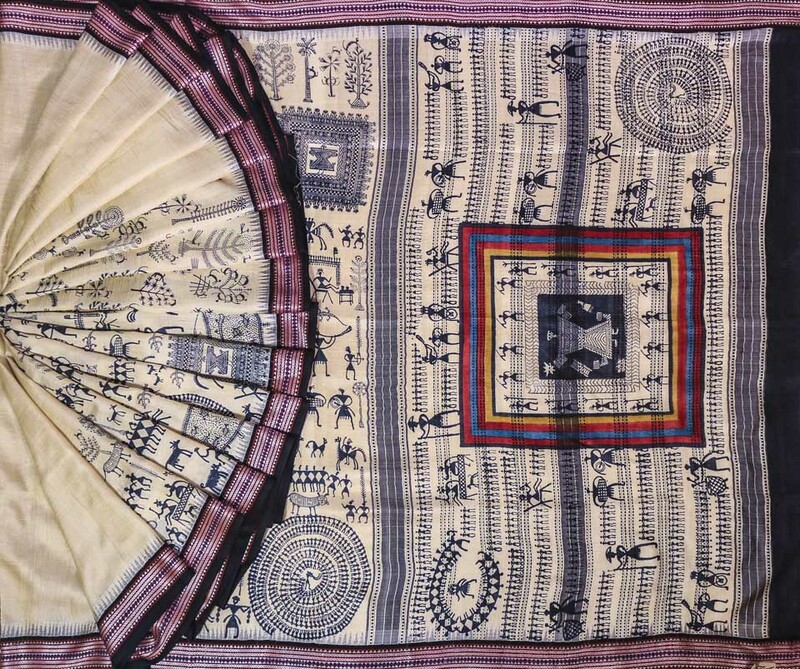 Iconic saris with ‘Pichwai’ paintings on the ‘pallus’ of tassar, jamdaani, linen and jute saris. 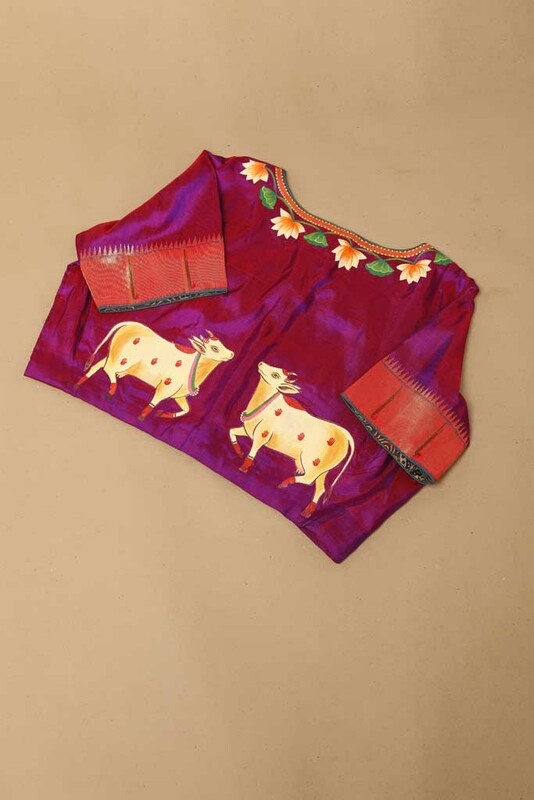 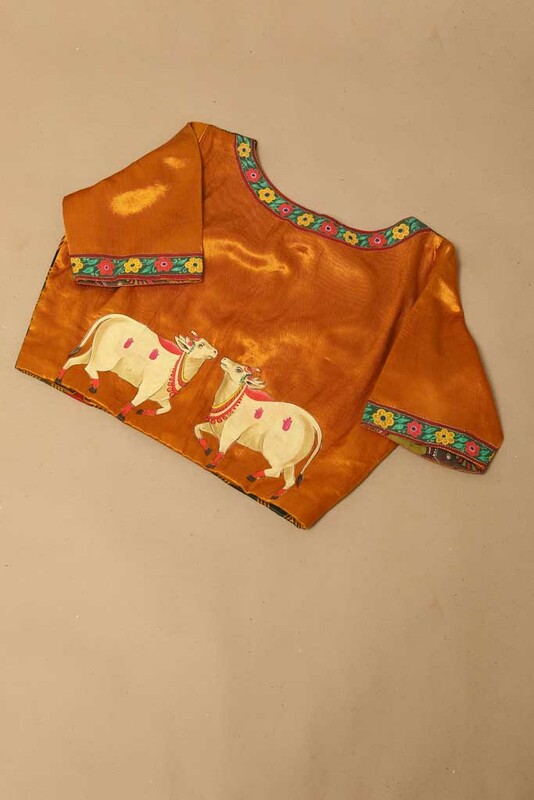 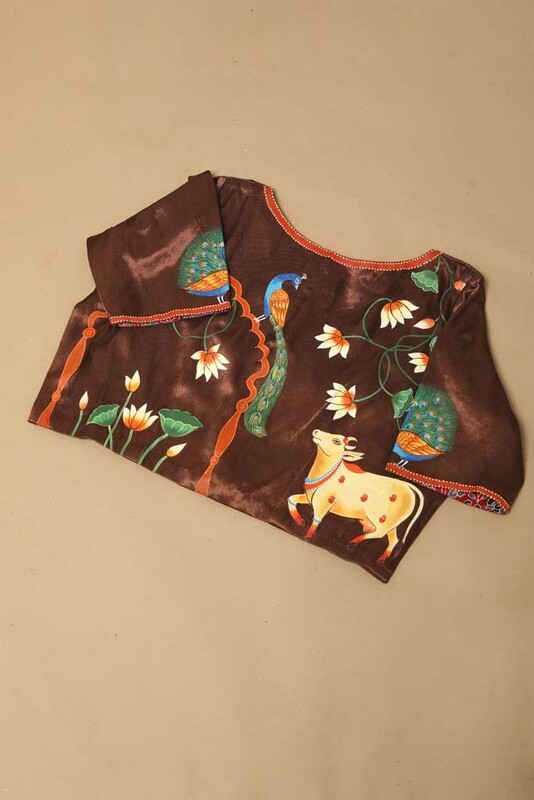 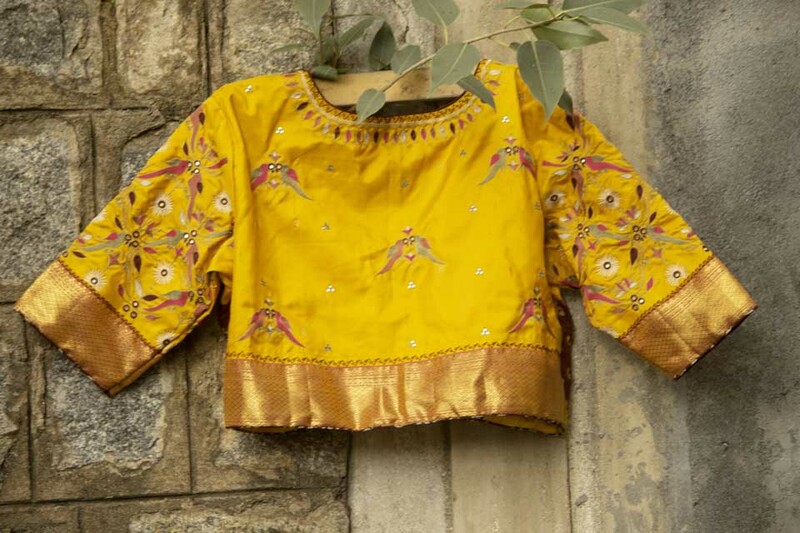 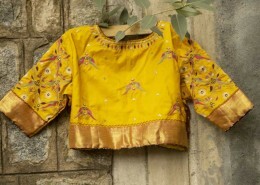 Trendy blouses with ajrakh, batik and colorful prints, also dramatic blouses in Paithani. 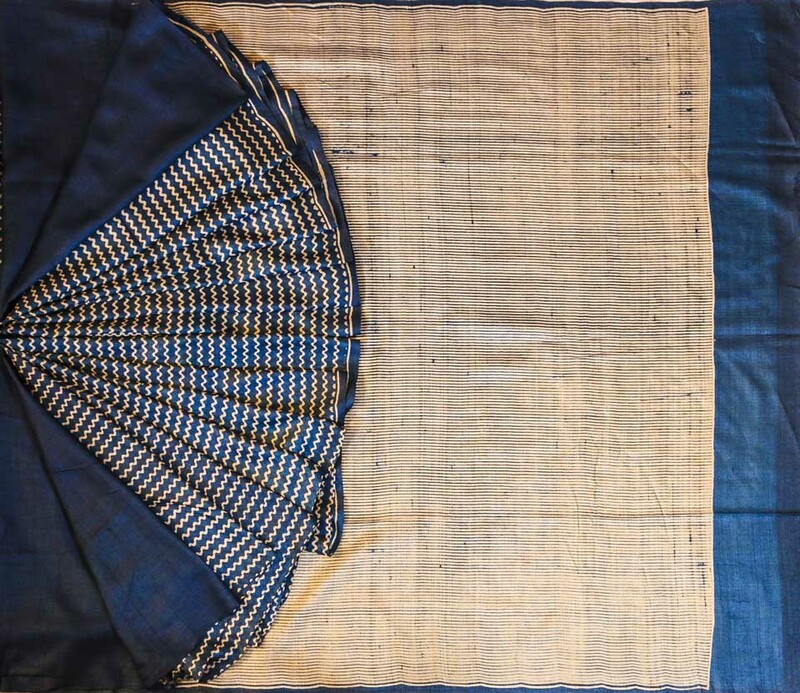 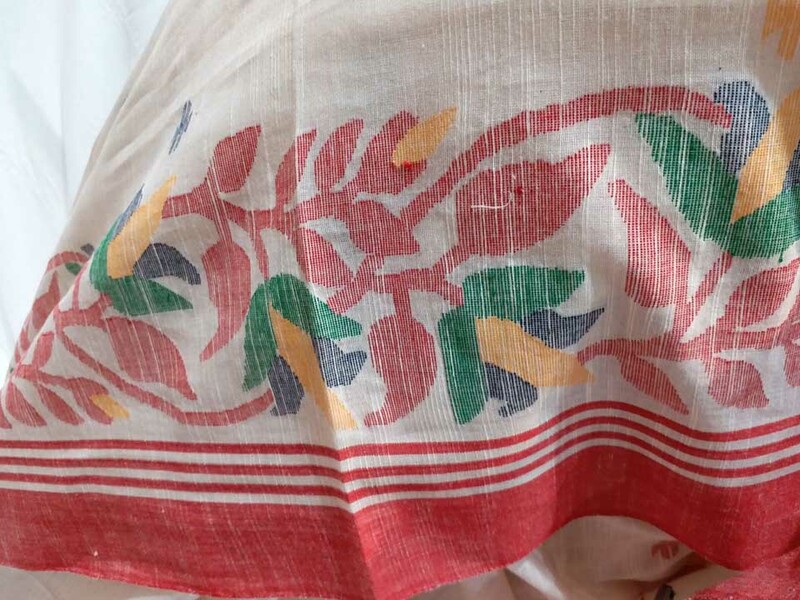 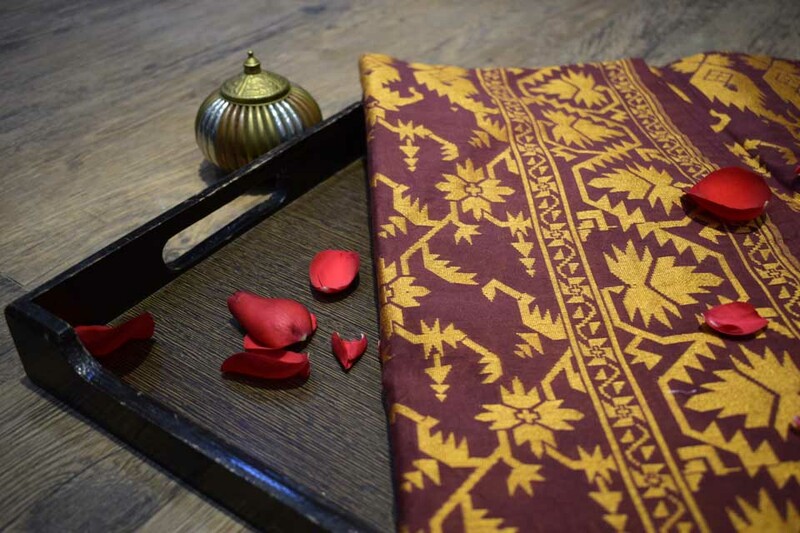 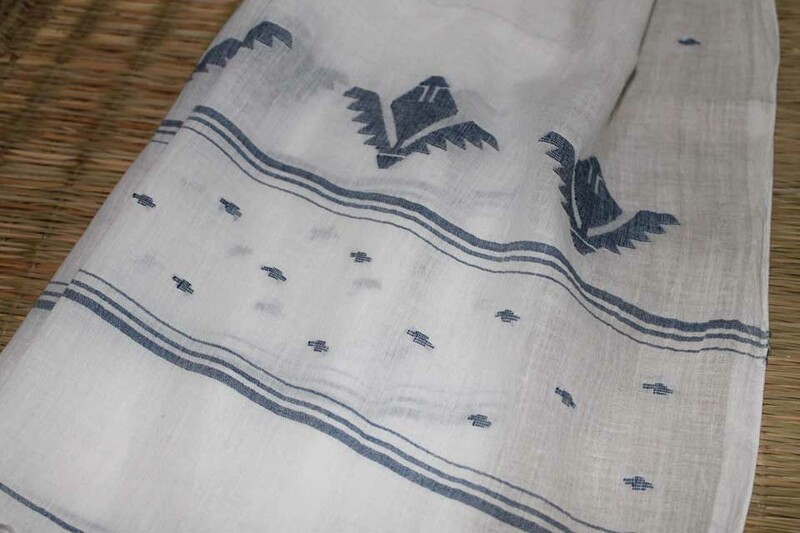 Nilambari saris are the products of a significant revival movement to bring back to life centuries old Benaras weaves, especially the jamdaani weave. 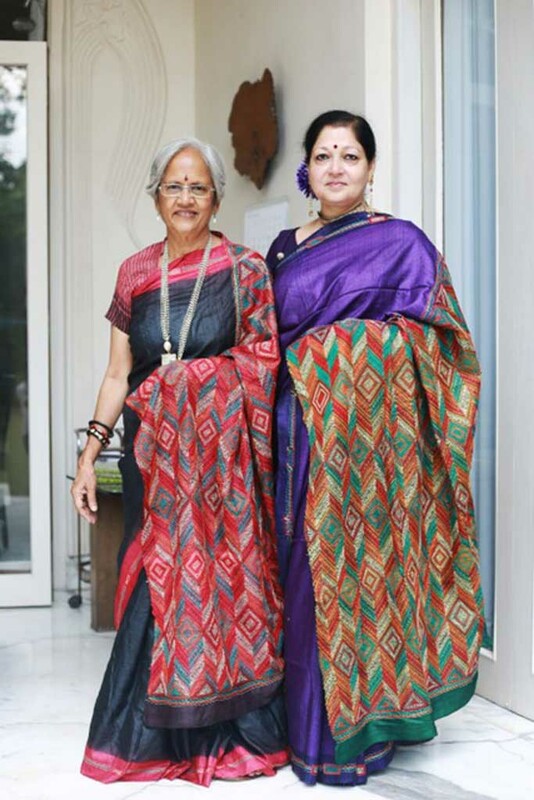 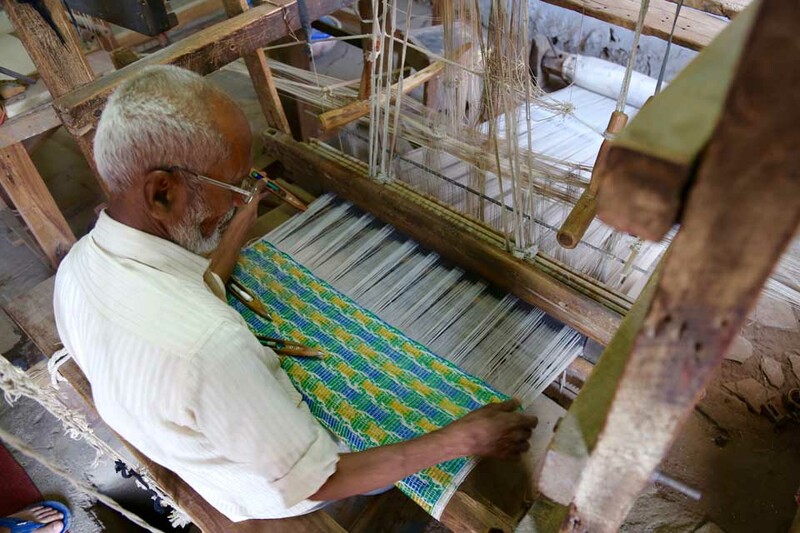 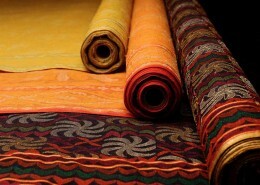 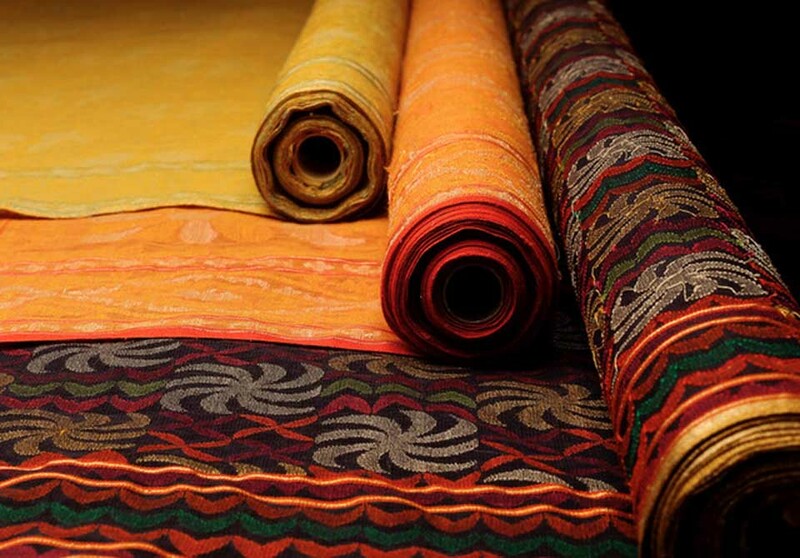 Nilambari sari weavers have won many National awards for their exquisite saris. 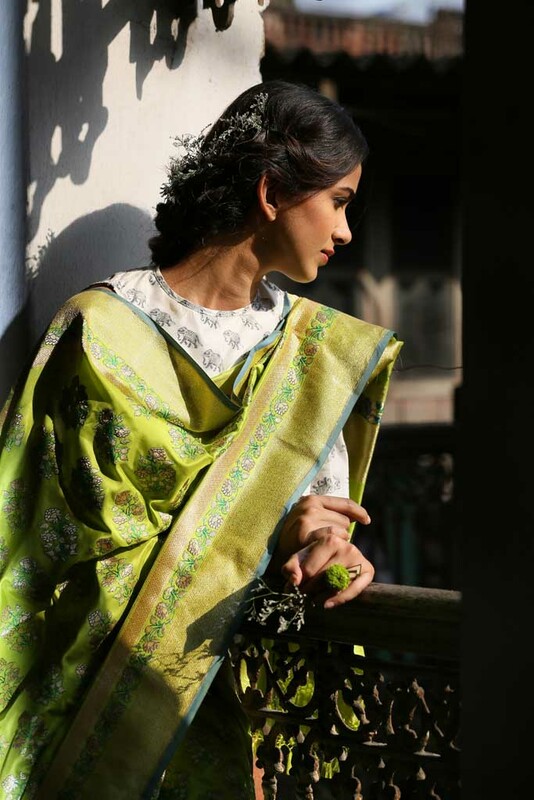 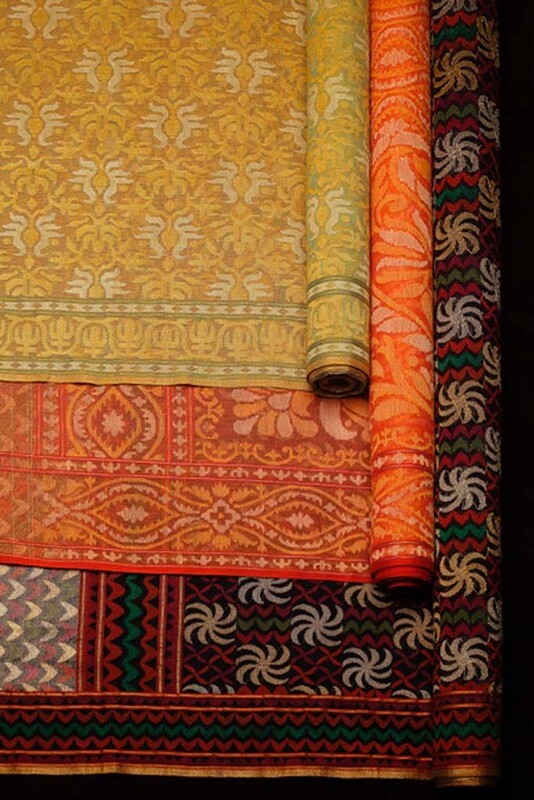 Meera Basu presents Bengal handlooms in variegated shades and contemporary formats rooted in tradition. 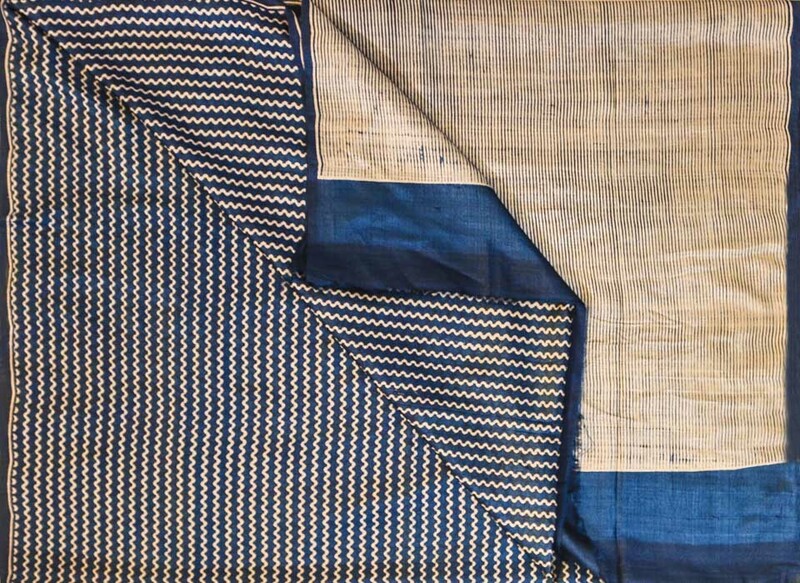 Handwoven, hand embroidered and hand block printed contemporary designs and formats on pure ‘gachchi’ tussar and mulberry silk from Puruha. 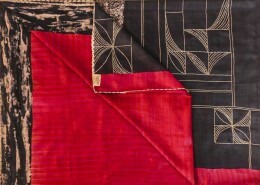 The usage of metal blocks gives a unique look to saris and to kanta saris teamed with pure zari embroidery. 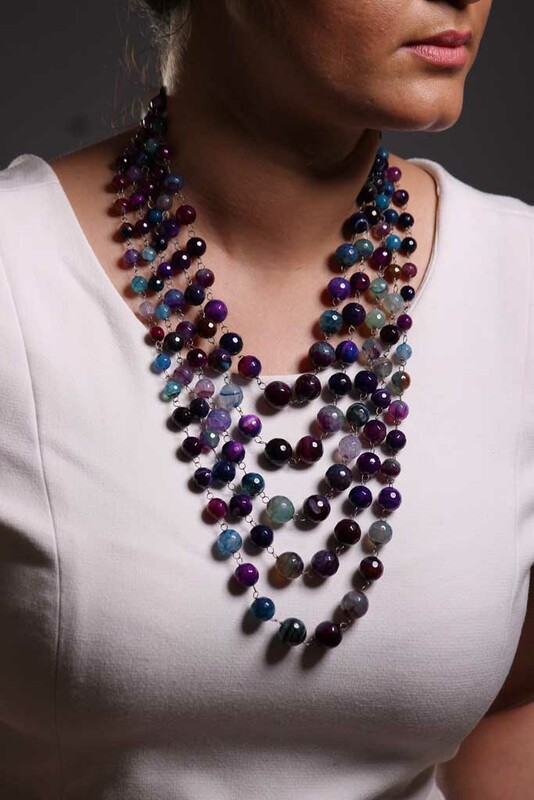 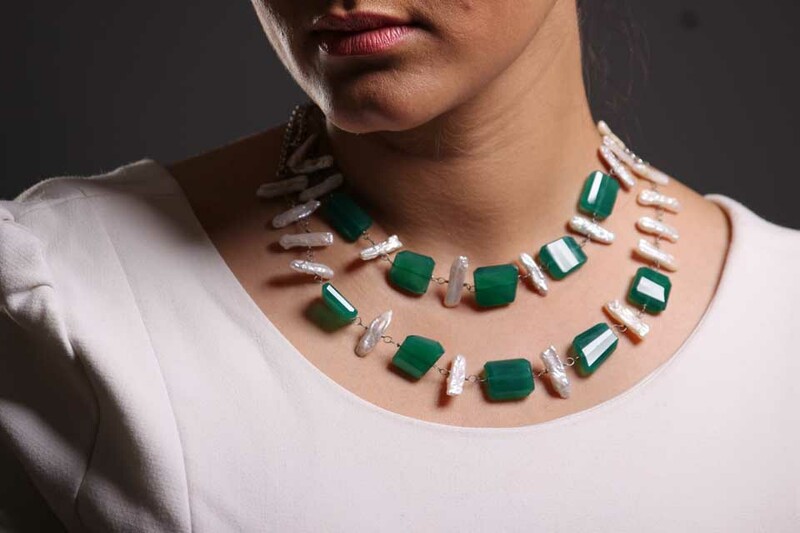 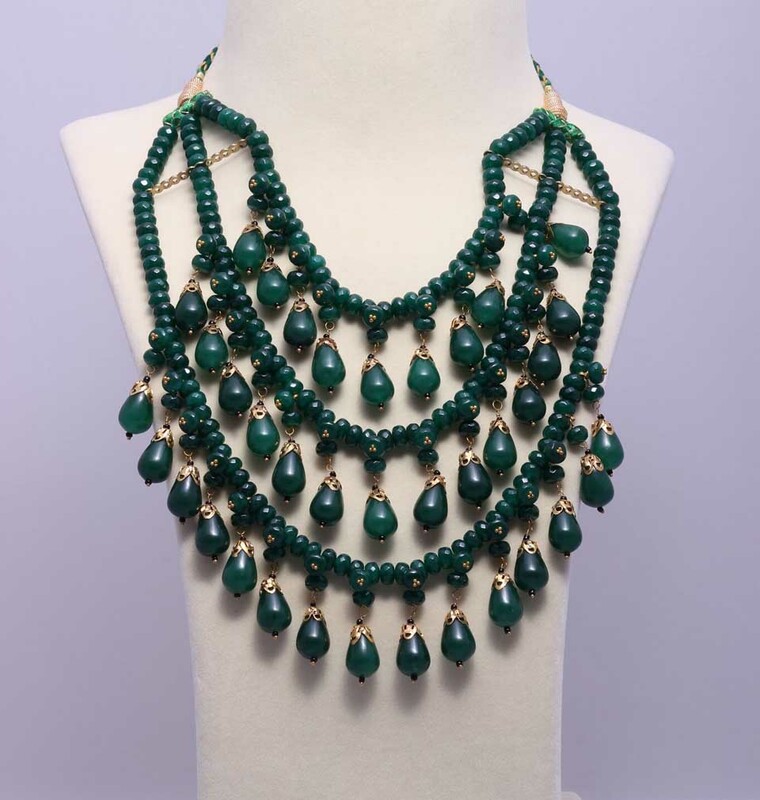 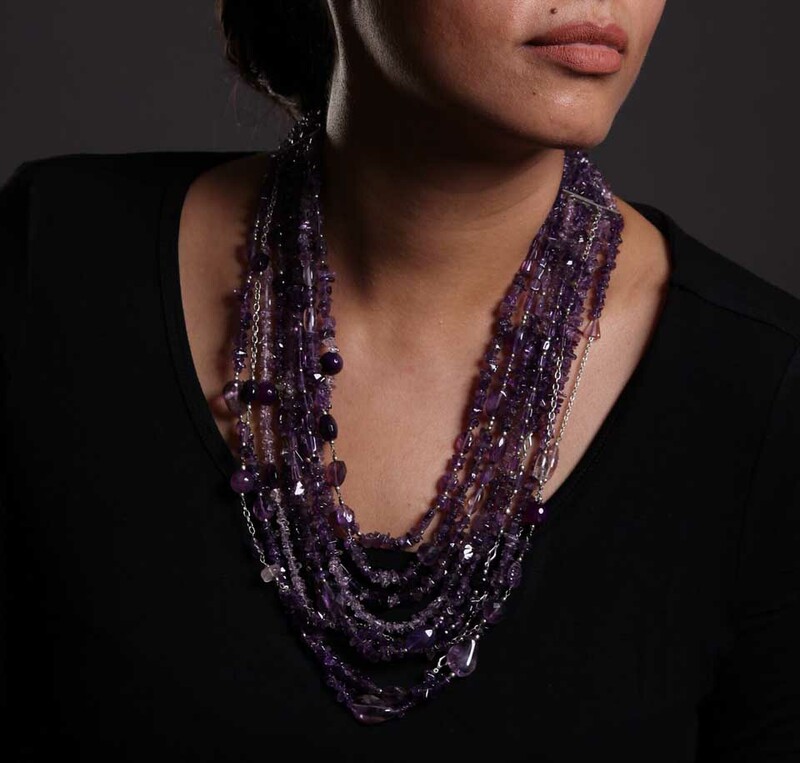 Handcrafted certified gemstone jewellery with chakra healing properties created by Jaipur artisans. 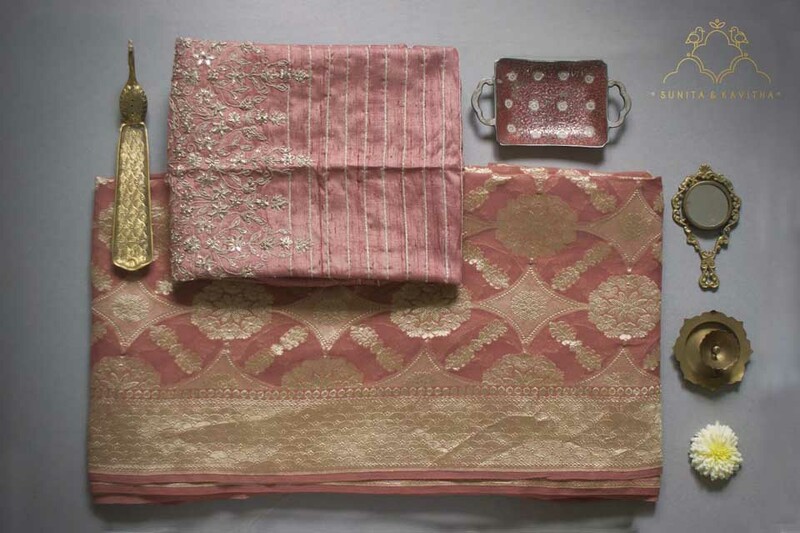 Perfect accessories for the saris on view in a wide range of prices. 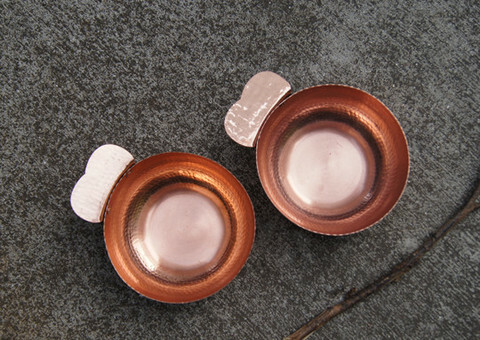 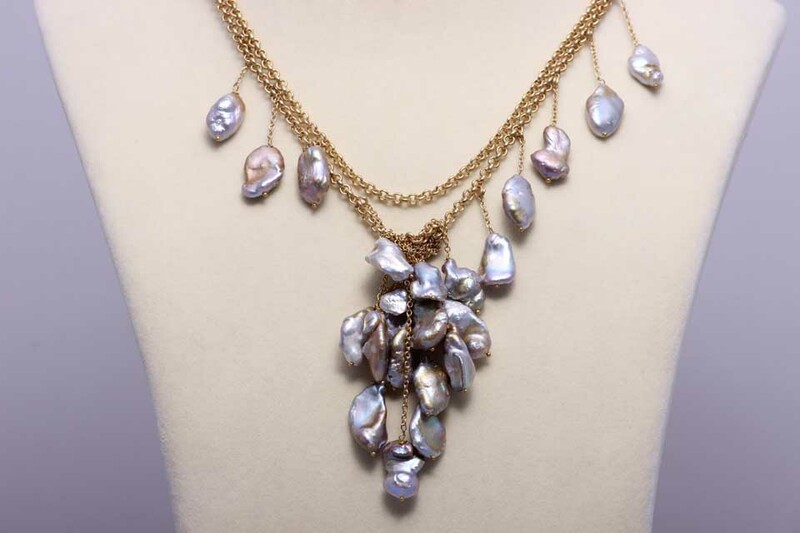 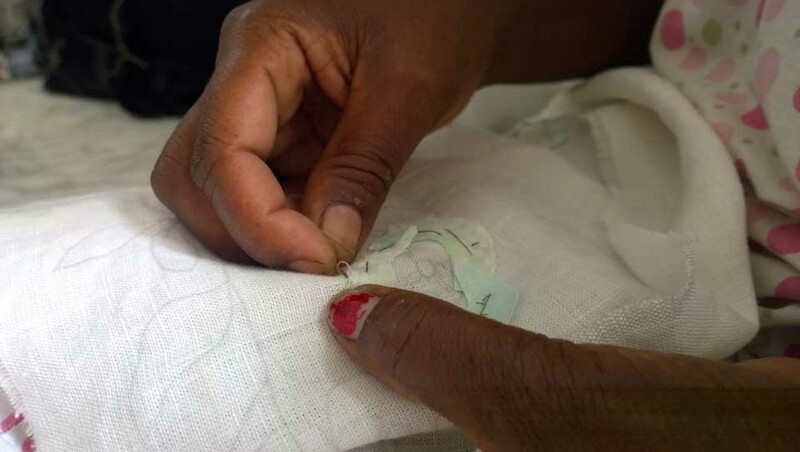 A commitment to zero waste ensures the use of left over pieces used to create new pieces. 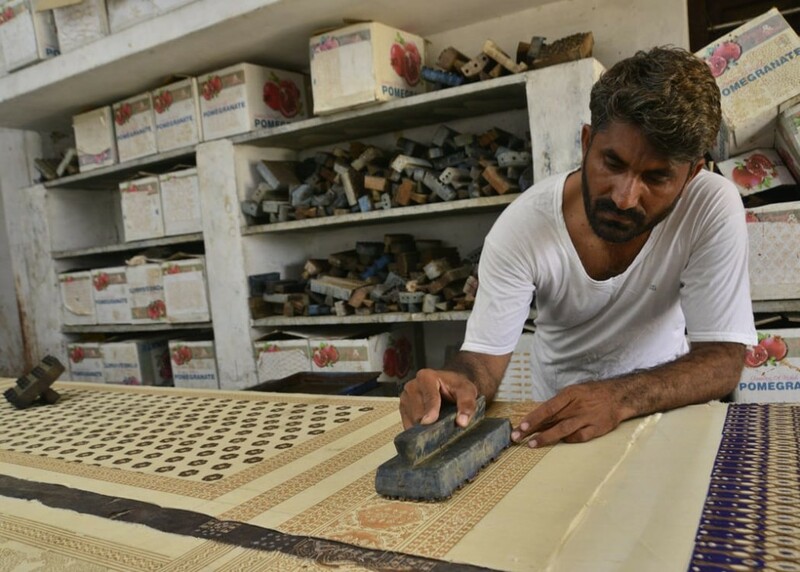 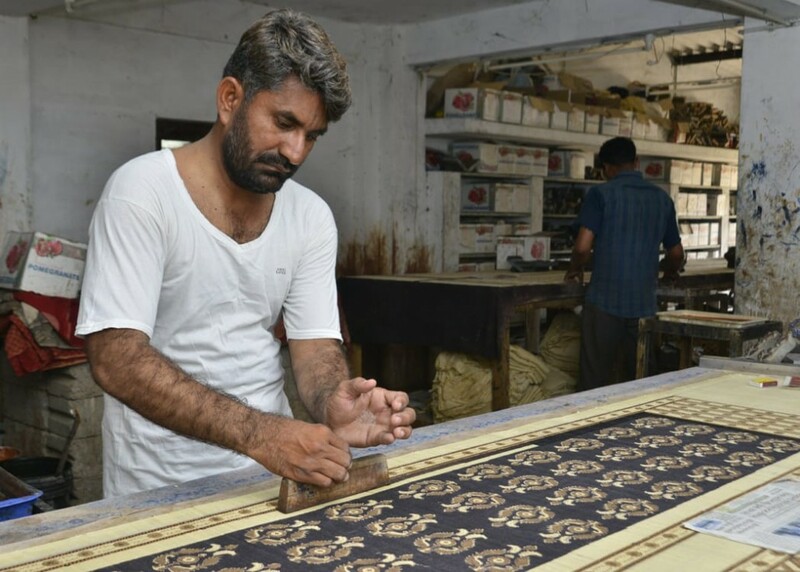 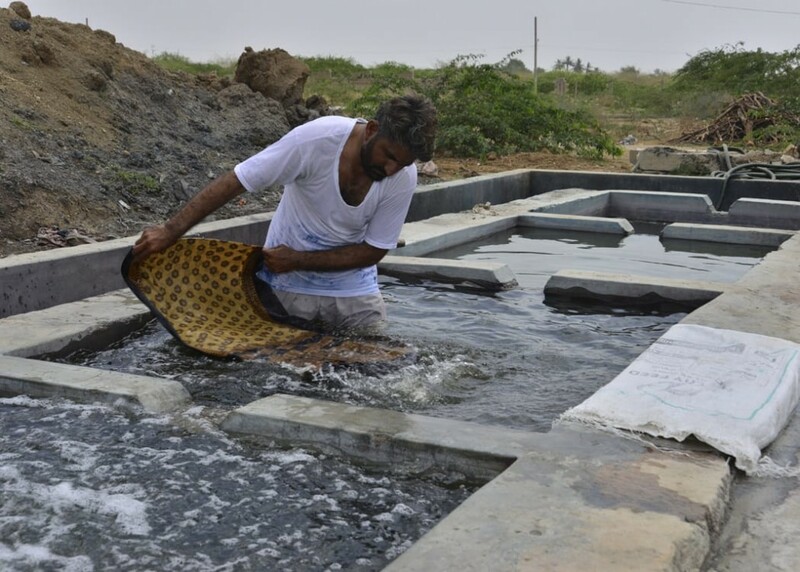 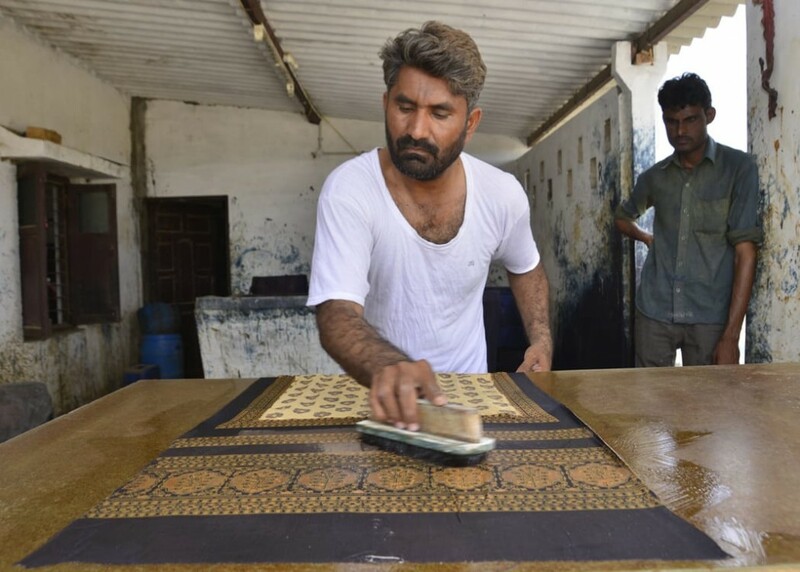 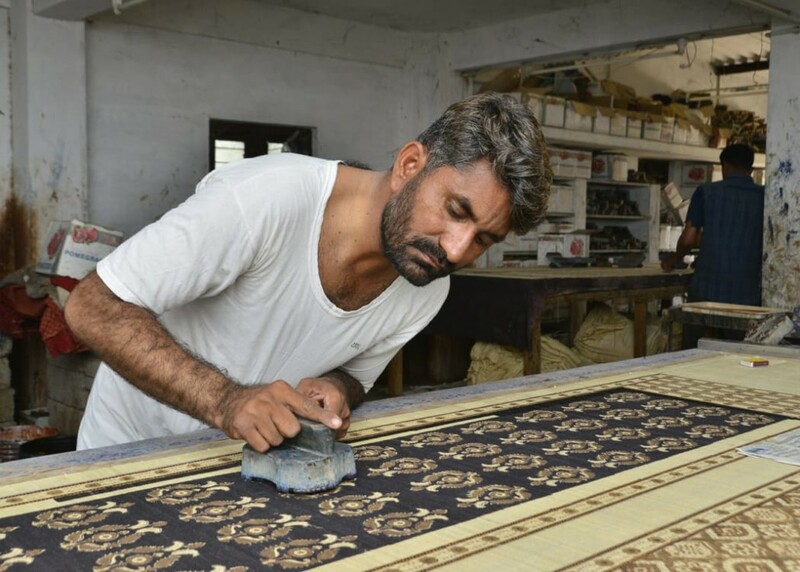 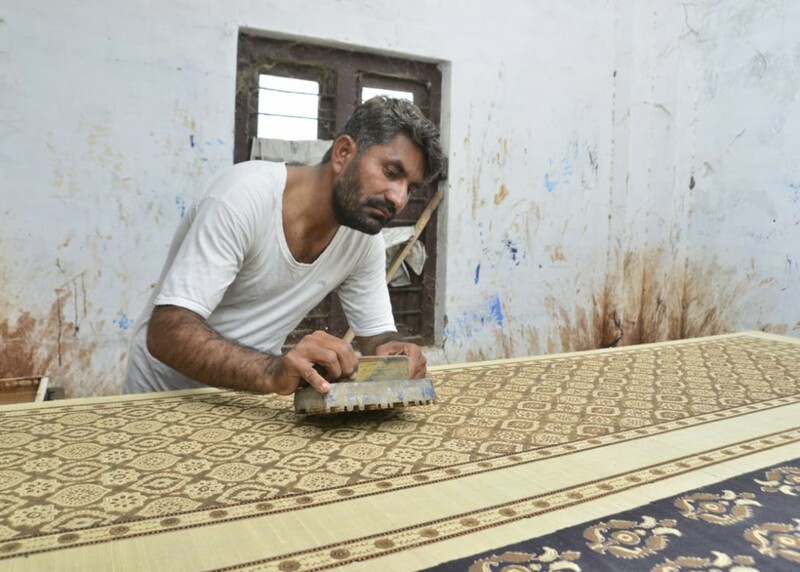 Brand built up by National Awardee artisan Khatri Abdul Rahim Anwar is ‘Kara’. 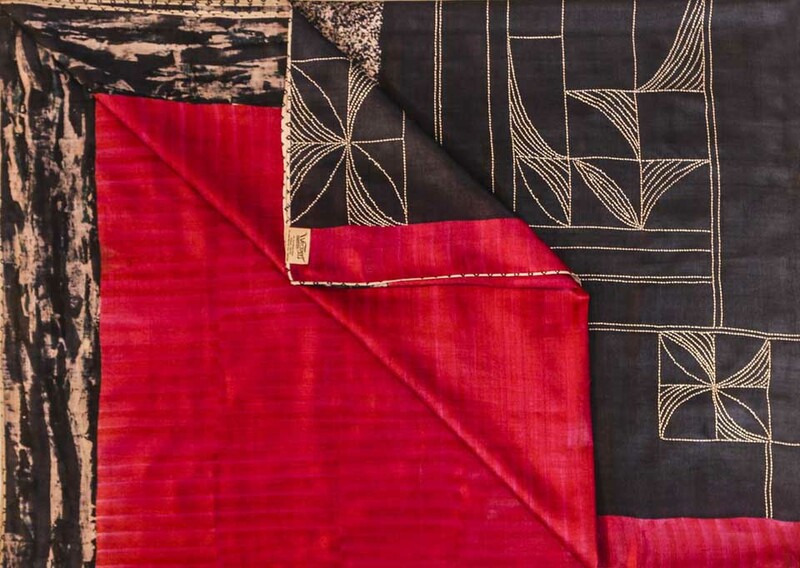 Traditional Ajrakh block designs are mixed with new block designs on Gajji silk, raw silk and Chanderi stoles, saris, dupattas with dazzling effect. 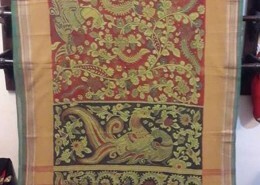 14th century. 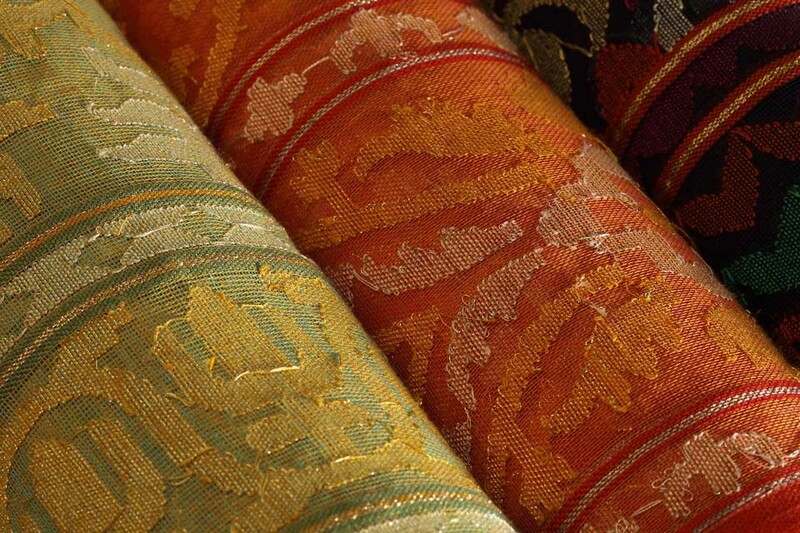 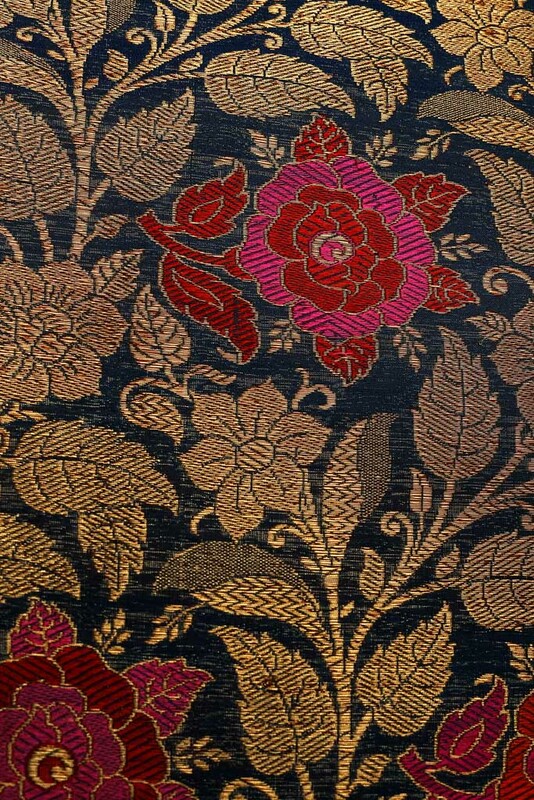 An extra weft figured fabric with a cotton base and a silk or art silk weave, himroo is ideal for luxurious effect. 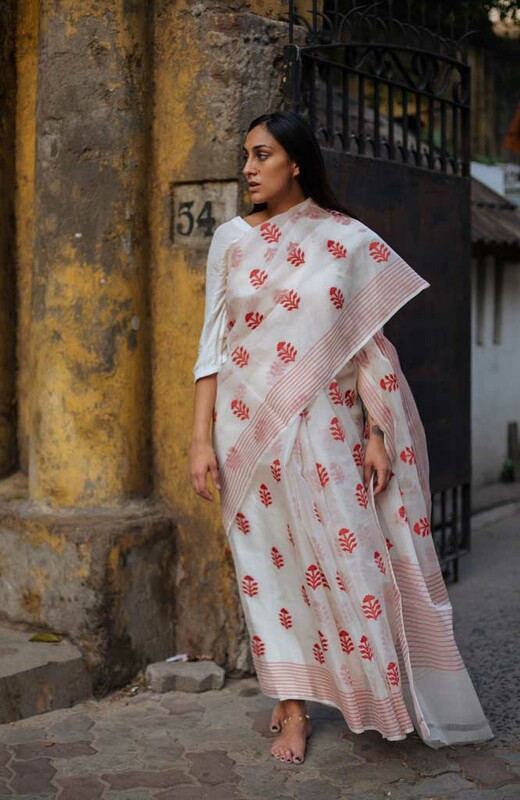 The designs are geometrical and inspired by nature like pomegranate, pineapple; and flowers like rose, ajanta lotus, jasmine; designs of floweringcreeper, leaves and stem which interlock sometimes to form intricate patterns. 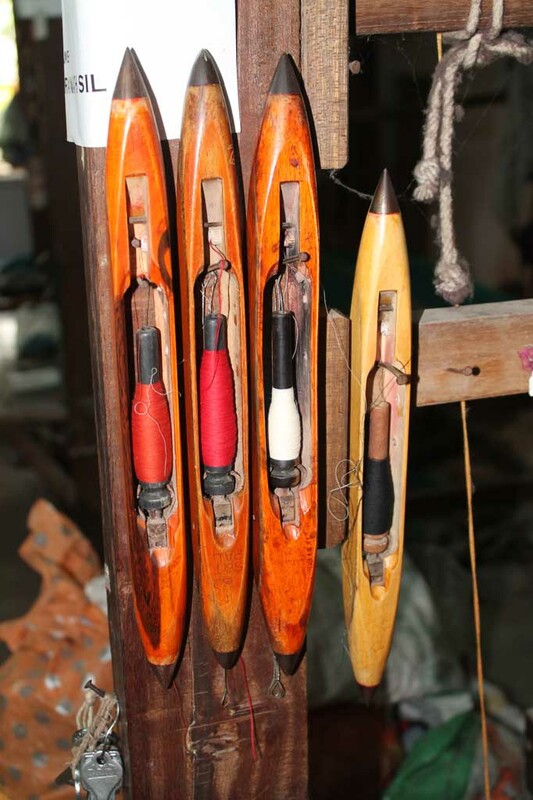 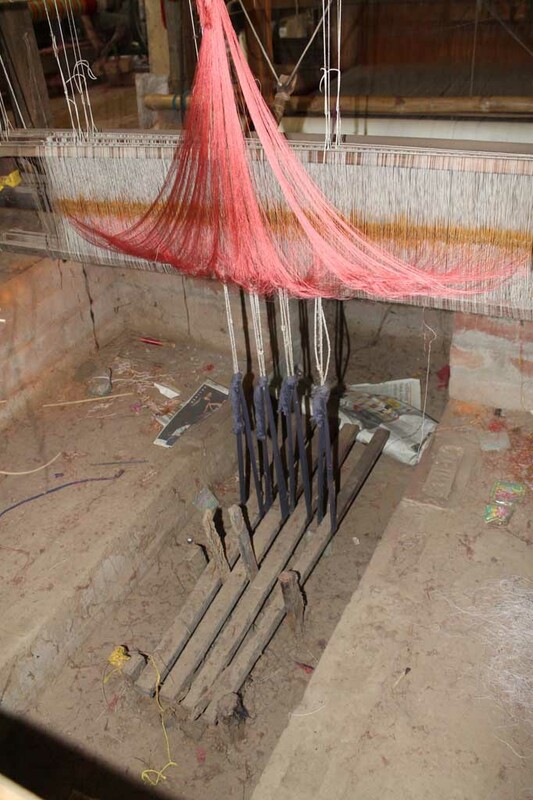 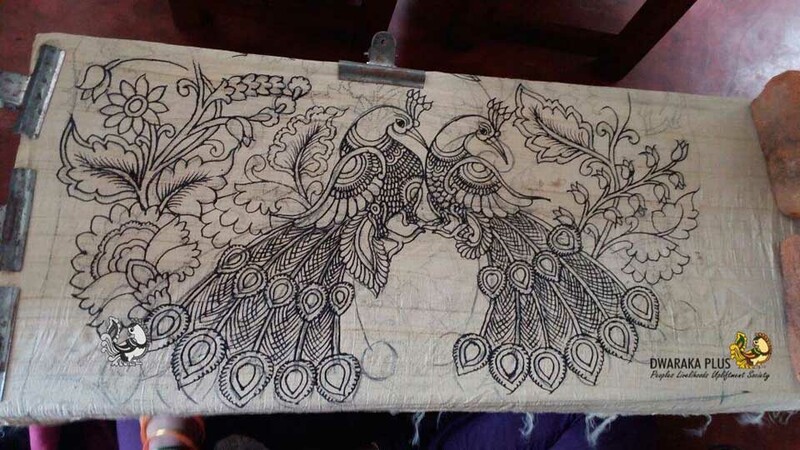 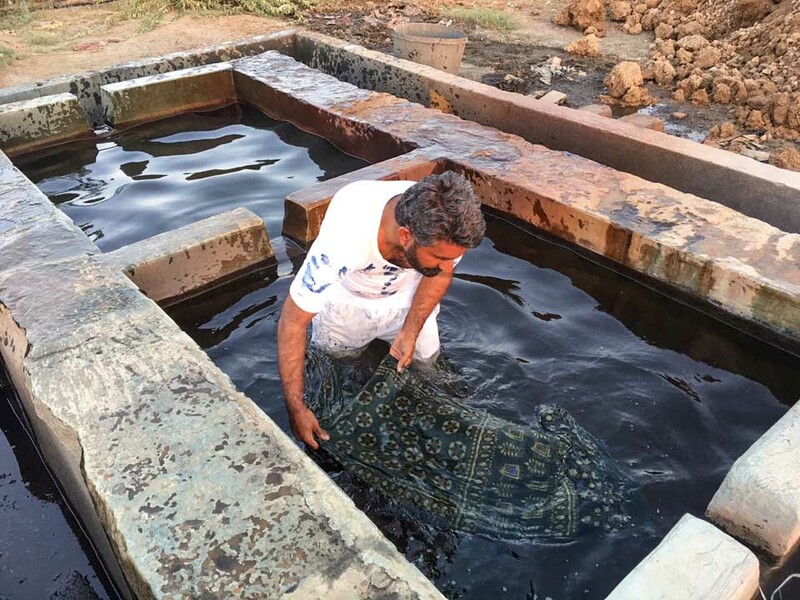 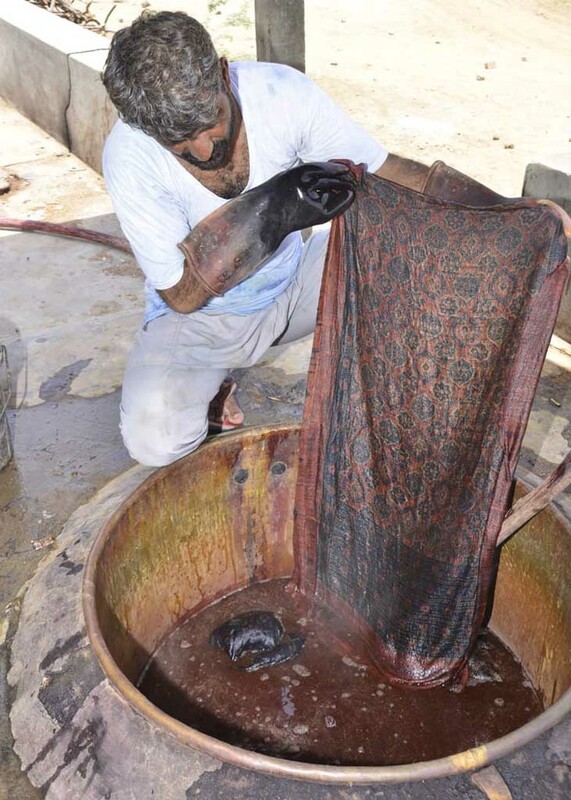 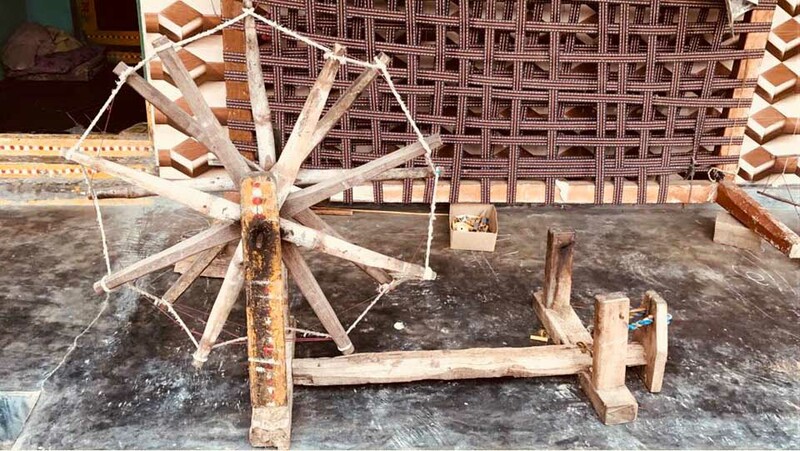 A languishing craft revived by Faisal Qureshi’s family of Aurangabad. 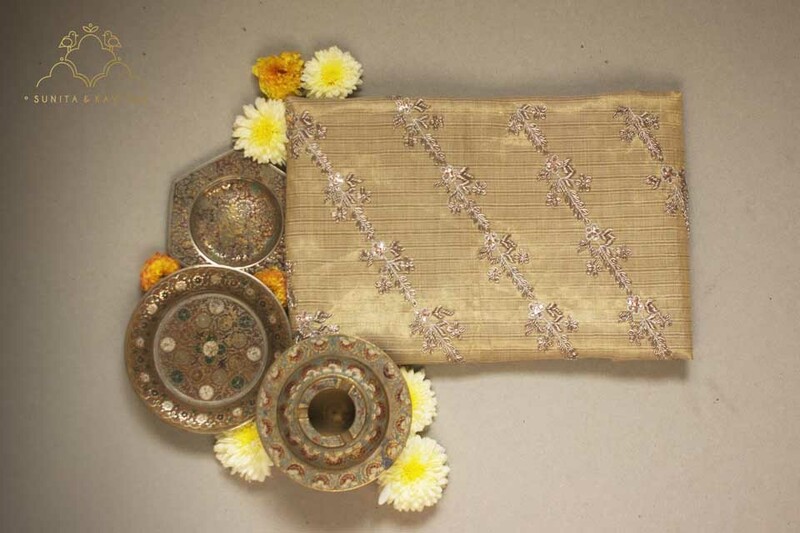 The family also revived the fabled Paithani which will be showcased at the exhibition. 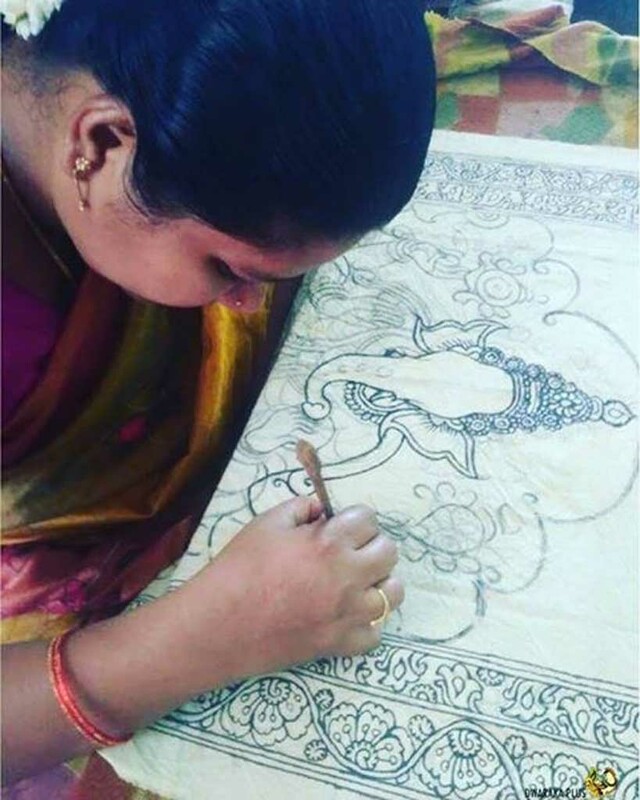 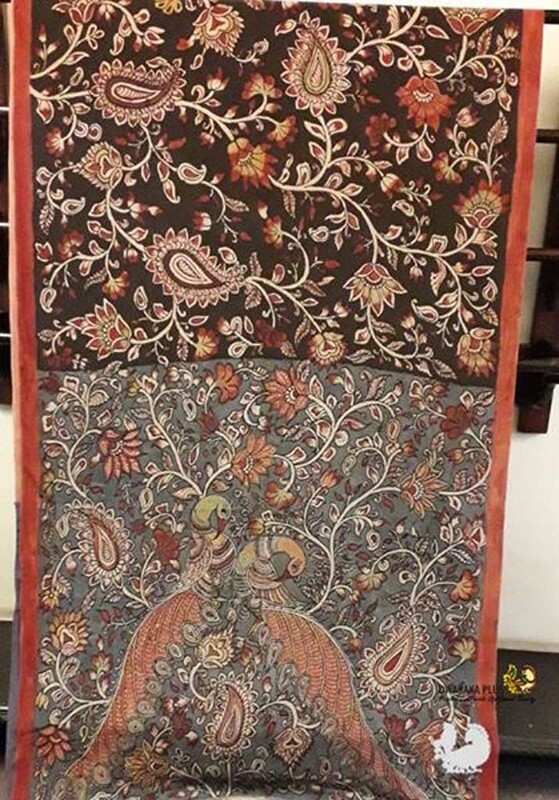 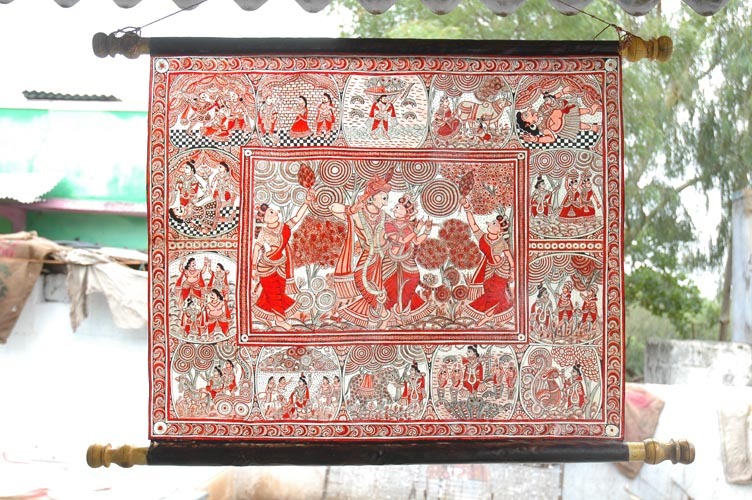 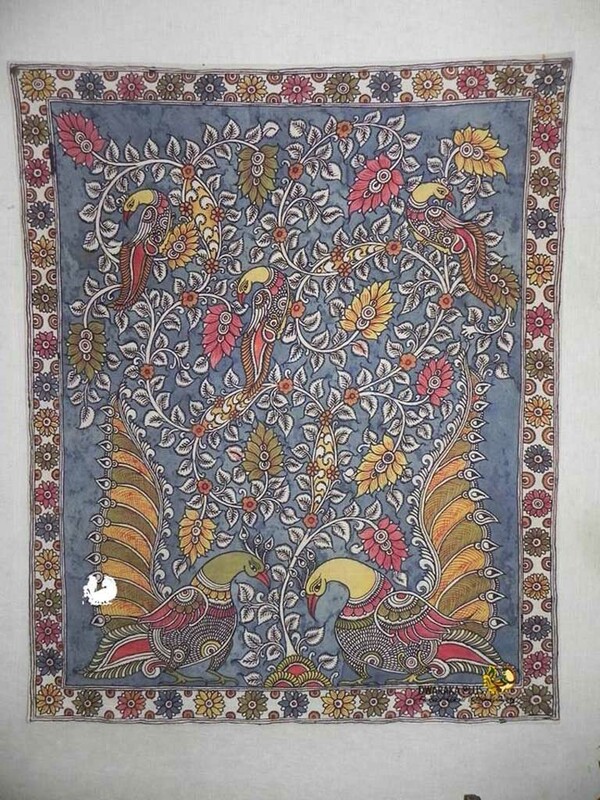 Established in 1998, Dwaraka soon began its revival programme of hand painted Kalamkari. 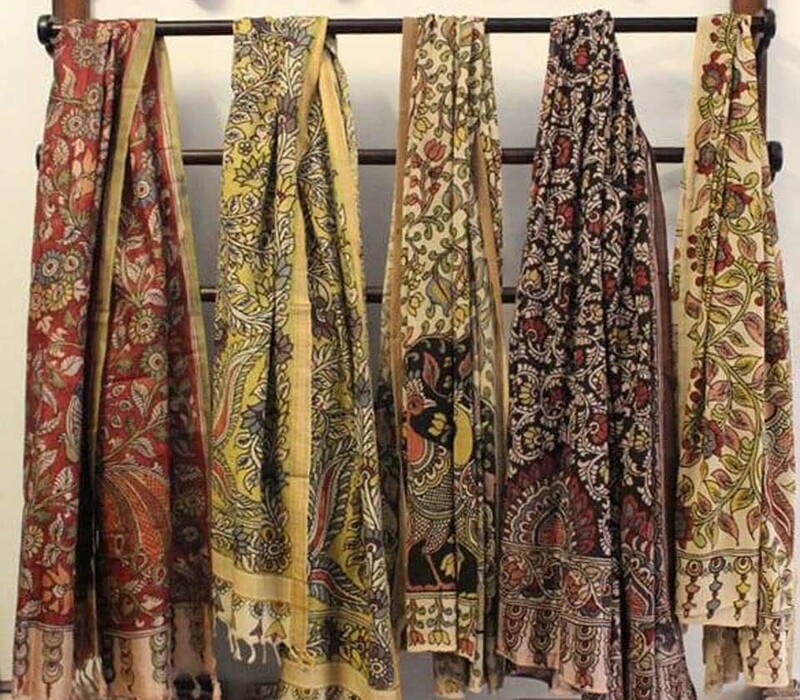 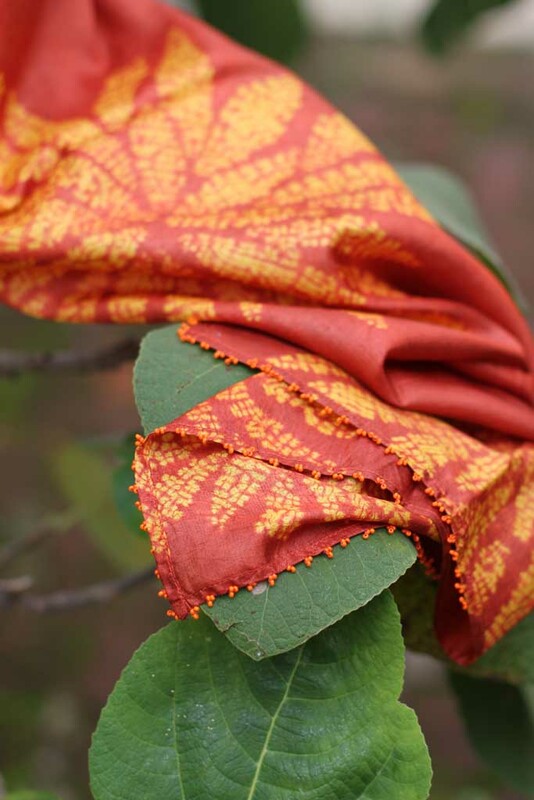 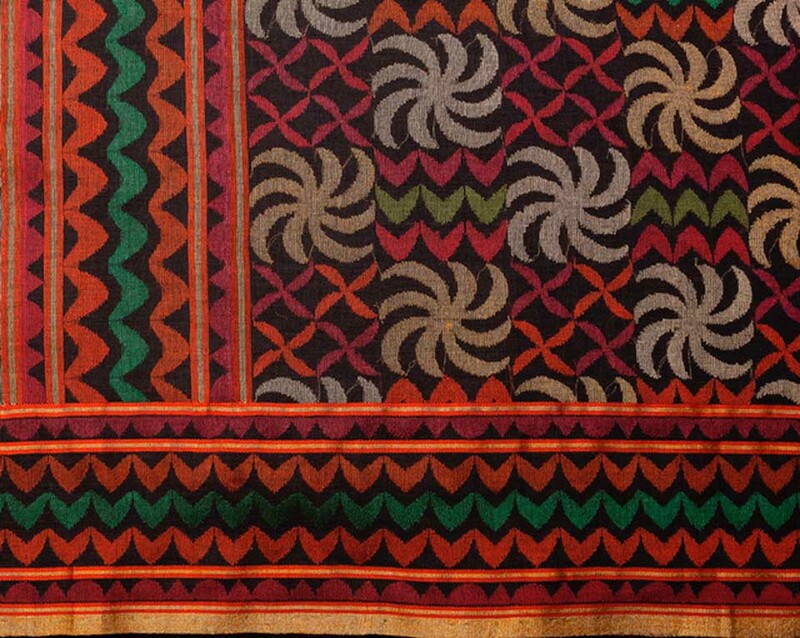 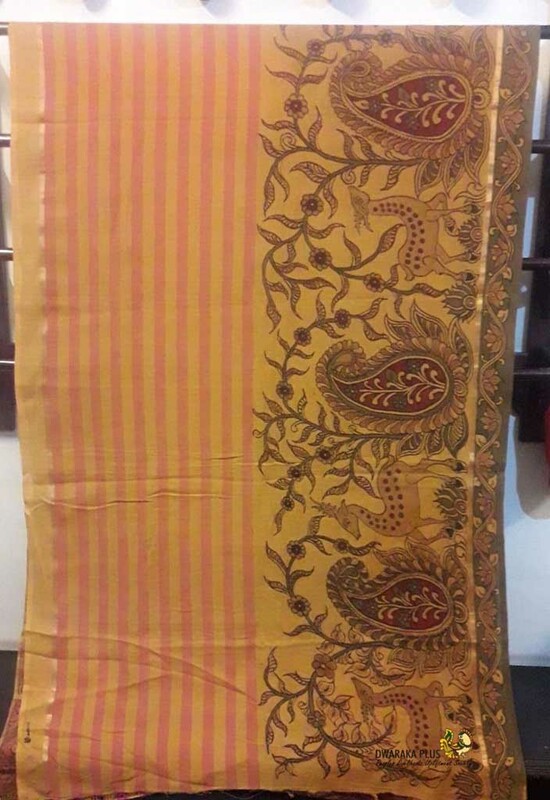 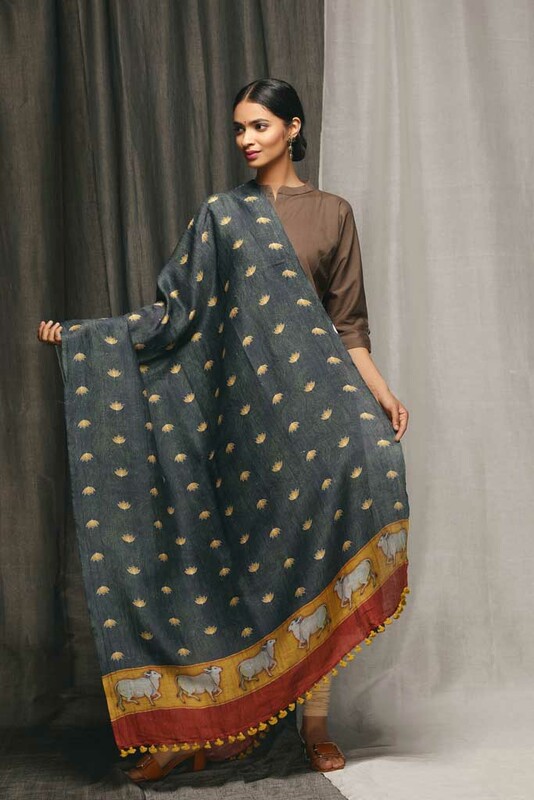 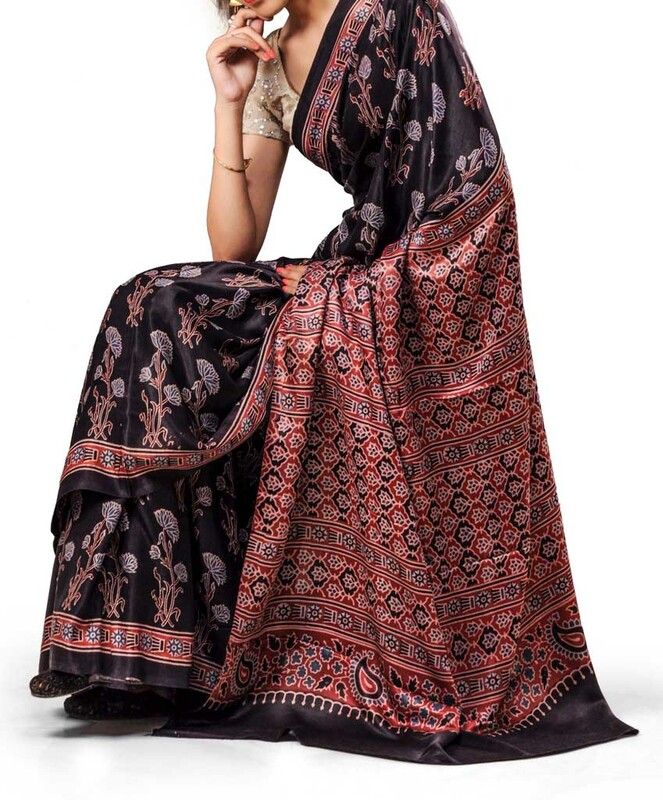 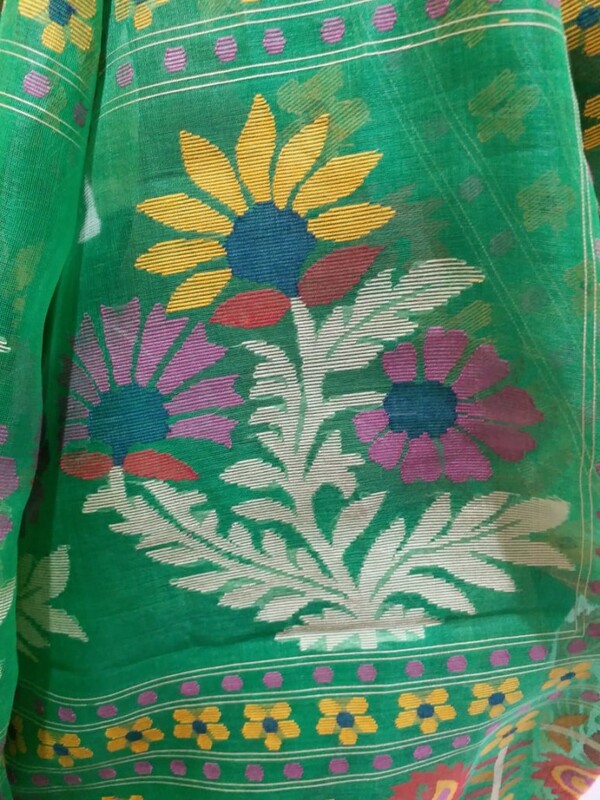 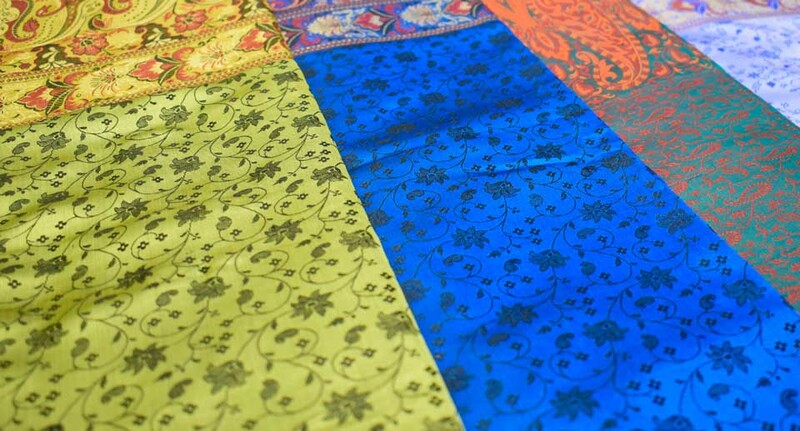 Today, ‘Dwaraka’ is a brand which uses Kalahasti Kalamkari art on saris, dupattas and stoles. 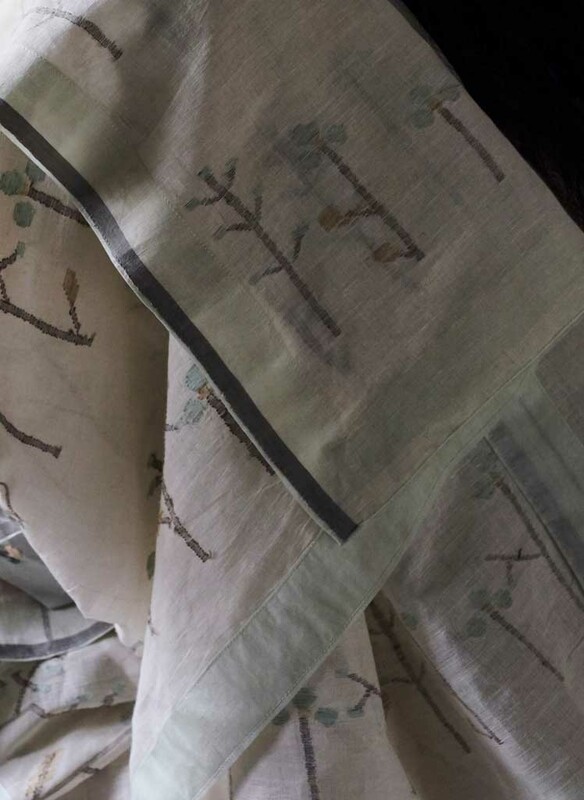 A mix of contrast colours, delicate flowers and leafy stems and motifs like peacocks and human figures make each sari a piece of wearable art. 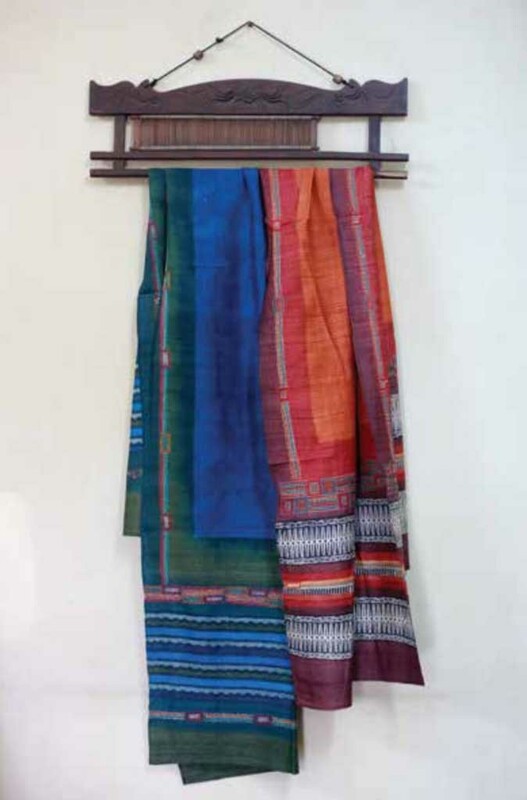 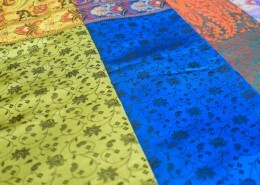 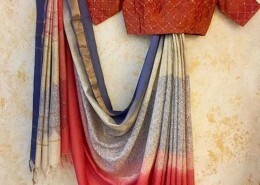 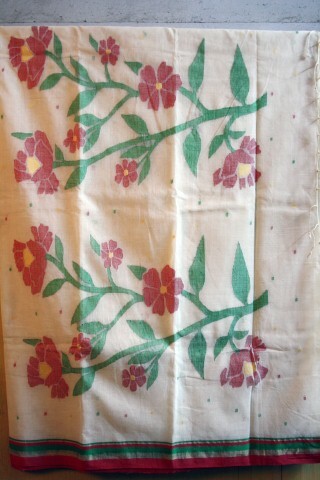 Linen, Chanderi and silk saris in lyrical colours of spring and autumn with pretty patchwork patterning. 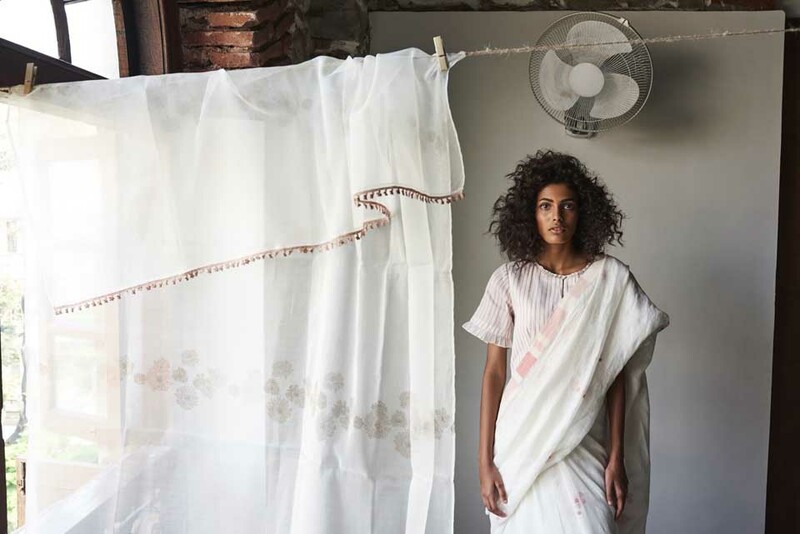 Epitomises her interest ‘being one with the environment’ in her love for linens. 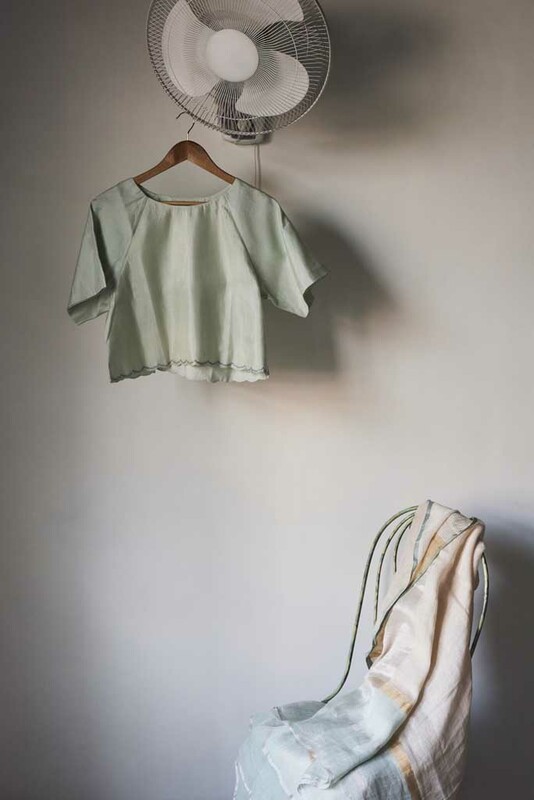 Anavila is amongst the pioneering brands to lead the fashion movement from cut-throat couture to simplistic pret. 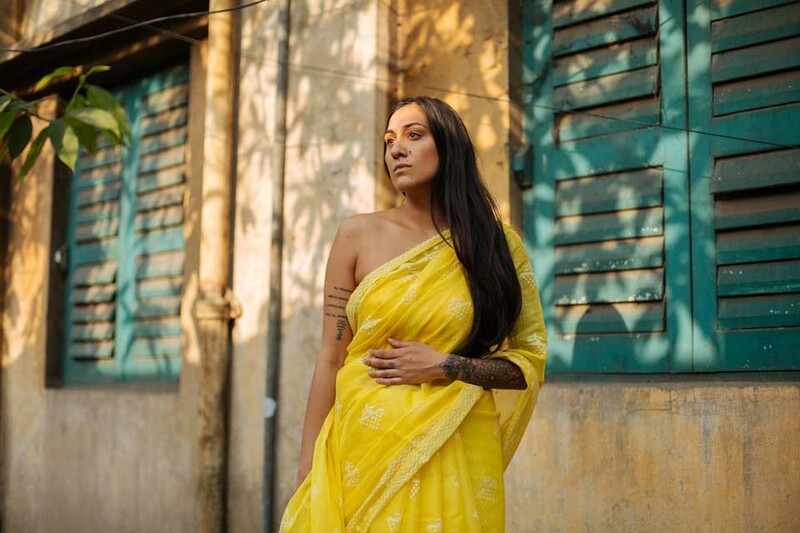 She was awarded the prestigious ‘Vogue Fashion Fund Sari Award’ in 2016.